Every year in winter I travel to India to spend some time with my family and friends. As you grow older this need manifests itself more strongly. 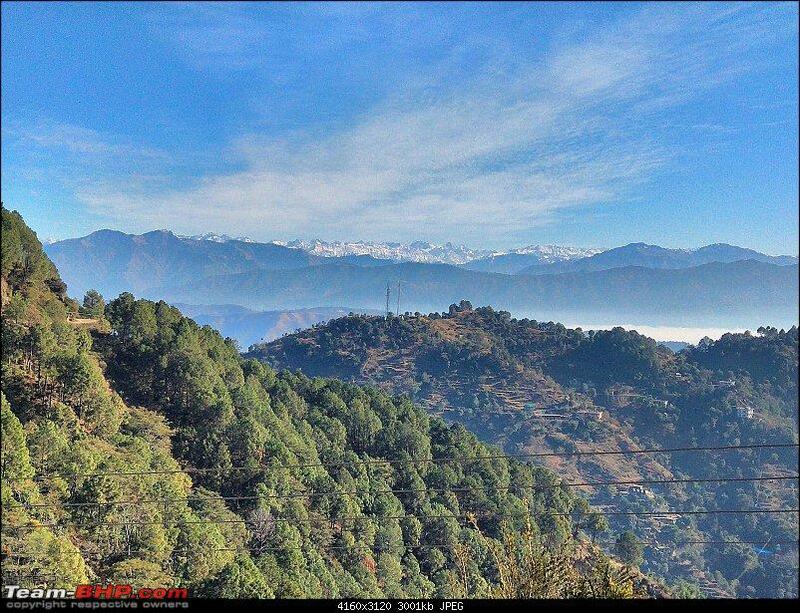 I’m aware that a number of travelogues have been written about various popular destinations in Himachal however this is a little different not only in terms of the kind of places that I planned to cover but also the objective. 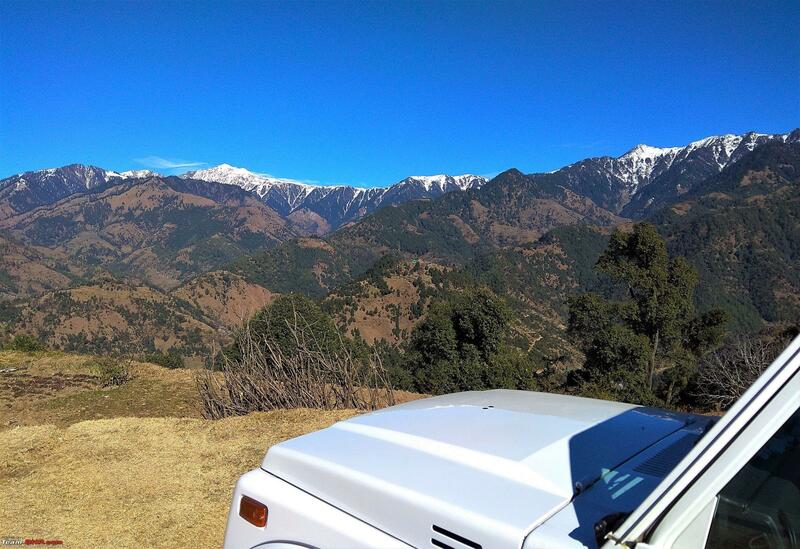 I planned to spend most of the time in driving from one destination to another and not indulge in much sight-seeing. Most of these places are a little obscure and maybe because of that these places have not been subjected to the kind of commercial exploitation that we usually see of our so called tourist spots; I hope I do not become the harbinger of change here. Having lived overseas for last 13 years I have become accustomed to the serenity and seclusion that some of these places still offer. 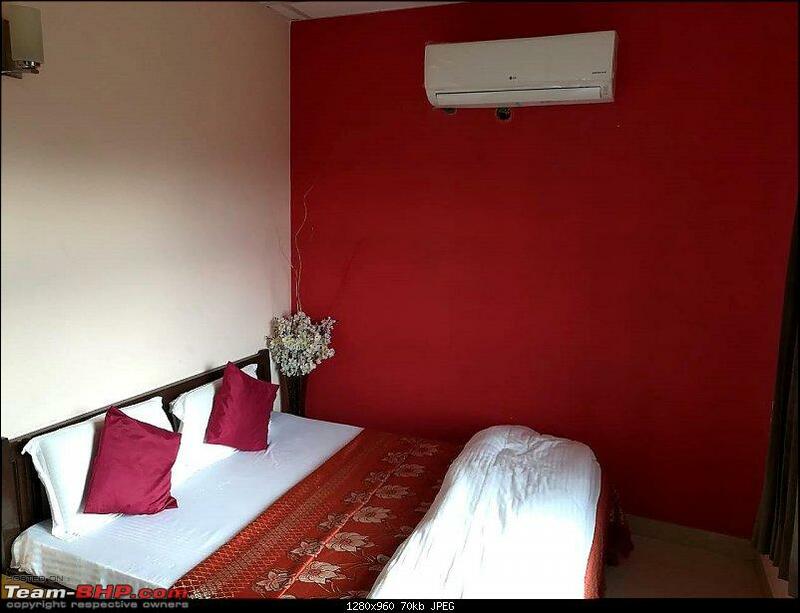 As some of you may know I bought a new Gypsy King in 2016 and one of the reasons that I look forward to my visit to India is to spend some with her as well (or so my wife claims). In last three years I have only been able to put approx. 4,700 kms. on the clock. 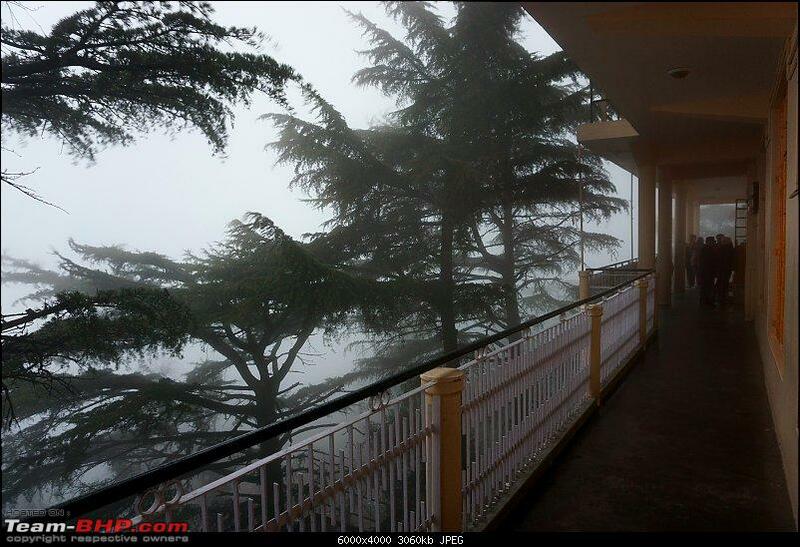 I was born in Shimla and have lived in Himachal throughout my school going years. Dad was an IFS officer (now Retired) and has served at various locations in the State during his early career and that explains my affinity with mountains and forests. 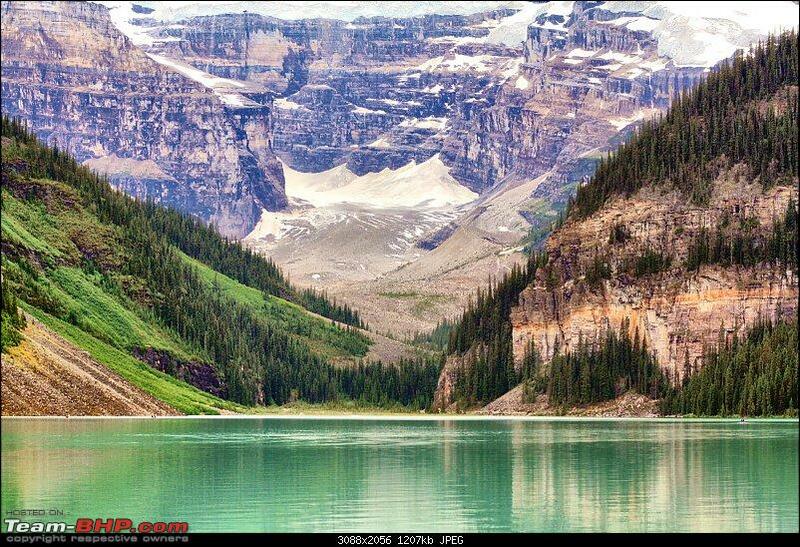 I relocated to Canada 13 years ago and have called Canada my home since. 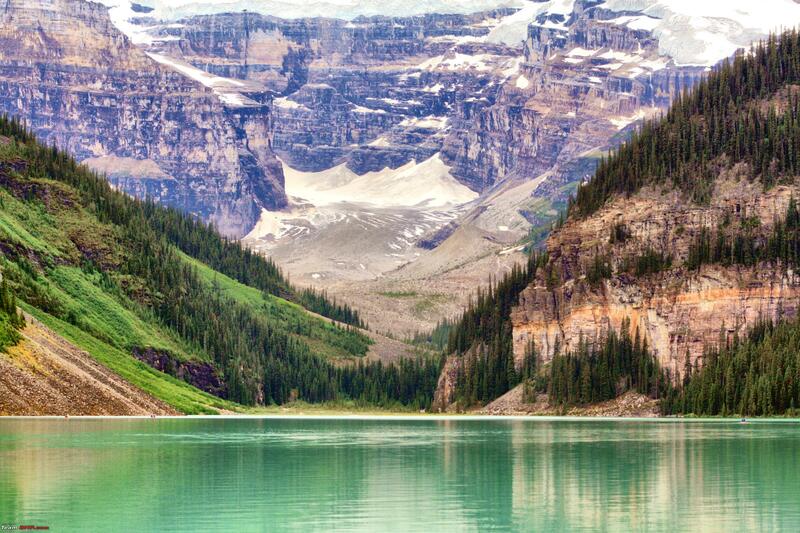 Canada though geographically a beautiful & diverse place with majestic Canadian Rockies, Prairies and Icy Northern Peninsula including part of the Arctic (yes, a trip to Prudhoe Bay, Alaska is planned sometimes in the future) the Himalayas tug at my heartstrings for they have a spiritual aura around them that no other mountain range can match. 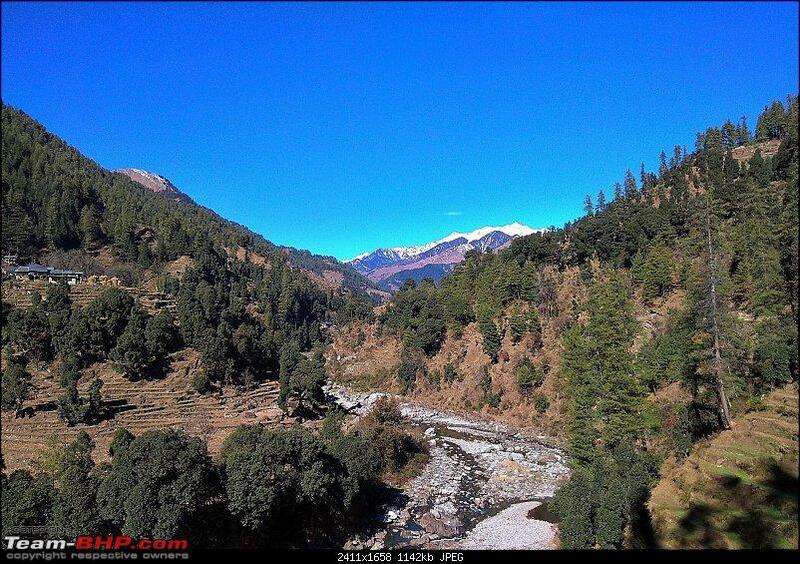 Incidentally the mighty Himalayas are also the only major mountain range that is increasing its altitude by approx. 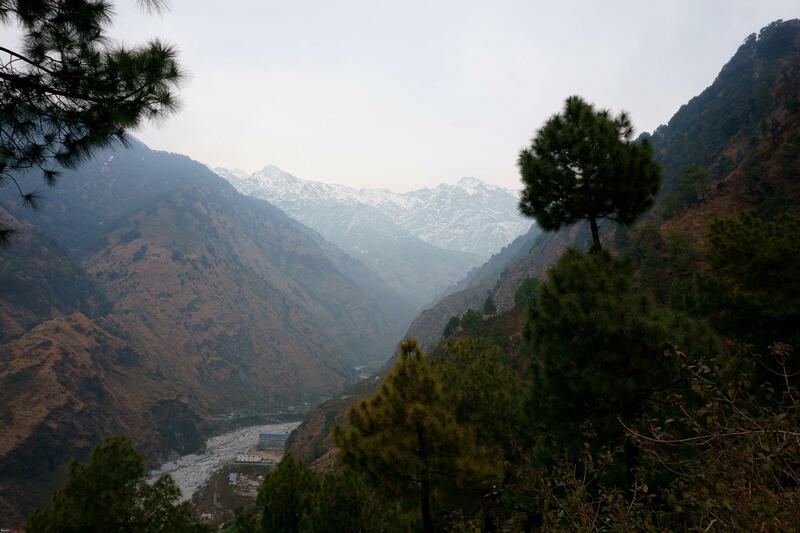 1 inch every year as the tectonic plates of the Indian continental land mass is pushing into the larger continental spread causing this mighty mountain range to increase its height . As I was sitting in my home office in Calgary on a chilly December evening with winds howling at -31C outside, I started doing some research as to where I can drive to for a 7/8 day trip while avoiding the popular/busy destinations. 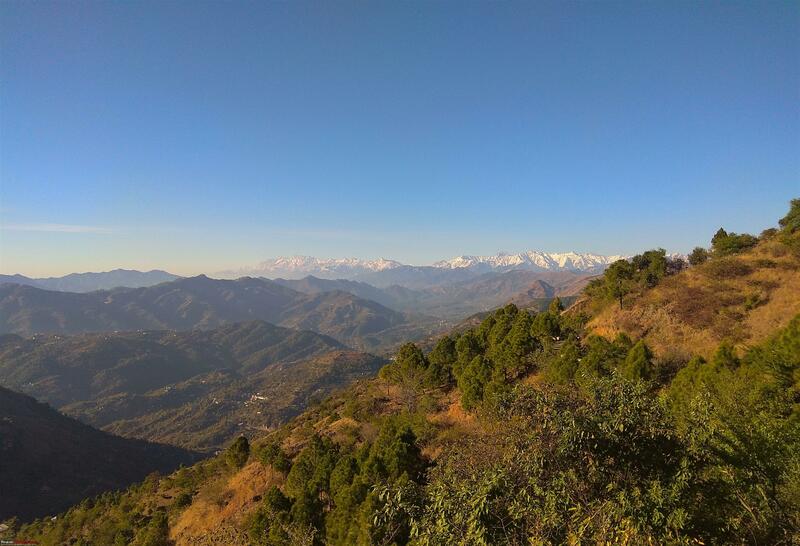 After doing my due diligence I narrowed down to Rewalsar & Barot in Mandi district, Gushaini in Kullu district, and Palampur (Dharamshala was added on later) in Kangra district. The idea was to drive at a sedate pace, take in the scenic environs, click a few pictures and taste some local cuisine while doing some introspection about where my life is headed. I then made a list of things to be carried from here; a GoPro was ordered along with a couple of fat Delkin mounts, SD cards along with ND filters & circular polarizer. I landed at Chandigarh airport after a grueling 23 hour flight (including a brief layover at Frankfurt & Delhi) where my parents picked me up and we drove to Shimla. 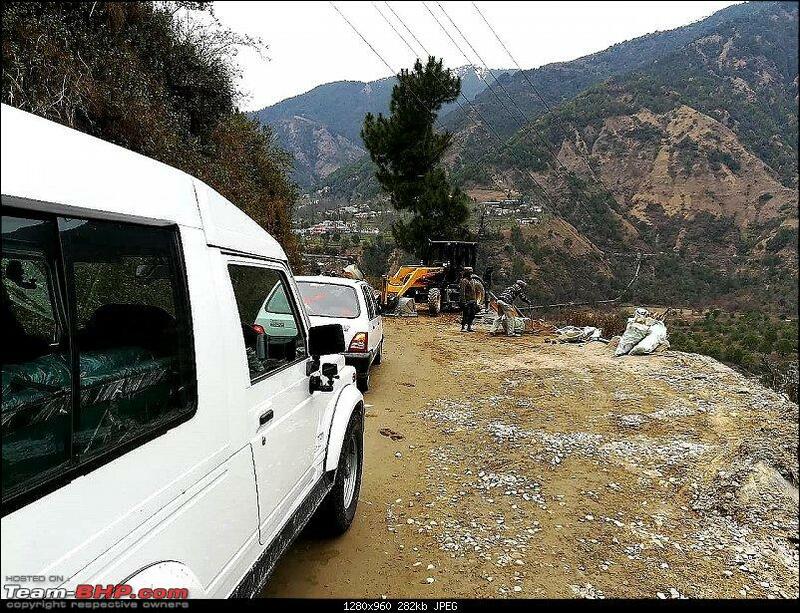 Folks who have done this stretch in last couple of years must have endured the torture of driving the under construction Kalka Shimla highway. What once was a beautiful, reasonably quite two lane highway is now full of cars/SUVs of various kind driving at unsafe speeds and their drivers with scant regards for some simple rules of hill driving but I guess this is the sign of the times. 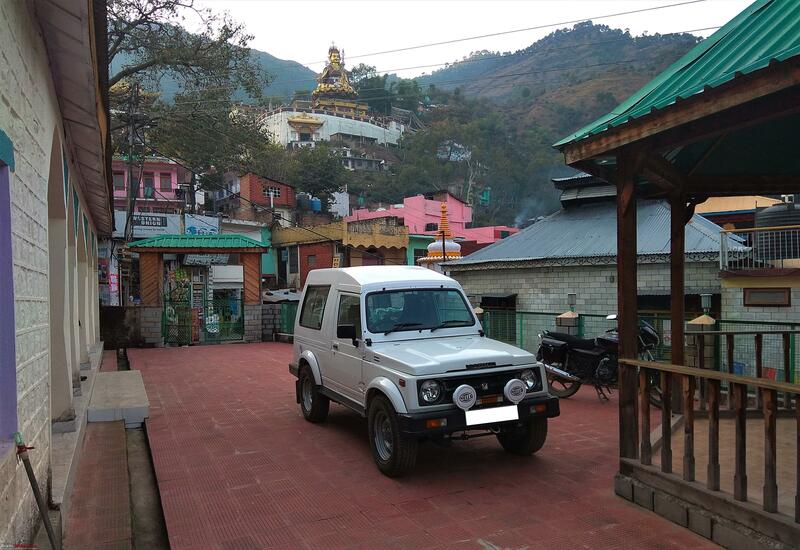 I reached Shimla after a brief stop over at a small dhaba in Dedhgharat a few kms from Solan. We have been stopping here for some great bread omelette and ginger tea for last 35 years. The owner who is now grown old and doesn’t usually man the counter now, instantly recognized dad and made an exception by making the fabled bread omelette. I devoured it with some ginger tea and headed out to Shimla. The traffic was not very heavy thankfully and we made it to Shimla in all of three and a half hours from Chandigarh. I had planned to relax for a day and get some work done on the vehicle the next day before heading out on the trip. 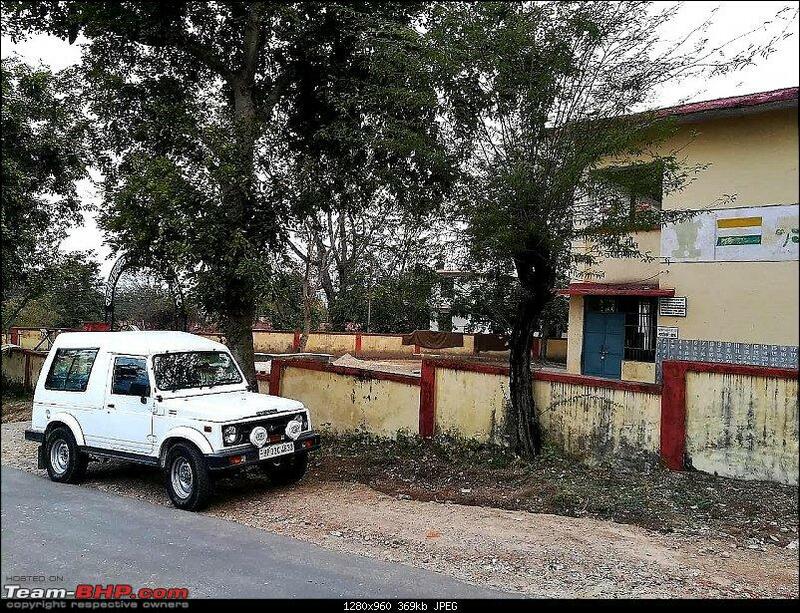 I also realized that Gypsy has been parked for more than six months and had not got an oil change since May 2017 plus the change of transmission/transfer case/differential oil was also due although the vehicle just had 4,700 kms on the clock however it was already 3 years since the purchase of the vehicle & Maruti recommends these fluid changes every two years or 20,000 km whichever is earlier. 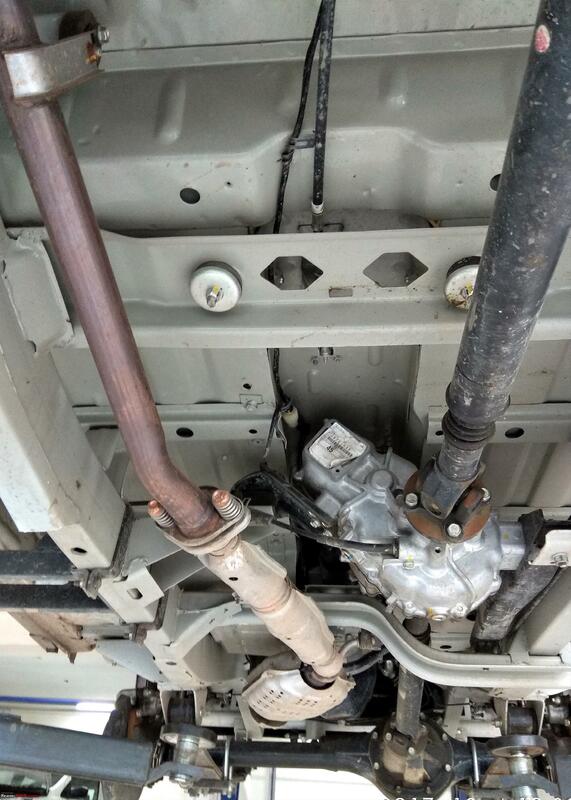 Therefore, the first thing that I needed to do was to complete the said fluid changes and get a general inspection of the vehicle done. 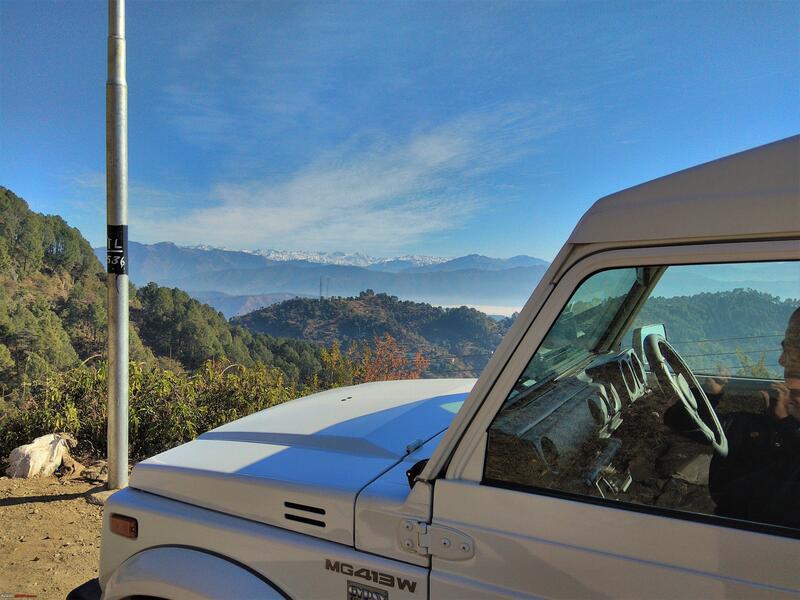 Next morning I took the Gypsy to Mohinder a.k.a. Minnie, the top Gypsy specialist in Himachal; he’s a quite a legend among local Gypsy aficionados as well as “Raid De Himalaya” participants and knows Gypsy inside out as probably no one else does at least in the North India. I requested him to take a look at the under body and also carry out a general inspection. 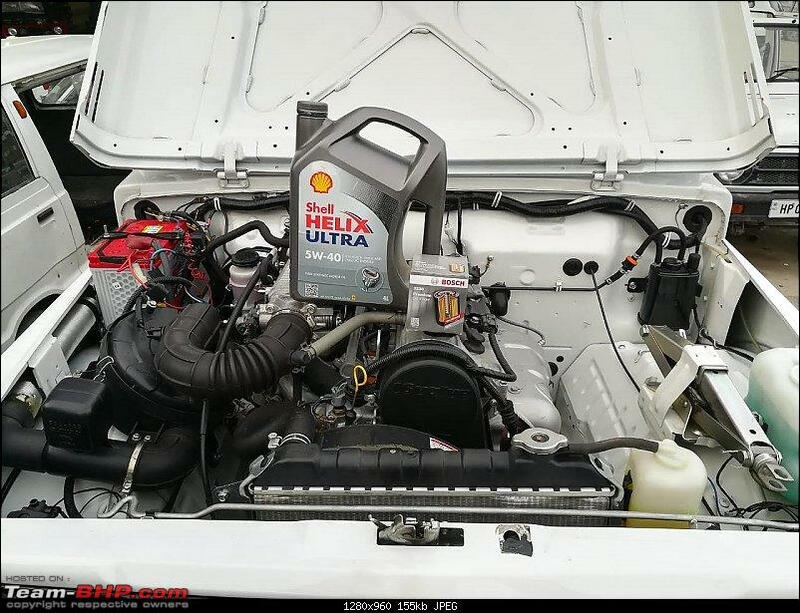 I had a jug of Shell Helix Ultra 5W-40 for the engine and 8 ltrs. of Shell Spirax 80W-90 for the transmission, transfer case and front & rear differentials. All the fluid changes were completed and a general inspection of the vehicle was also completed in a couple of hours. 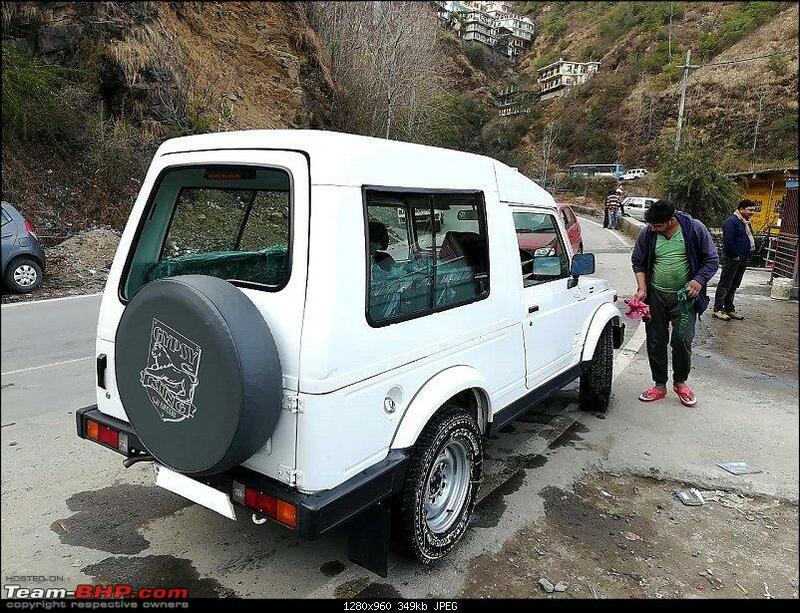 I then took the vehicle for a car wash to one of my favourite joints (Mukesh at Pal Washing in Shanan on Shimla Bypass road) and the car was given a thorough wash with shampoo and duly waxed afterwards. During my way home I filled her up at one of the trusted gas stations (very important in India) and I was all set for the much awaited journey the next day. An important caveat; the pictures taken are a mix of cellphone & the camera shots so my apologies in advance for some grainy compositions. I along with my brother Vivek started at 0800 to beat the office rush and we were out of town by 0830. 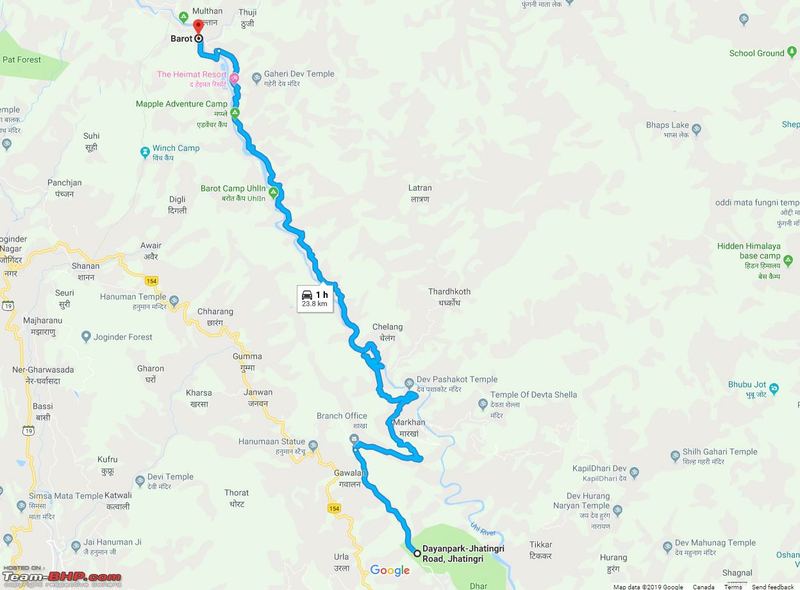 The drive from Shimla to Rewalsar goes via Bilaspur & Sunder Nagar and one needs to turn left from Ner Chowk which is 15 kms from Sunder Nagar. One needs to drive on State Highway 205 that becomes Highway No 154 from Nauni near Bilaspur. 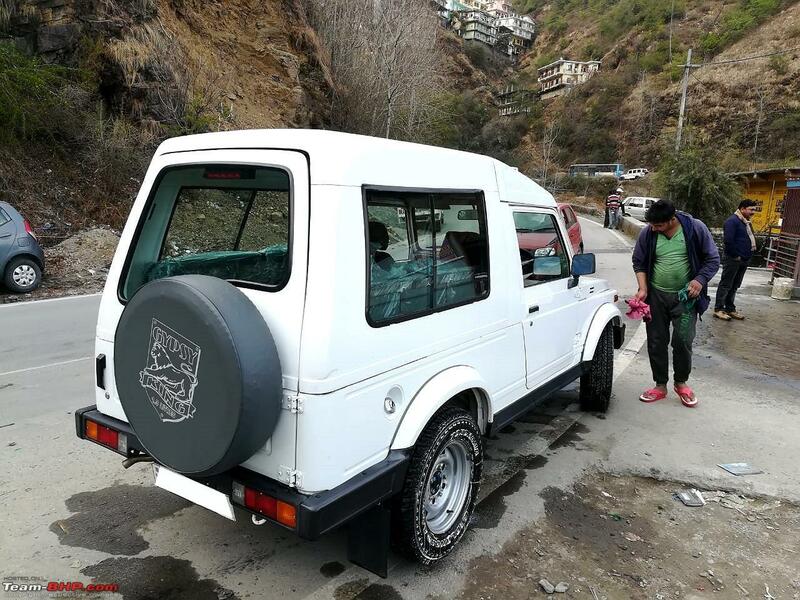 The stretch from Dharlaghat to Namhol was badly broken on account of plying of overloaded trucks that ferry the cement from the Ambuja cement plant in Darlaghat. After Namhol the tarmac was smooth and I tried to increase the pace just a vee bit more however soon came upon the realization (that’s’ what happens when you become accustomed to driving slightly more powerful cars on smooth highway stretches in the Rockies) that Gypsy is not meant for hustling around the corners. In any case we were not in a terrible hurry. 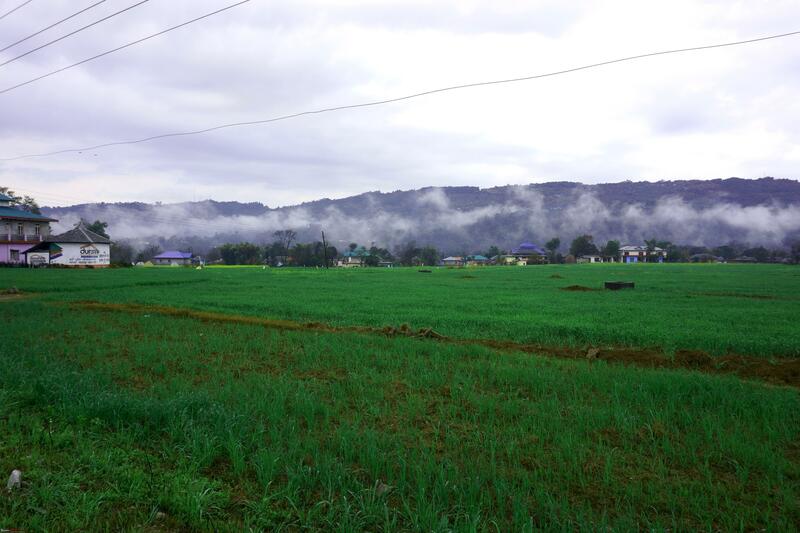 I took a detour by turning right at Brahmpukhar thus avoiding the Bilaspur town. We stopped at a decent looking Dhaba before Ghaghas to grab a bite. While eating out during one of these trips in India I have a strict rule that I religiously follow to avoid getting into trouble. You may also follow it if you like. I ask the dhabwalah for yellow dal and roti. He then needs to put a tadka of onion and butter and bring the dal to a boil. Now if the dal is stale it will immediately give off a bad odour. 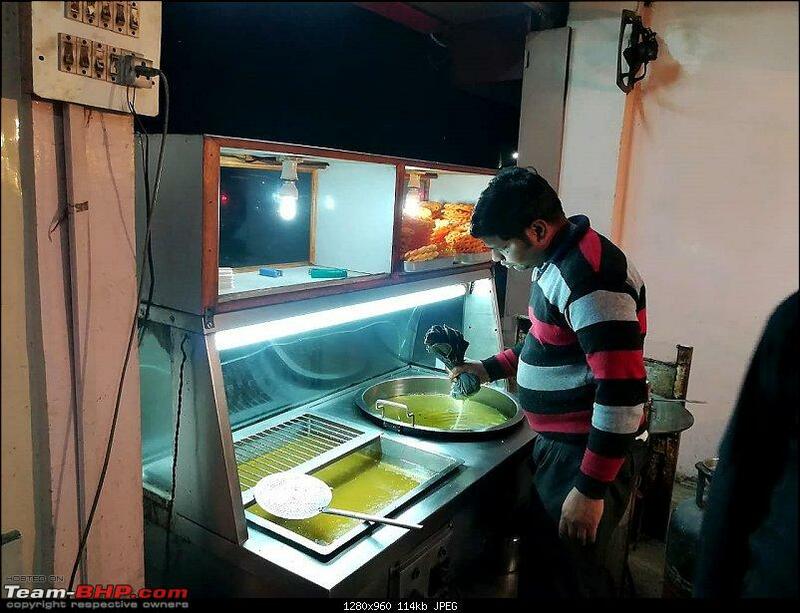 Rotis have to be made fresh anyway. I stay away from non vegetarian food and also other delicacies such as mix vegetable (likely to have all the left over vegetables from the previous day) or black dal/paneer etc. I also eat light as a full stomach is likely to induce drowsiness that is not very helpful while driving on hills roads or on any road for that matter. 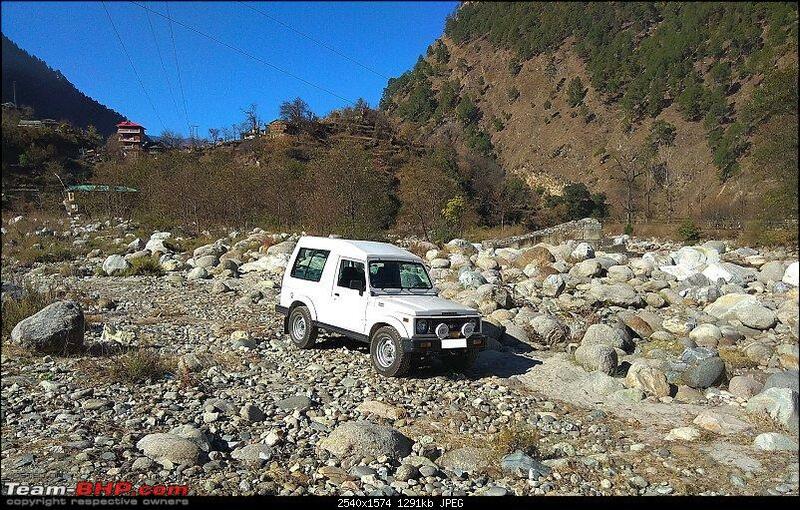 After leaving Ghaghas I turned right and in a couple of hours crossed Barmana & Sundernagar. You really have to keep your eyes peeled for the left turn at Ner Chowk for Rewalsar. From Ner Chowk onwards the tarmac was broken again for a few kilometers. 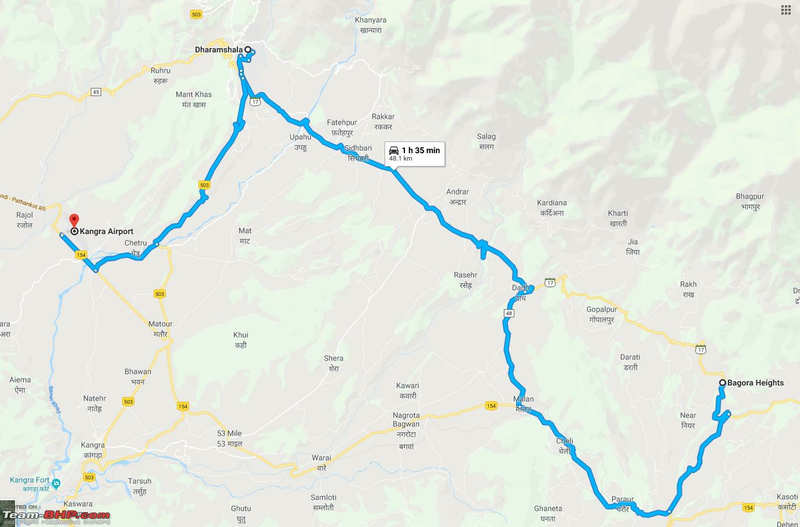 There is a steady stream of traffic from Punjab on this narrow stretch of rural road of folks who are headed to Mandi/Manali in addition to visiting the Gurudwara at Rewalsar. 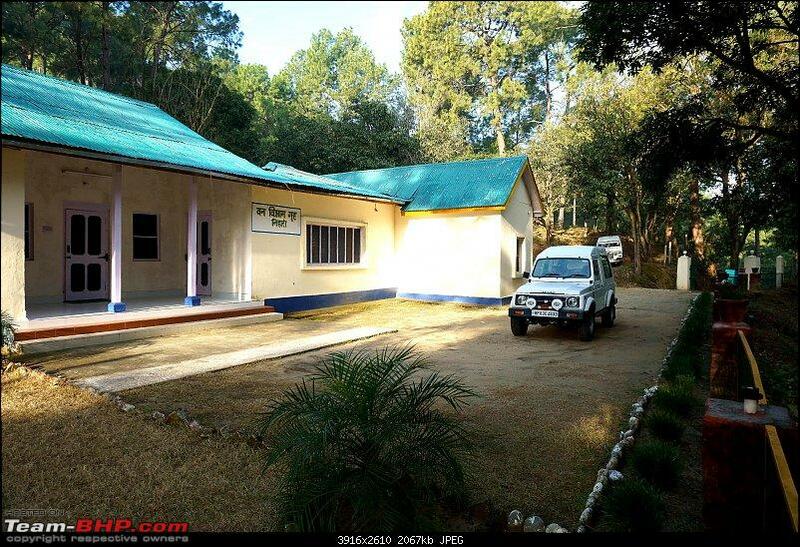 By 5pm I had pulled in to the forest rest house at Rewalsar which was oddly located bang in the middle of town. I found this highly unusual as normally the forest rest houses are located away from the town. 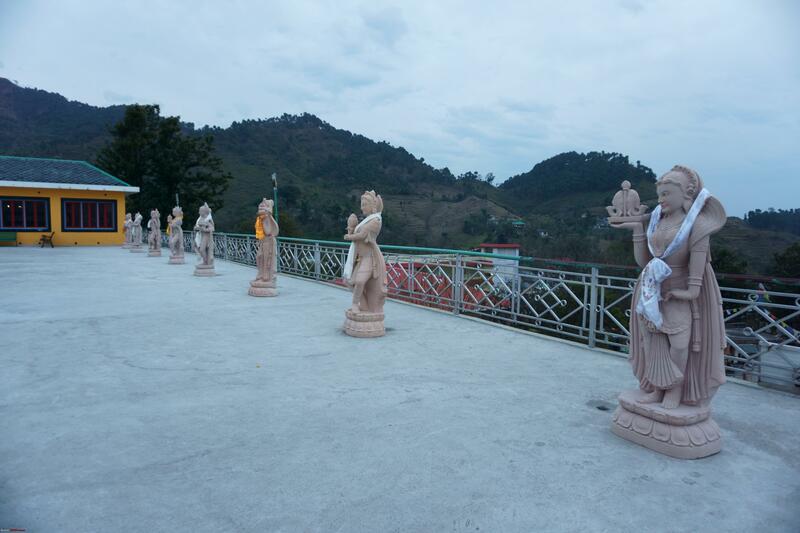 I had somewhat interrupted view of the lake and of the giant Guru Rinpoche statute on the hill. 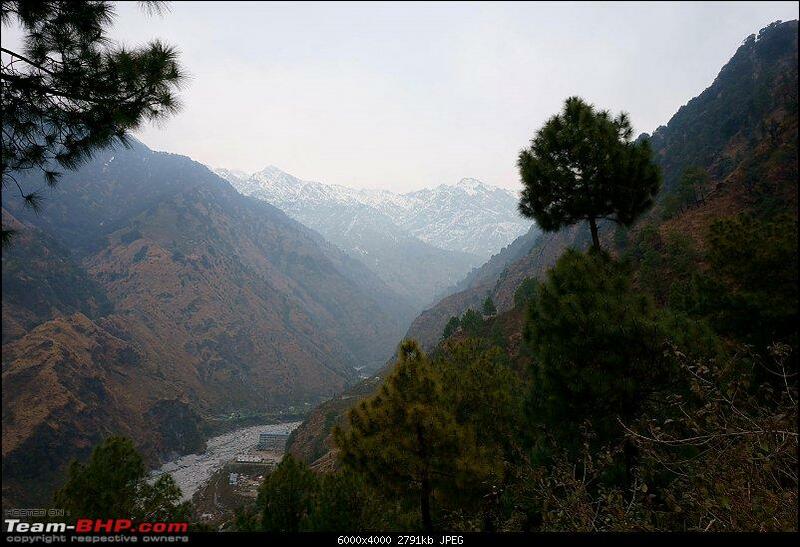 Rewalsar is a small town in Mandi district and has religious significance for the followers of Hindu, Sikh and Buddhist religion. Rewalsar also finds mention in “Skanada Purana”. 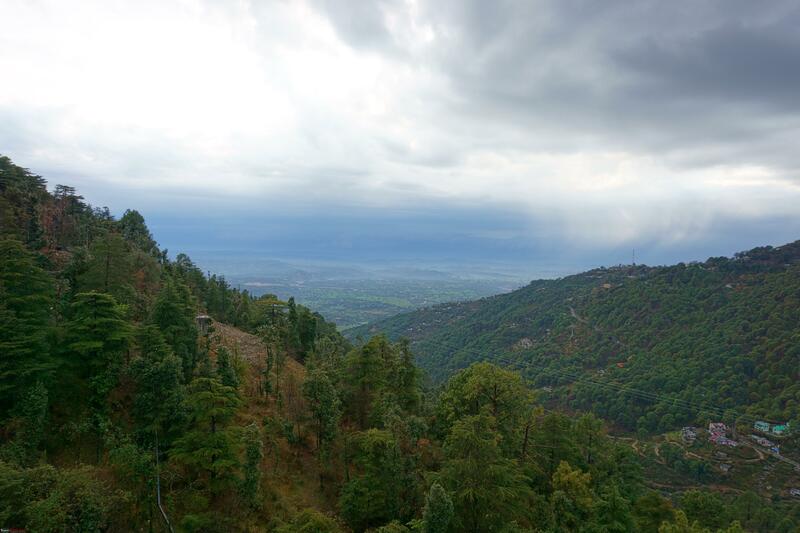 Guru Gobin Singh had also visited Rewalsar where he consulted the rulers of the hill state to seek support in his campaign against Mughal emperor Aurangzeb. 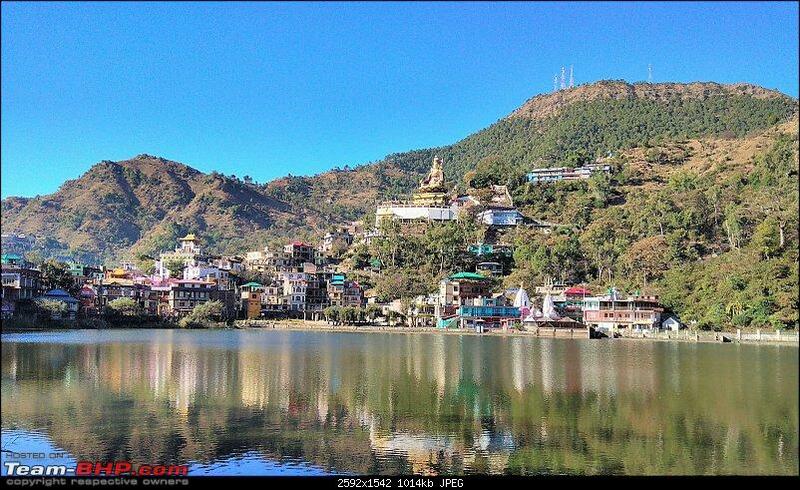 There is a giant statute of Padmasmbhava also known as Guru Rinpoche on the hill overlooking the lake. 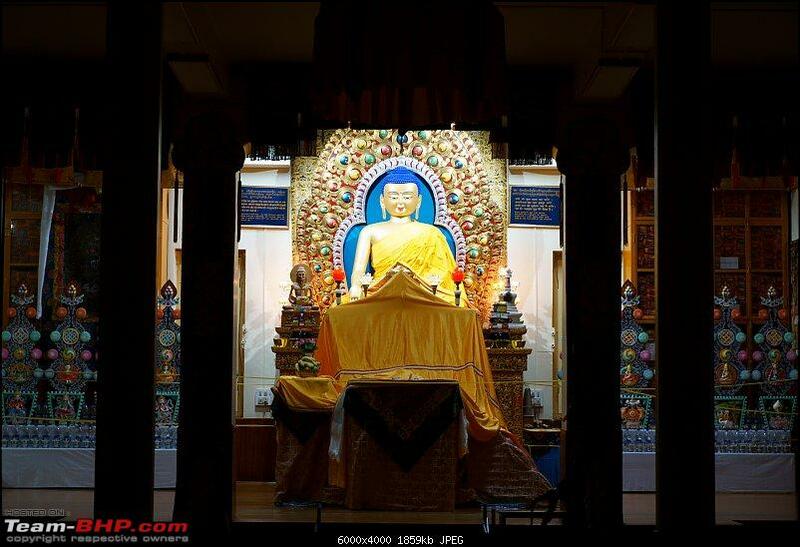 There are three Budhist monasties, a gurudwara and a few temples in town. 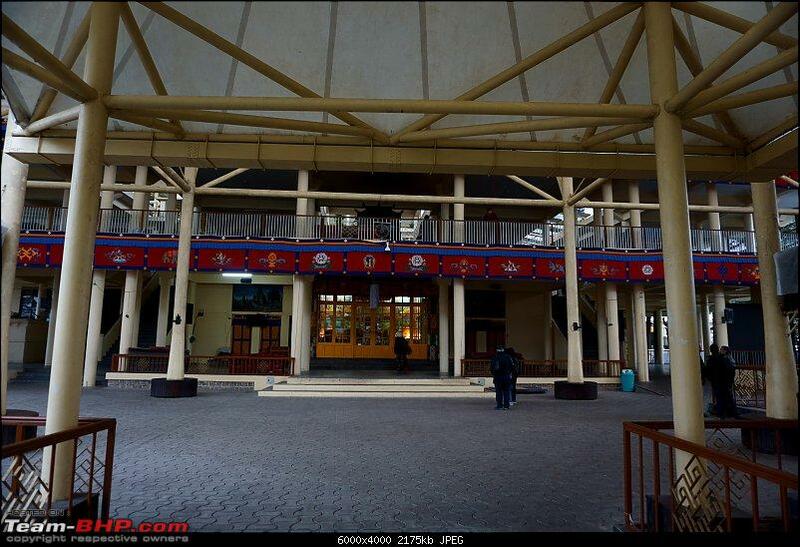 Incidentally Vidu Vinod Chopra’s 1998 film “Kareeb” starring Bobby Deol was mostly filmed at Rewalsar. 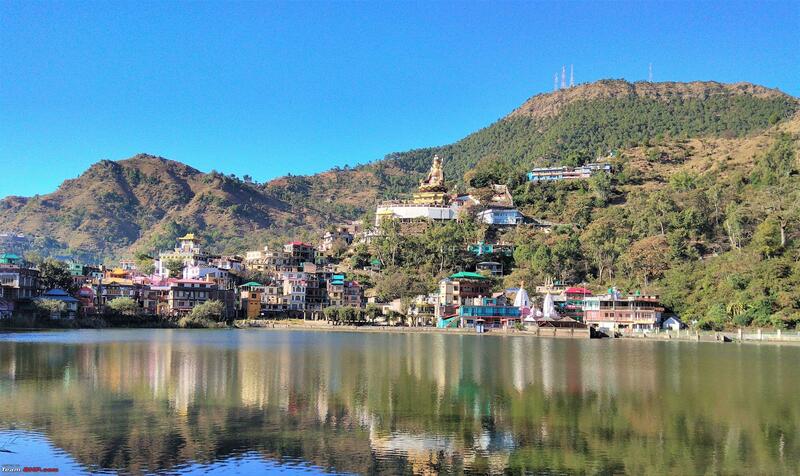 Next morning after a breakfast of paranthas and piping hot tea, both me & my brother took off on foot to take a closer look at the lake and pay our obeisance at the temple, gurudwara and the monastery. 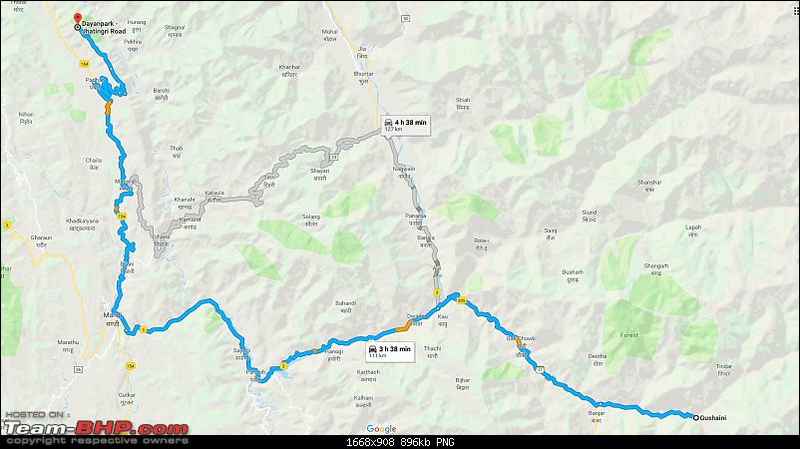 At about 12pm we started from Rewalsar for Mandi. 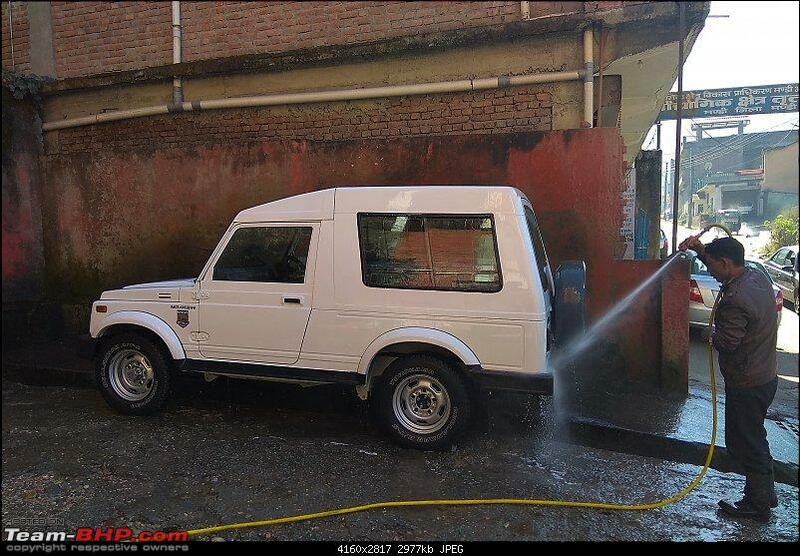 I noticed that Gypsy was getting a little dirty so decided to get her a quick wash on the outskirts of the town. 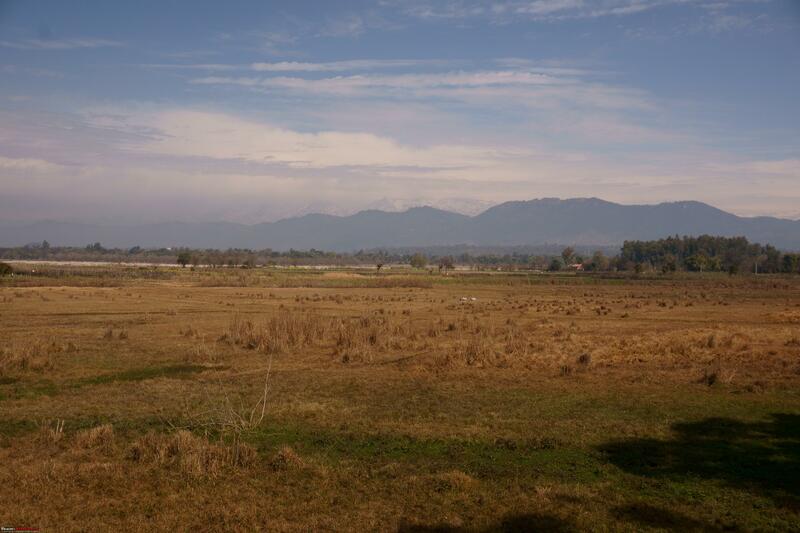 And after grabbing lunch at a dhaba at the end of the town we headed to Gushaini. 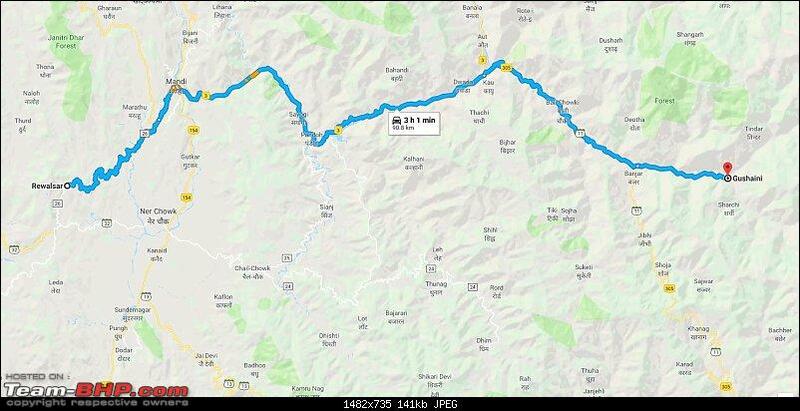 From Rewalsar I took Highway No 26 till Mandi, Highway No 3 till Aut & Highway No 305 till just before Banjar where you turn left to go to Gushaini. 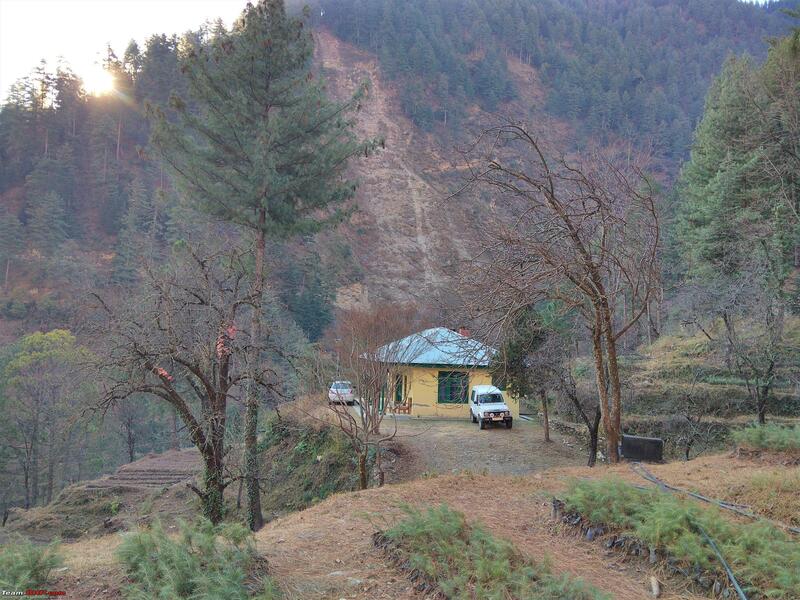 My destination was Bandal Forest Rest House which is located at the end of the Tirthan Valley. 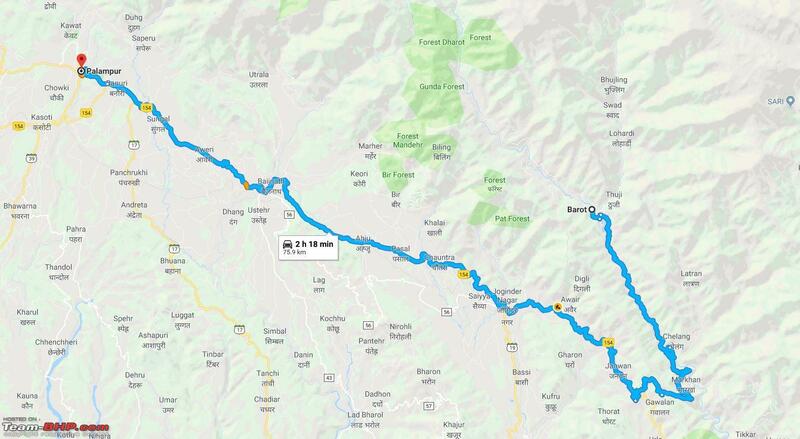 We reached Aut at 3pm and took a right turn just before the Aut market and crossed the Beas river to head to Banjar. 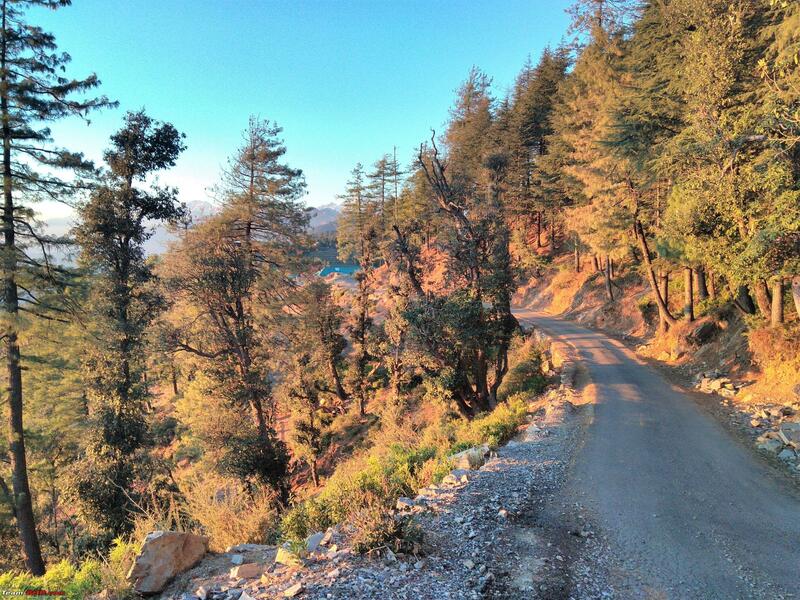 After a spirited drive along the narrow strip of tarmac I took a left just before the Banajar town towards Gushaini. 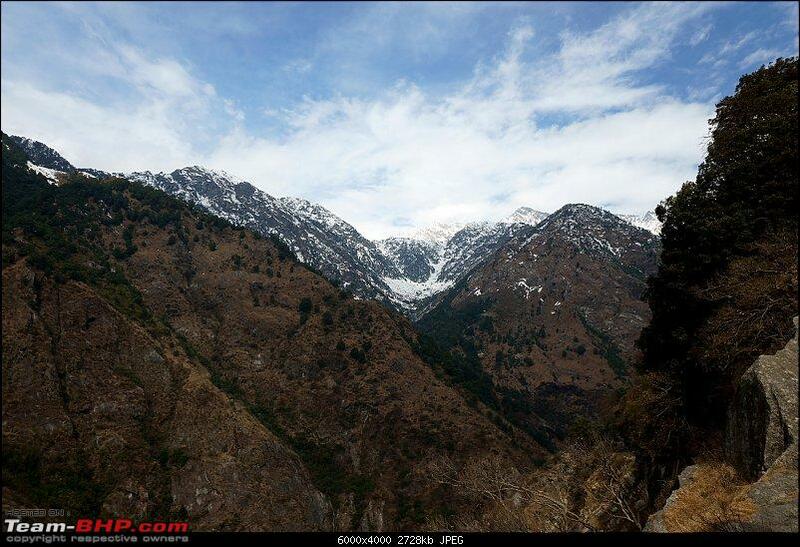 Gushiani lies at the Eastern end of the Tirthan Valley. Tirthan Valley is home to Great Himalayan National Park that is spread well over 1,100 sq. kms. and has also been put on the World Heritage List by UNESCO due to its unique bio diversity that includes Snow Leopard, Himalayan Black & Brown Bear, Leopard cat, Common Leopard & Himalayan Musk deer among other rare bird, insect & reptile species. One night cannot do justice to this beautiful place however this was more of a driving trip and more exhaustive exploration of the area would have to wait for another time. A little bit of a back ground is warranted here. I had last visited Gushaini in 2003 when I was posted at Jaipur and before that almost 40 years ago when my father was posted as Divisional Forest Officer at Banjar. 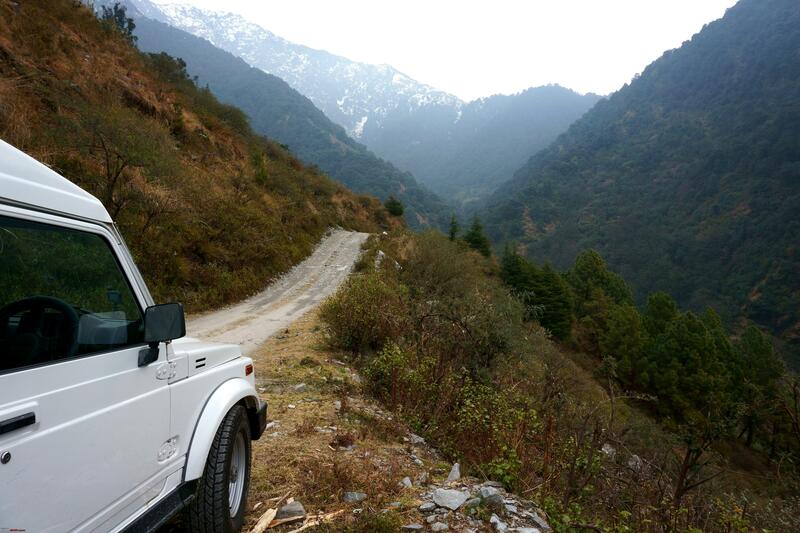 It was a little disheartening to find the Tirthan Valley in a sorry state with commercial activity galore. 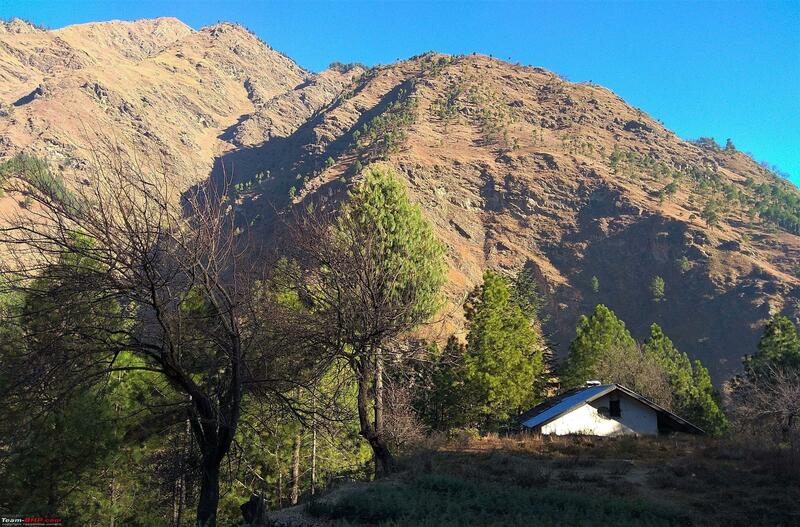 You have a mishmash of Home stays, hotels, camping sites & what have you located all over the pristine Valley. 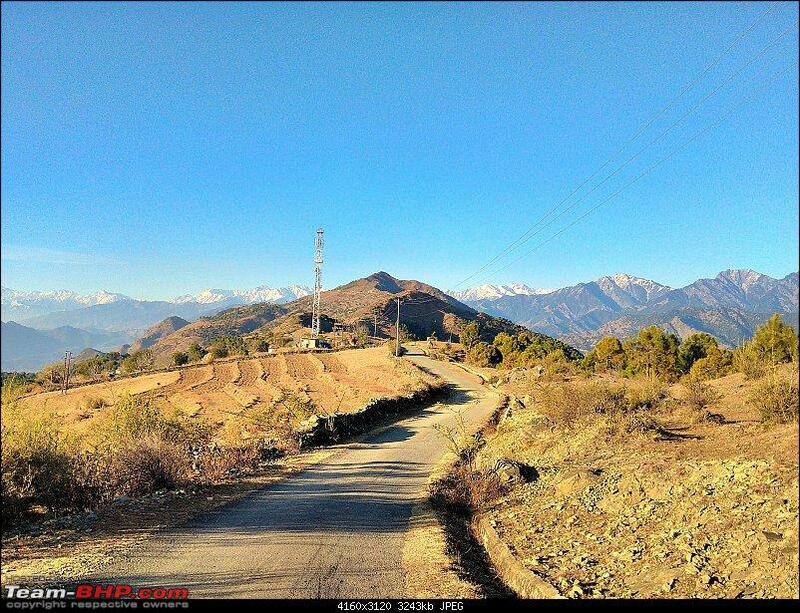 The road is in a terrible state of neglect, the tourism potential of the place notwithstanding. 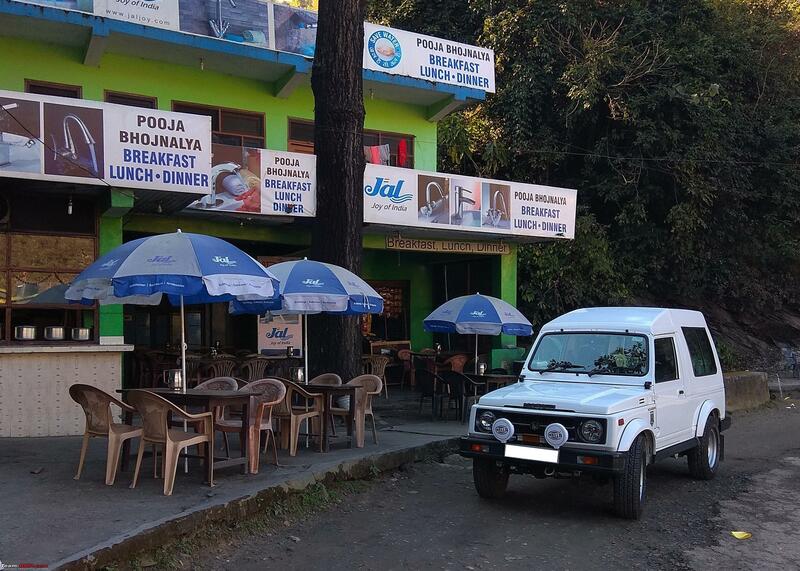 By 5:30PM we pulled up to the Forest rest house at Bandal located at the top of the hill and thankfully away from the hustle and bustle of commercial activity down in the valley. The care taker had prepared a simple dinner of dal, alu gobhi and chapatis. I asked him to get a fire going and sat down to listen to wind and gaze at the majestic mountain just across. Turned out that the caretaker had quite an interesting story to tell me, the fella had worked in a restaurant in Goa for four years before he decided that the city life is not for him. He then went on to tell me that he has 46 bighas of land in the village and a huge apple orchard. 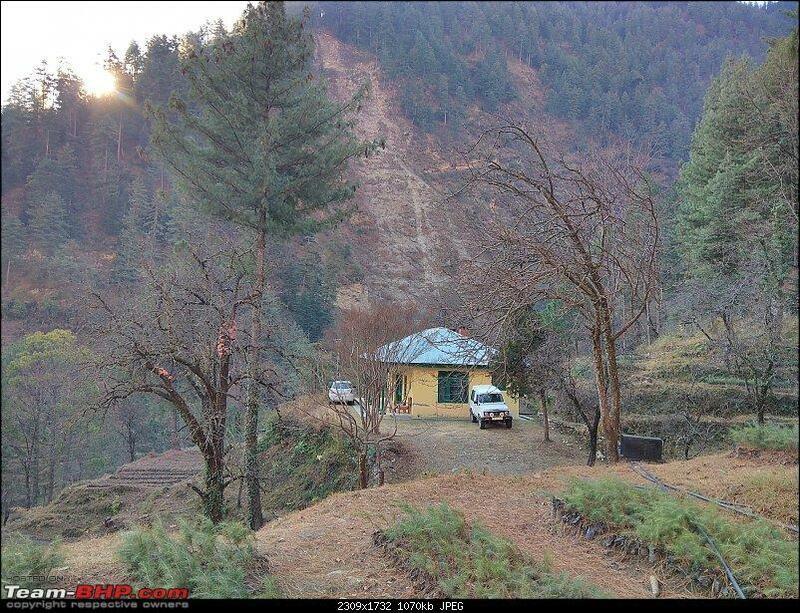 I’m actually flabbergasted; if I had that kind of land here (actually even one tenth of that) I would chuck my city life in a jiffy and relocate to Tirthan Valley. Interesting indeed; all of us want what we don’t have. 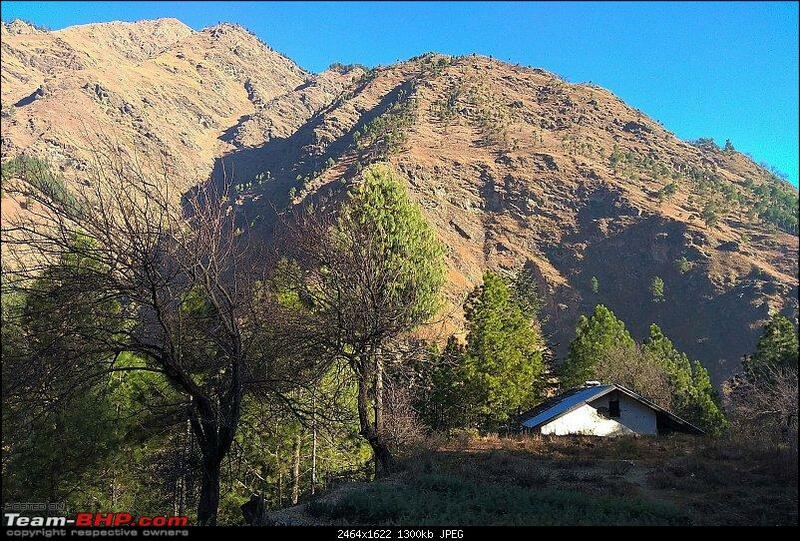 Question is if I have the guts to throw it all away and relocate to some obscure village in the mountains where you can keep company with the pristine air and somber mountains and not much else. I think I know the answer however I still have a few obligations to take care of. 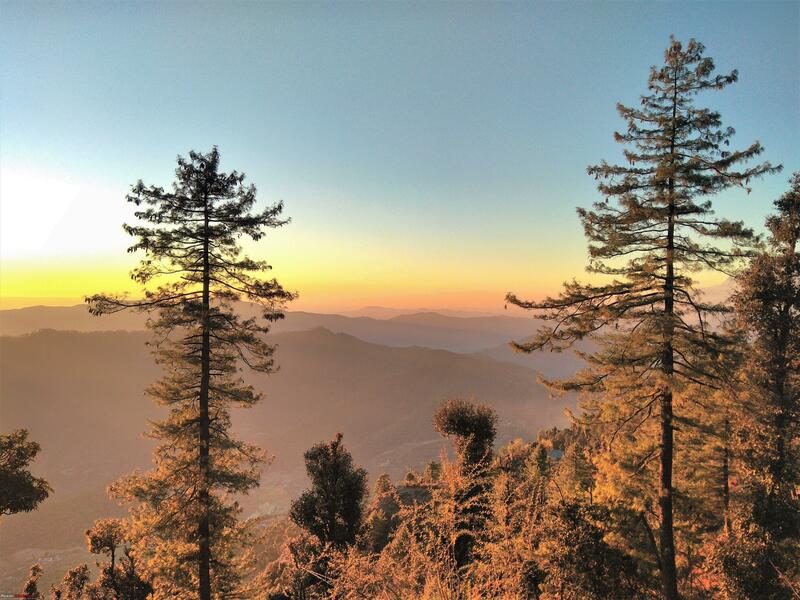 I’m a proverbial mountain man; I find it easier to breathe if I’m surrounded by mountains and forests. 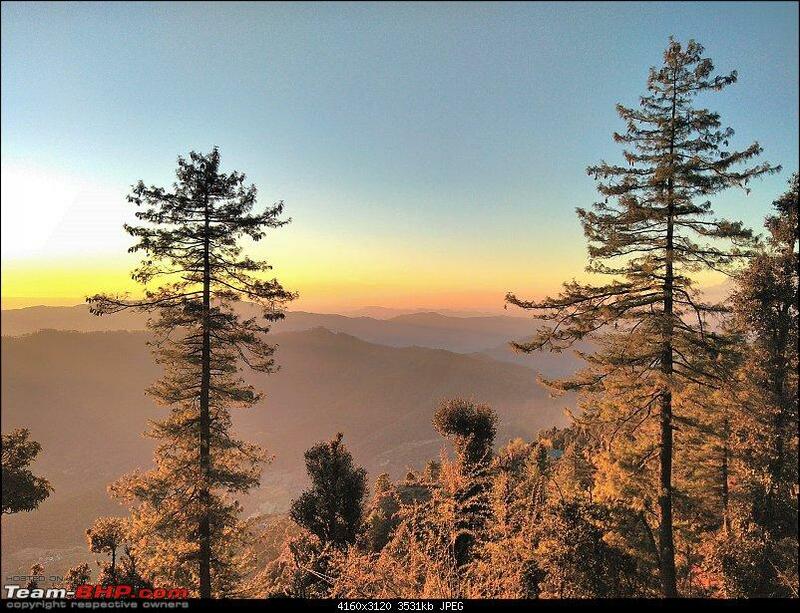 Thankfully I live in a city which is 90 minutes away from this……. We had a late dinner and after nightcap by the fire and reminiscing about the bygone, uncomplicated time went to bed at 11:30pm. Got up early at 7 and the caretaker served a cup of hot tea. After a quick shower and breakfast of eggs headed out for a walk. The Sun was coming up and casting a sheet of mellow sunlight across the narrow valley. I almost wanted to stay for another day however that will have to wait for another time. 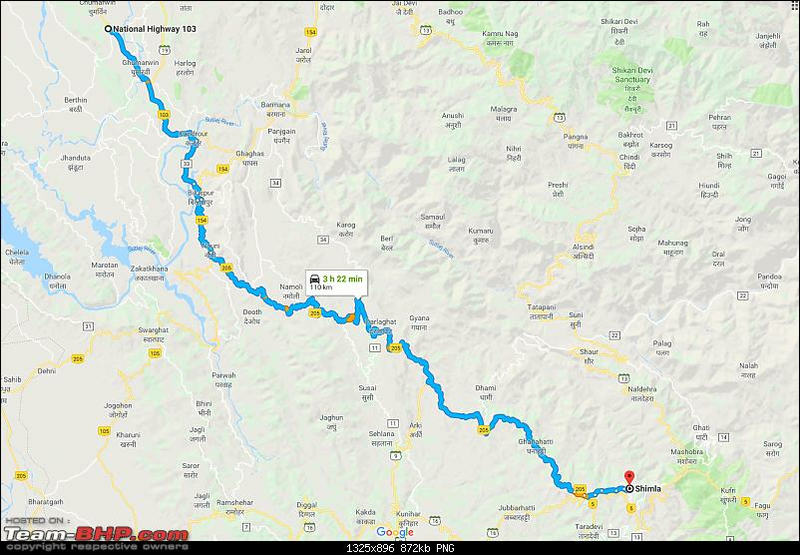 We headed out at 11:00am on the same highway; today we had to reach Barot and for that I had to drive to Mandi and turn right just before the Mandi town cross the Beas river and drive on to the state highway No 154 leading to Joginder Nagar. 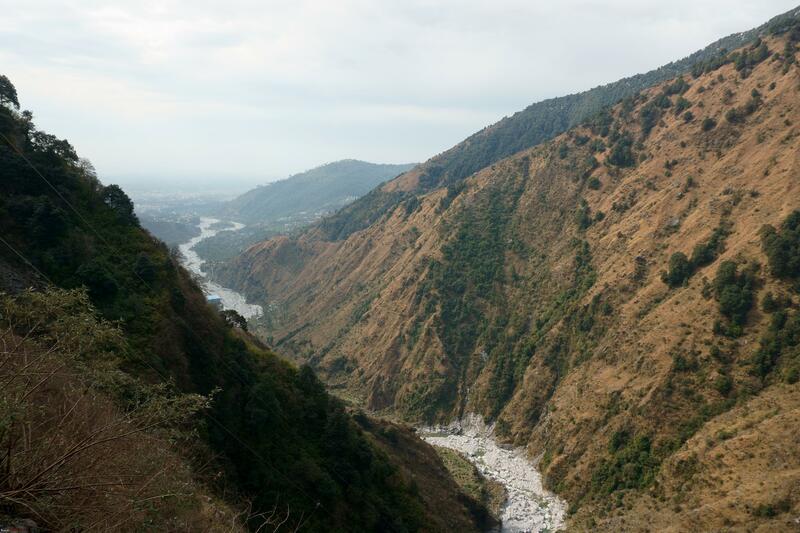 However on the way we did venture to river bed by the Gushaini- Banjar road to take a closer look at the river. By 2pm we were in Mandi; had lunch a decent looking restaurant, this time closer to town. 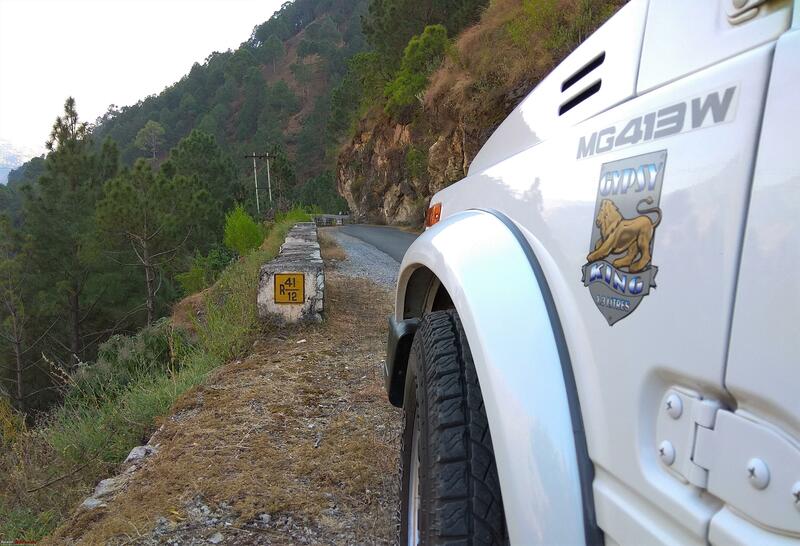 Filled up the vehicle at an HP gas station and headed out onto the Joginder Nagar highway No 154. 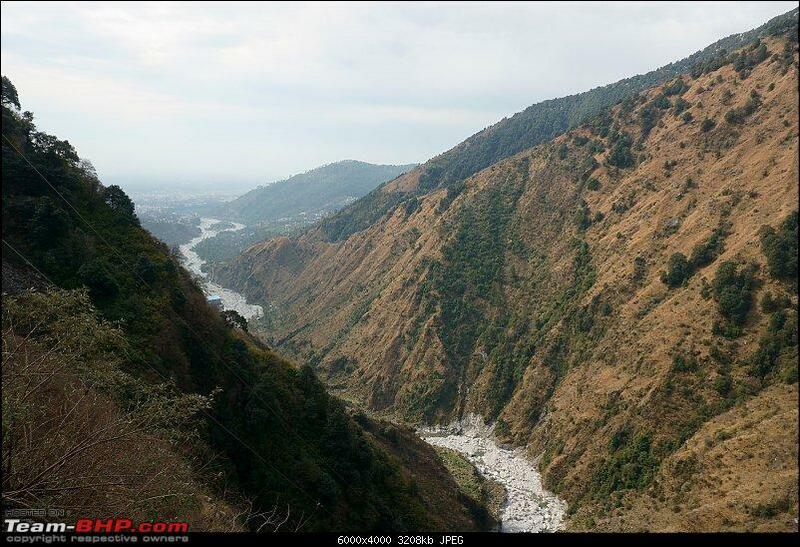 The state highway from Mandi starts to climb as it makes it way to Joginder Nagar. It is a great road to drive on for there is very little traffic and tarmac is smooth. I shift down a gear and press a little on the accelerator and the smooth engine of Gypsy purrs and I indulge in the joy of pure unadulterated driving where I have to give constant steering inputs and watch for the chirp from the rear tires as they struggle to maintain traction and as I increase the pace I am actually doing power slides as the tail starts to hang out. It is time to slow down and take in the changing environs. 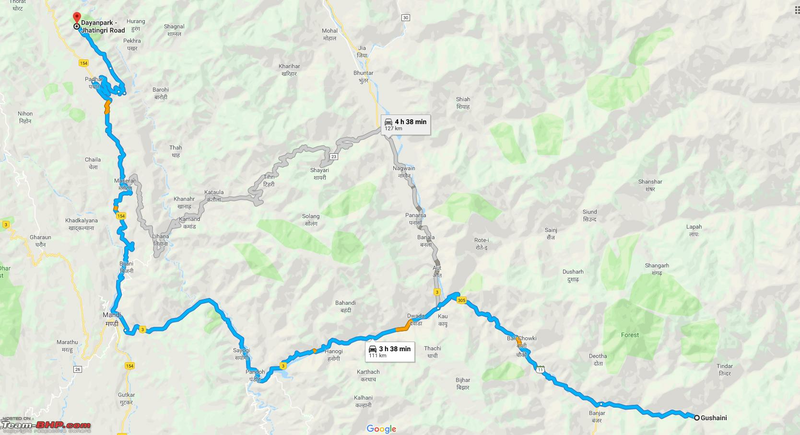 Instead of taking the regular route which is a right turn from Ghatasani (folks who are planning to visit Barot should turn right & Ghatasani) I decided to take a detour at a small village called “Padhar”. This road is barely paved (probably 20 years ago) for the most part and secluded (thank God). 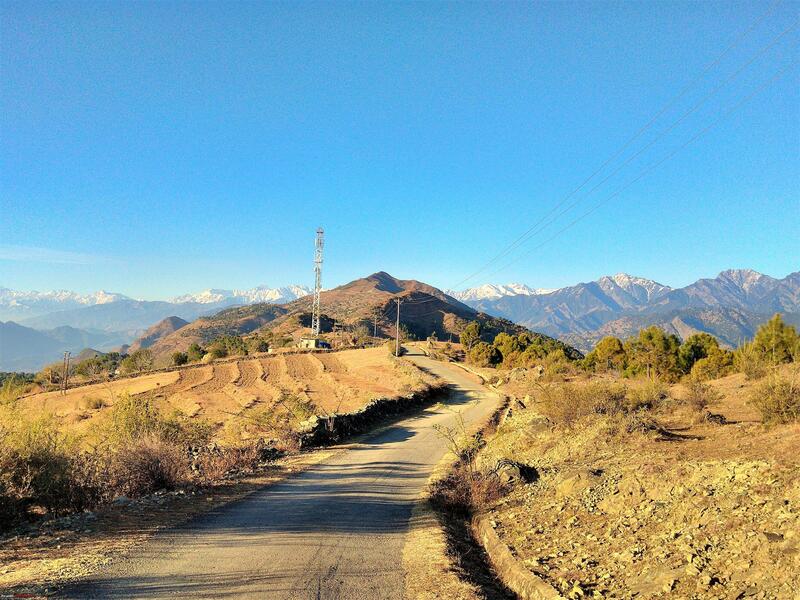 The road meanders through small villages and passes through some beautiful locales. 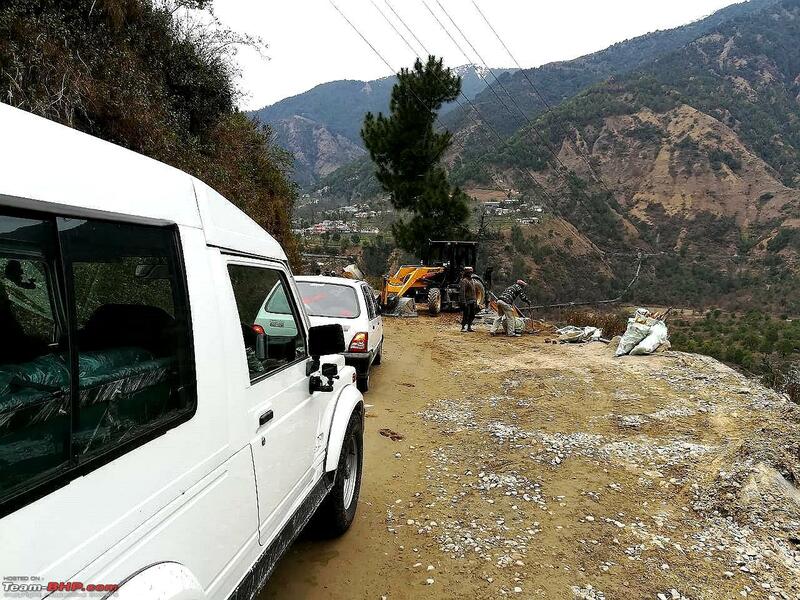 We were making slow progress as the tarmac is broken at many places and those who are familiar with unforgiving suspension of Gypsy know that best way is to tackle such stretches at a slow pace. I also aired down the tire pressure to 17 psi and that surely seemed to help. As we get closer to Barot the Sun was going down however the scenic beauty is absolutely breathtaking and the air is crisp. I cannot wait for the next morning to gaze at the picture perfect views all around. 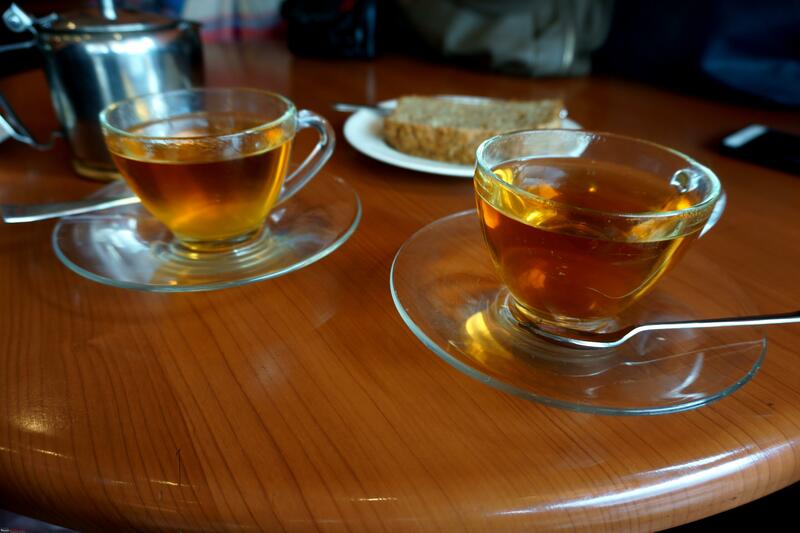 We stopped at a small tea shop at a place called Jilhan around 5pm. The lady who owned the shop had got a small fire going in a small steel pan and in freezing temperatures we were thankful to sit around the fire and sip the warmth inducing concoction. I got into a conversation with the lady; turns out that she is a widow and is raising her two girls all by herself. The elder one is doing MSc in Chemistry at HP University in Shimla and the younger is in class 12. 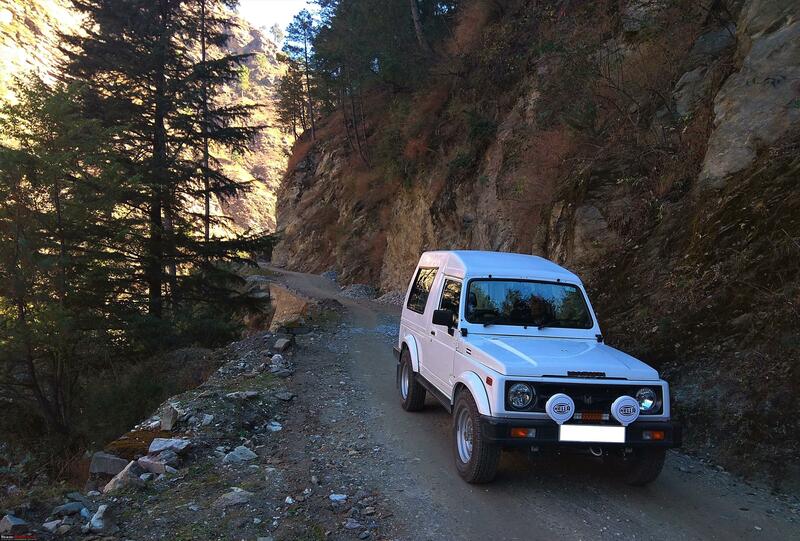 I commended her on her courage and grit, wished her my best and we started our drive to Barot. 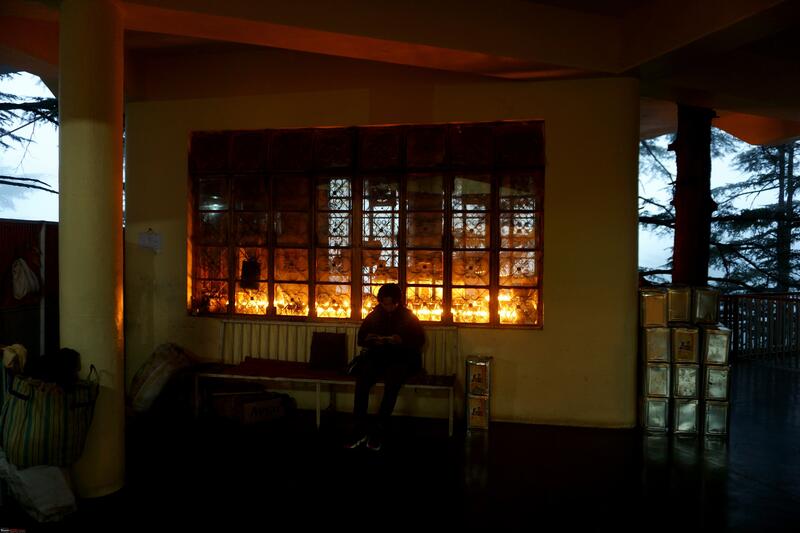 By the time we pull in to the PWD rest house at Barot, it is close to 8pm. 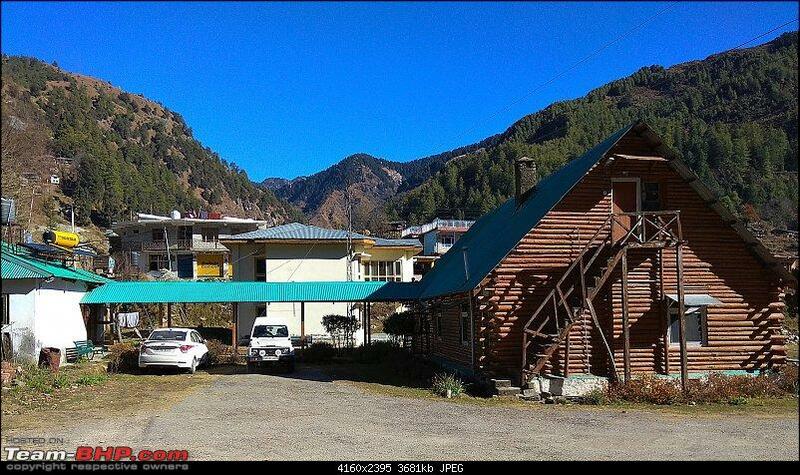 This rest house is a log hut structure and was constructed by British more than 100 years ago. The care taker is a jovial fellow and he had prepared a delicious dinner of Rajmah & rice along with some delicious grilled Trout. After the dinner, we hit the sack and are asleep in no time. 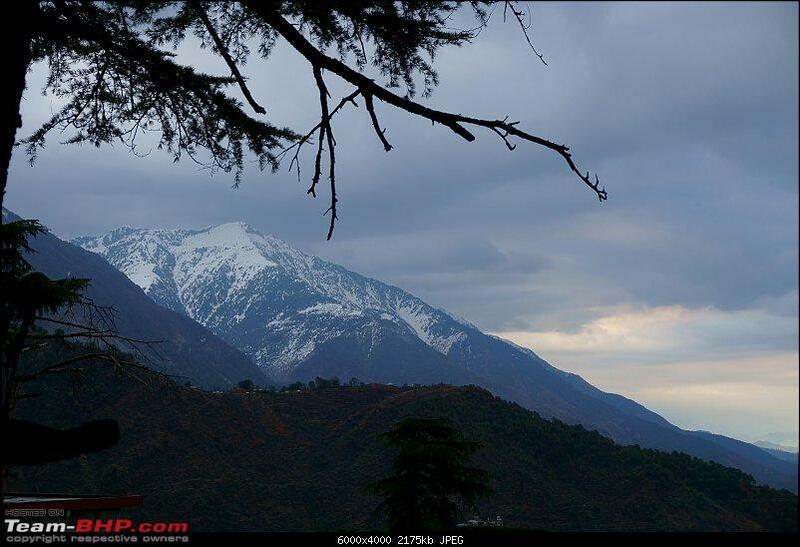 Barot is surrounded on both sides by the Dhauladhar range of mountains and is located at 6,000 feet above sea level. 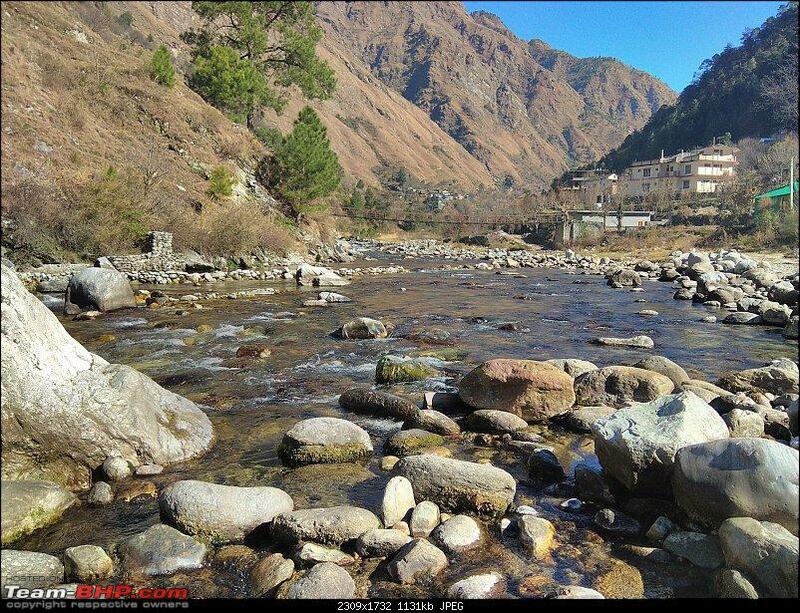 Some background about Barot; the village is known for Shanan hydal project that was commissioned in 1932 and is owned and operated by Punjab Government (Mandi was part of old undivided Punjab state prior to formation of Himachal Pradesh in 1950). Last edited by Vikram Arya : 17th March 2019 at 08:26. We got up at 7:00am and were served hot tea by the caretaker. 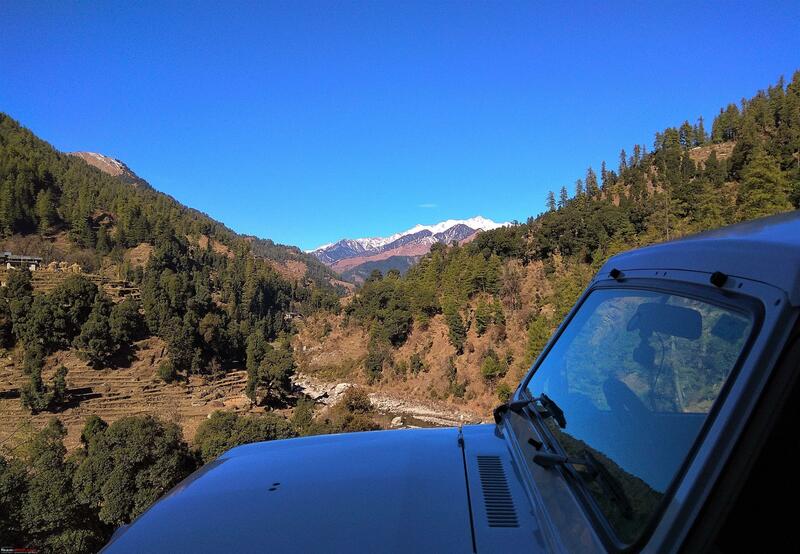 After a sumptuous breakfast of aloo parathas (not my favourite breakfast however is easier to prepare for the folks living in remote places as the ingredients are easily available) and some ginger tea we leave to have a closer look at the Barot reservoir. 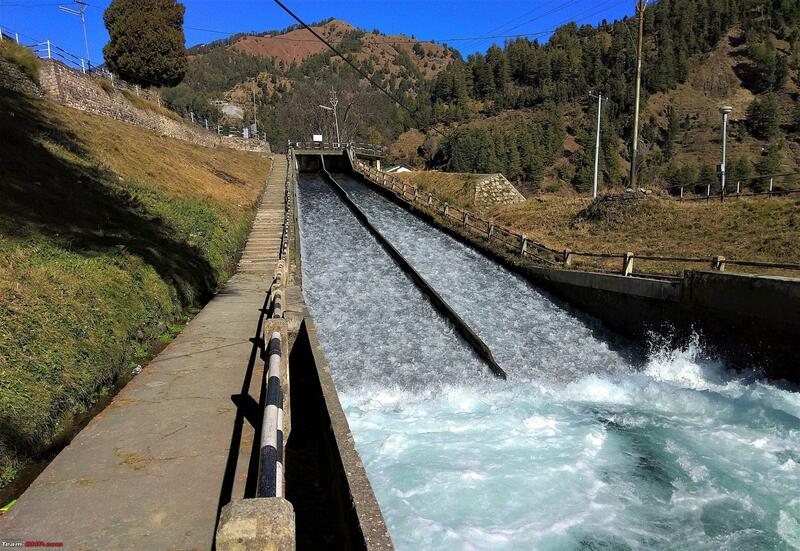 The local Uhl river drains into the reservoir that is the mainstay of the Shanan hydel project. 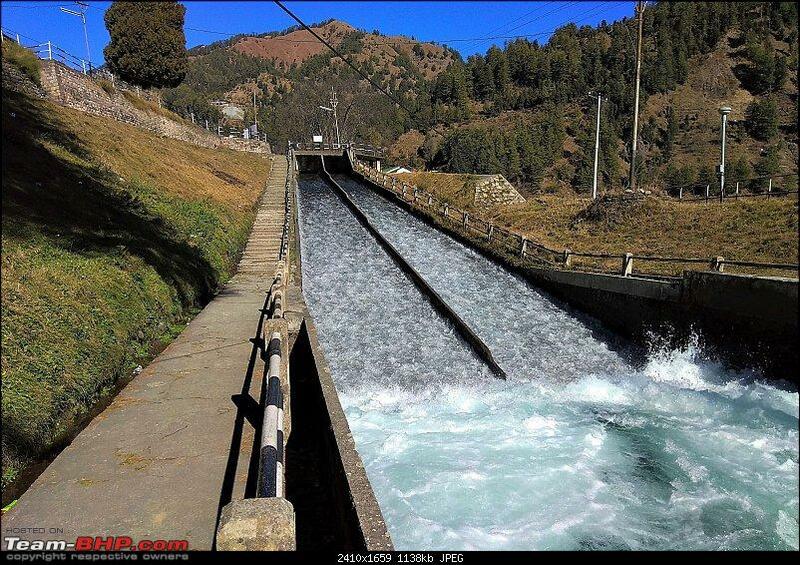 Barot also has a number of trout farms. 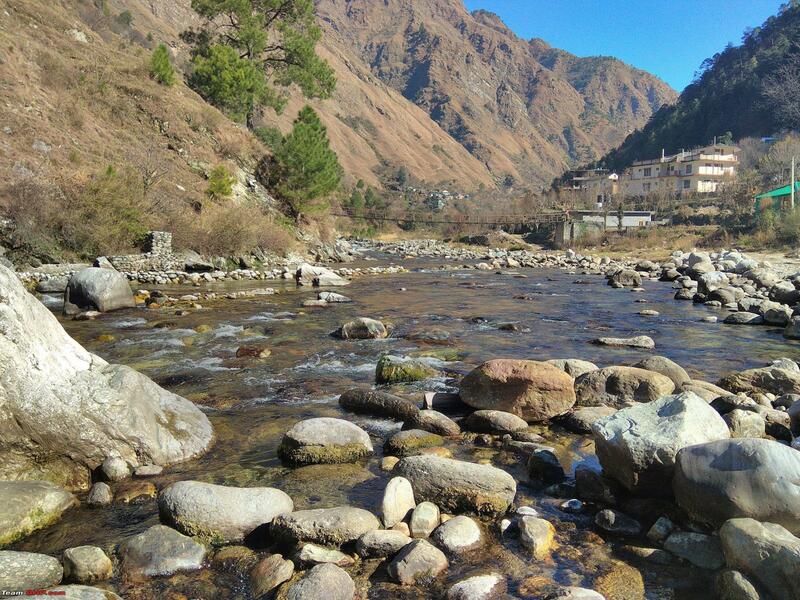 Trout is a famous and delicious fresh water fish and so Barot also attracts a number of anglers from all over India for trout fishing. 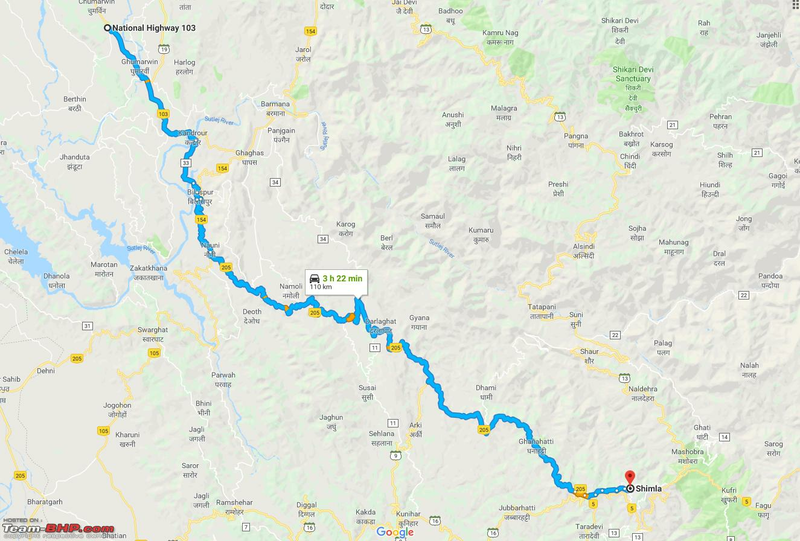 After visiting the reservoir and picking up a few kgs of Rajmah (Barot is also famous for its Rajmah lentil which happens to be my favourite) from the local shop we head out to Ghatasani, the village the where the narrow strip of Barot road meets the Mandi Joginder Nagar highway No 154. 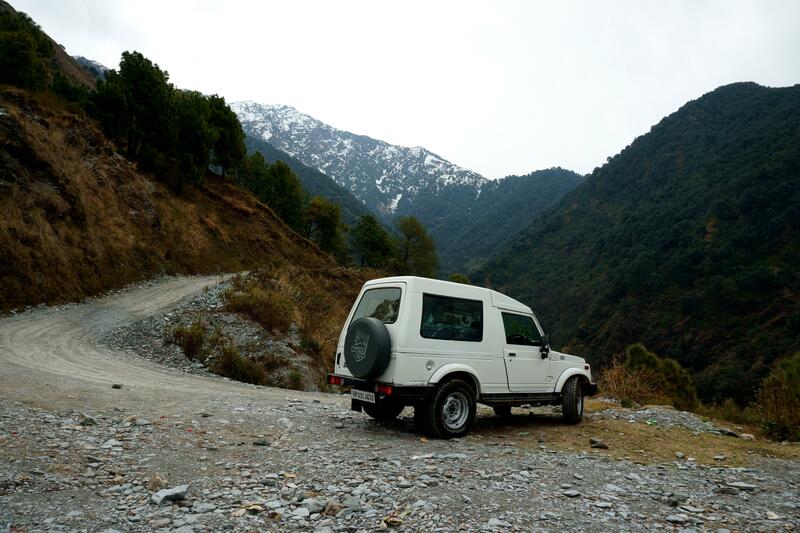 We were lucky to visit Barot as the day we left Barot, it received over a foot of snow and the road leading to Barot was closed for a few days. 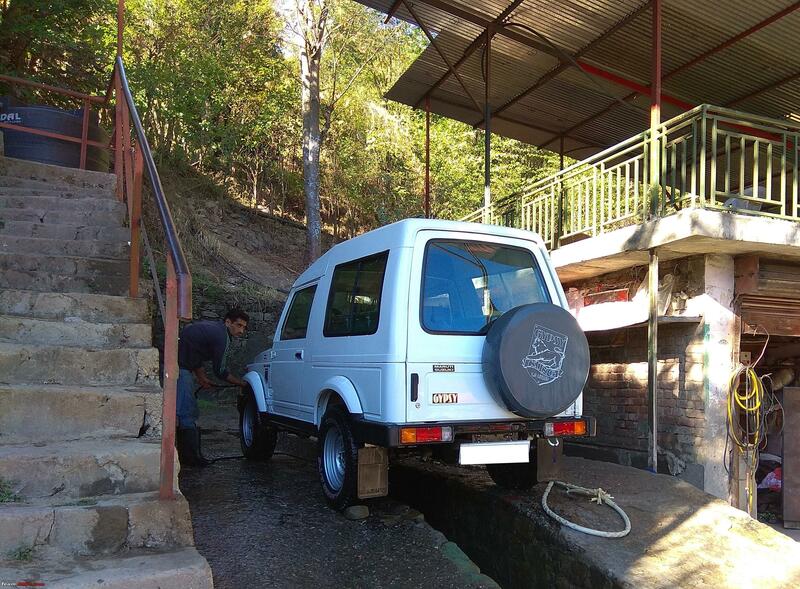 Gypsy getting a quick wash after we got off the Barot Ghatasani road. 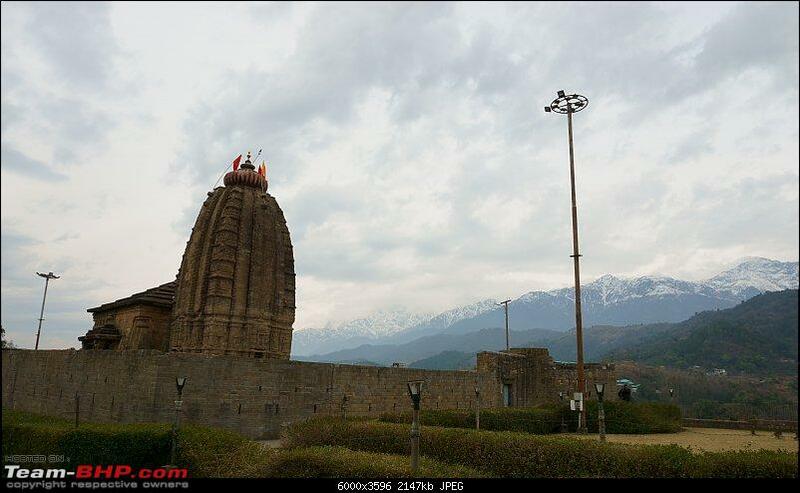 We hit Baijnath at around 3:00pm and stopped at the local lord Shiva temple which was constructed in 1204 AD. 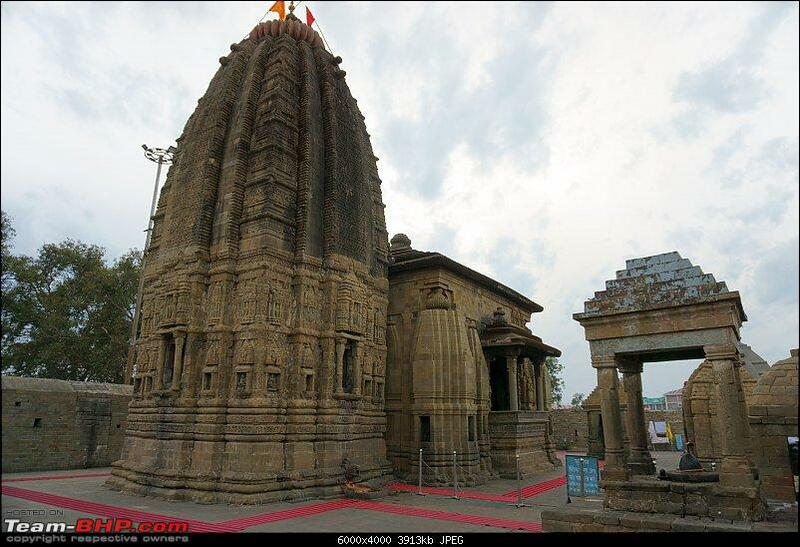 This temple is maintained by Archaeological Survey of India. 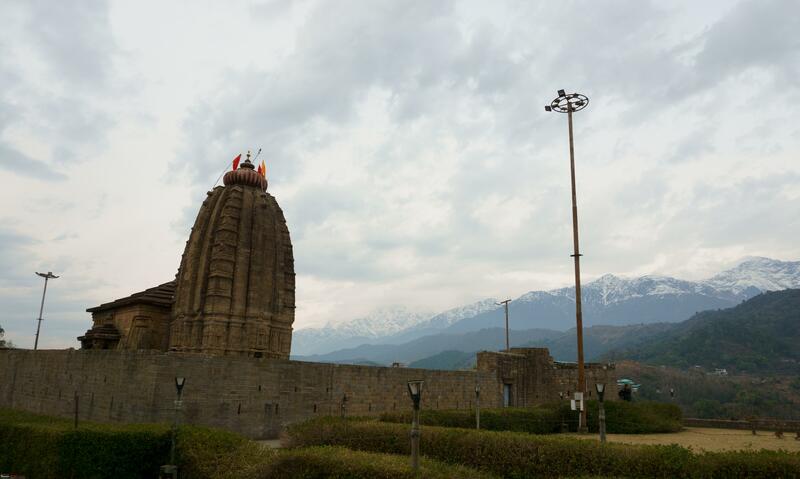 According to the inscriptions on the present day Baijnath temple structure, a temple of Lord Shiva had existed before construction of present-day structure. 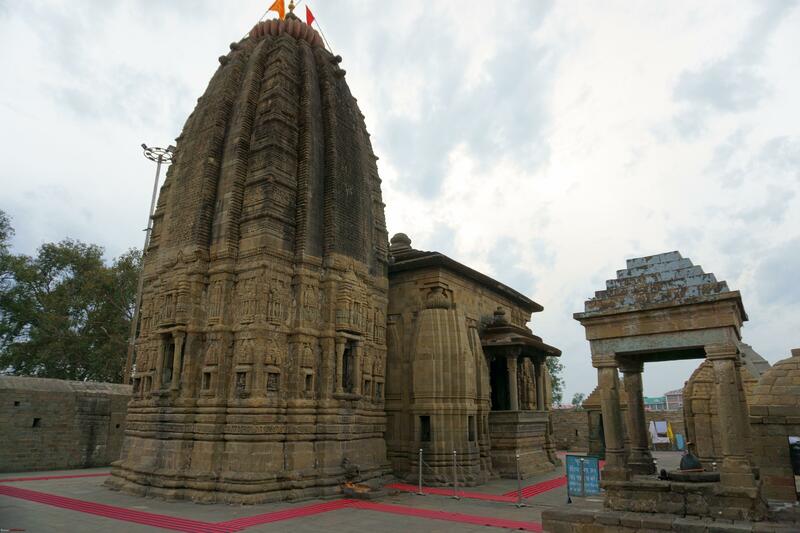 The local folk lore as narrated by the pujariji is that the Pandavas constructed the original temple in one night and was supposed to be more than 5,000 years old. 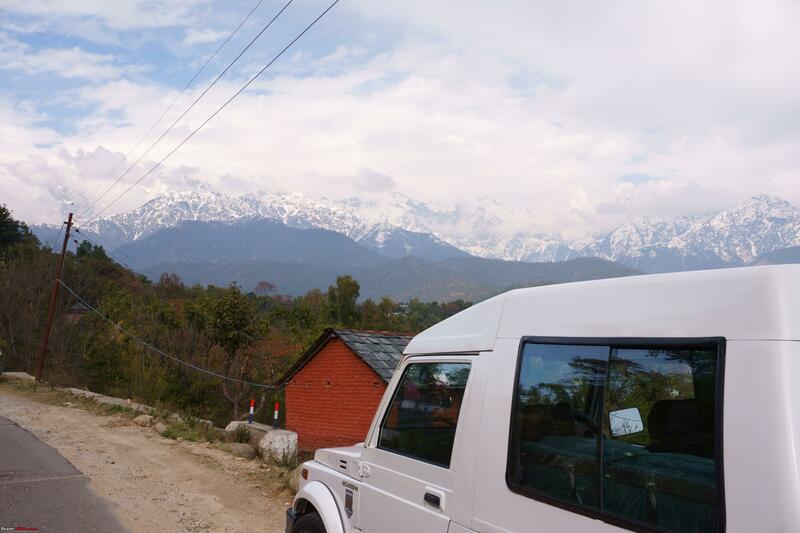 We pay our obeisance to the lord Shiva and click a few pictures before heading out to Palampur. 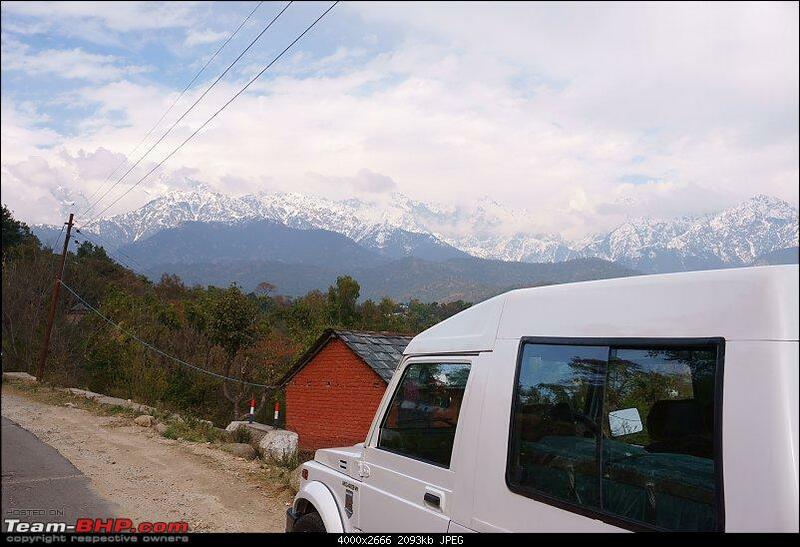 Palampur is a sleepy little town nestled in the foothills of the Dhauladhar range. 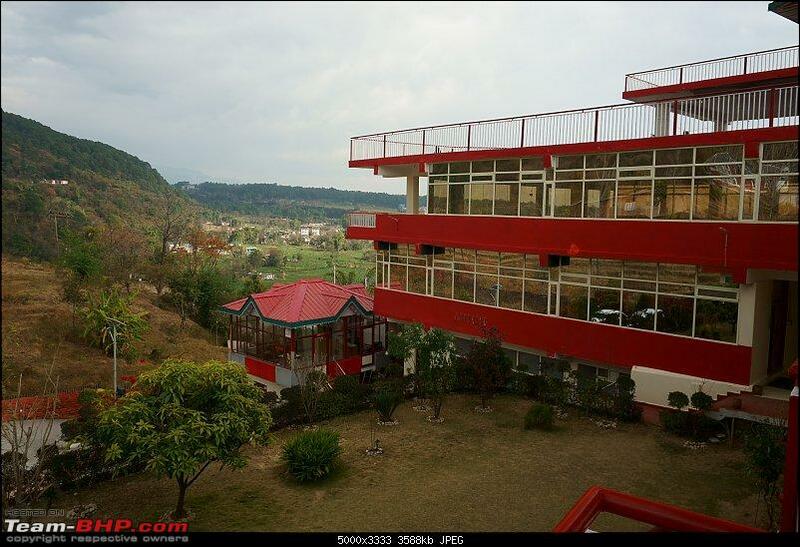 It is known for its tea gardens. It is 4,000 feet above sea level and has not yet been mauled by aggressive commercial development. Population of the town is approx. 7,000. 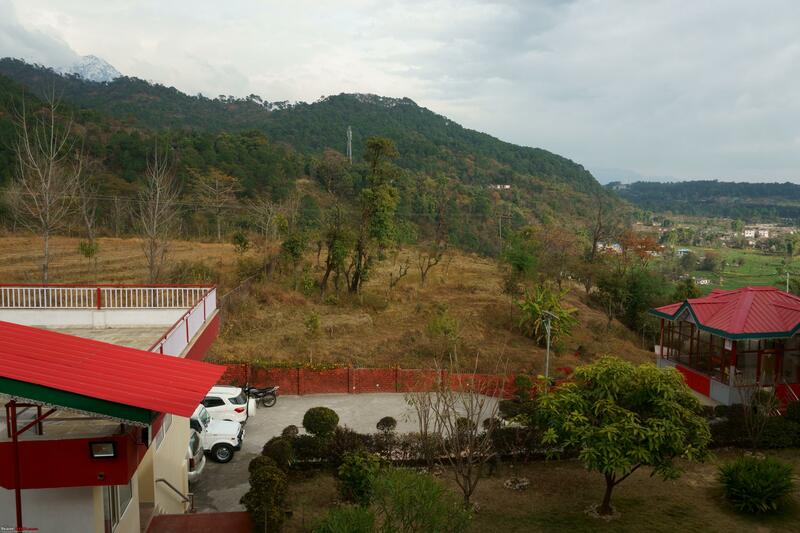 Palampur was decided by my wife as a short getaway location for a few days and she along with my in laws & daughter had already arrived there three days prior to my arrival. They were staying at a resort, ‘Bagora Heights” which is located on the Palampur – Dharamshala road and is about 7 kms away from the town. 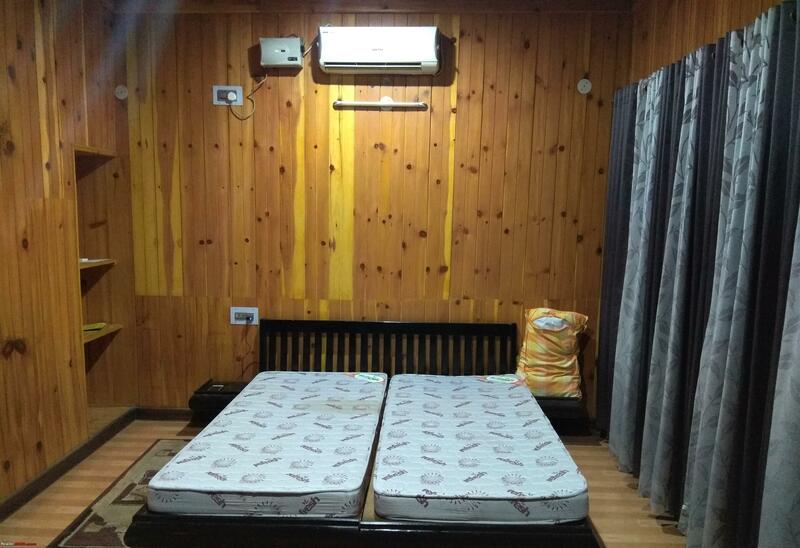 It has an idyllic location with small meadows on one side, a beautiful view of the valley in front and majestic Dhauladhar mountain range at the back. Turned out that there are only 2 more guests staying at the resort, so we got upgraded to a family suite which had two bedrooms. 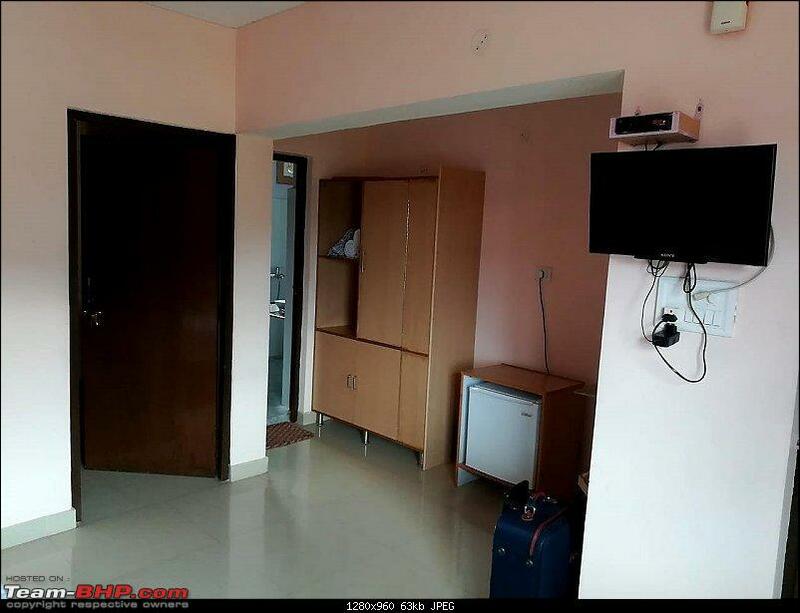 The accommodation was very neat & clean and staff very helpful. 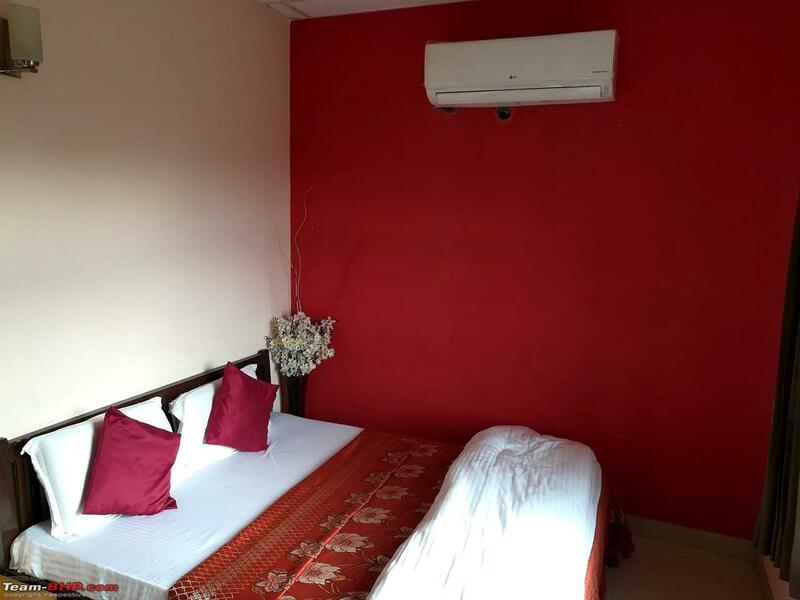 The dining area was located at the front of the property and the manager told us that they would cook anything that we want within certain limitations. During our stay there we were treated to some delicious Himachali cuisine. The tariff (Rs. 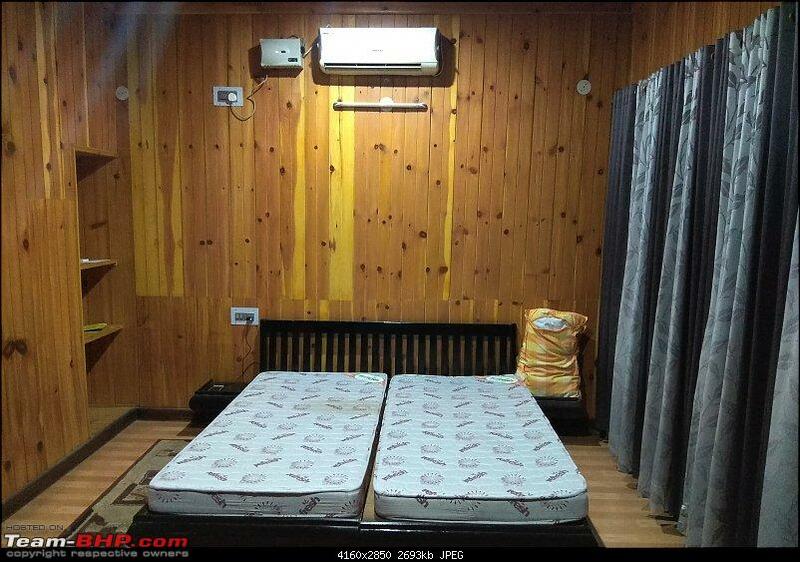 3,500 per family suite per day) was also very reasonable and included both breakfast & dinner. This was of course was off season pricing, but I found it to be pretty competitive nevertheless. We had a hired a cab for the next two days for some local sightseeing. 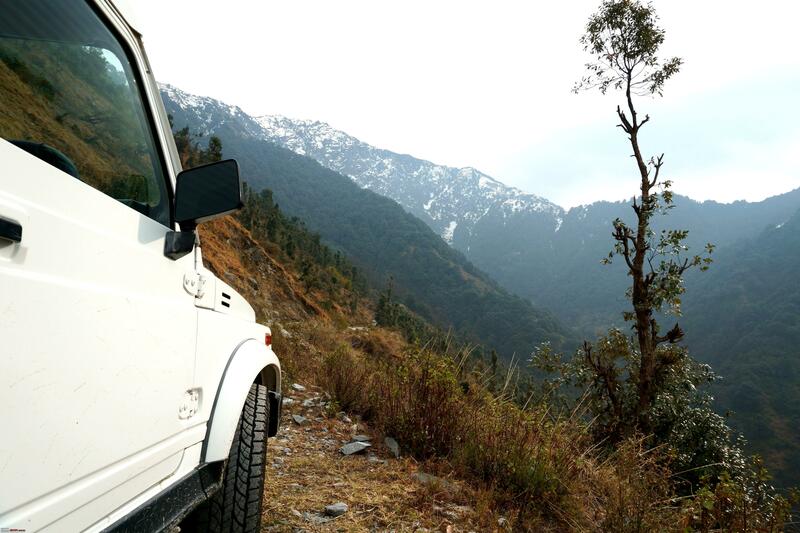 I maintain the Gypsy as a strict two seater for I believe that making anyone sit at the back especially on a less than perfect mountainous road is probably one of the worst punishments that one can mete out. 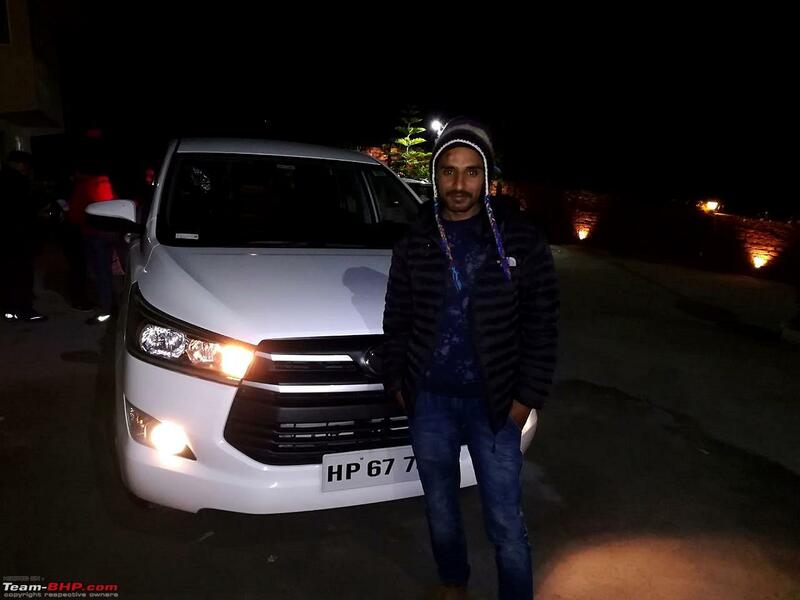 Our cabbie; Rakesh turned up at 8:30am in the morning with a brand spanking new Innova Crysta that had just 3,200 kms on the clock. 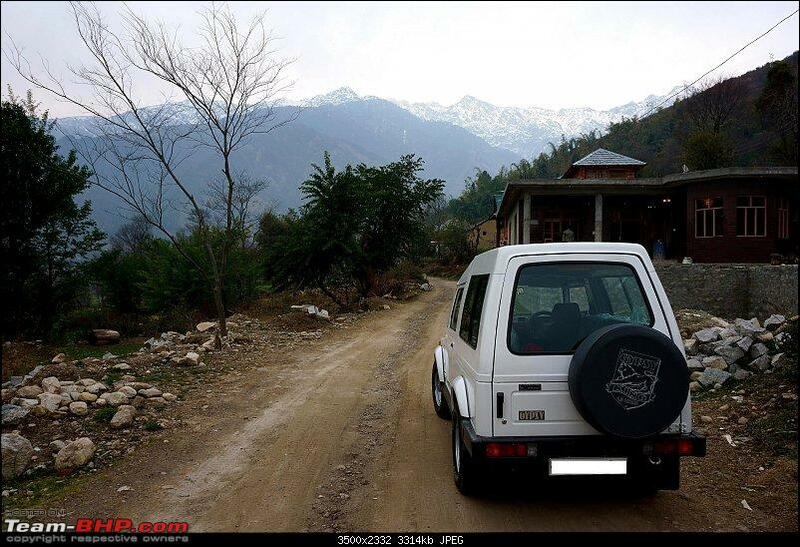 When Rakesh looked at my Gypsy in the parking lot, he suggested that I should undertake the very challenging drive up to the old Vindhyavasini temple located 15 kms from Palampur. 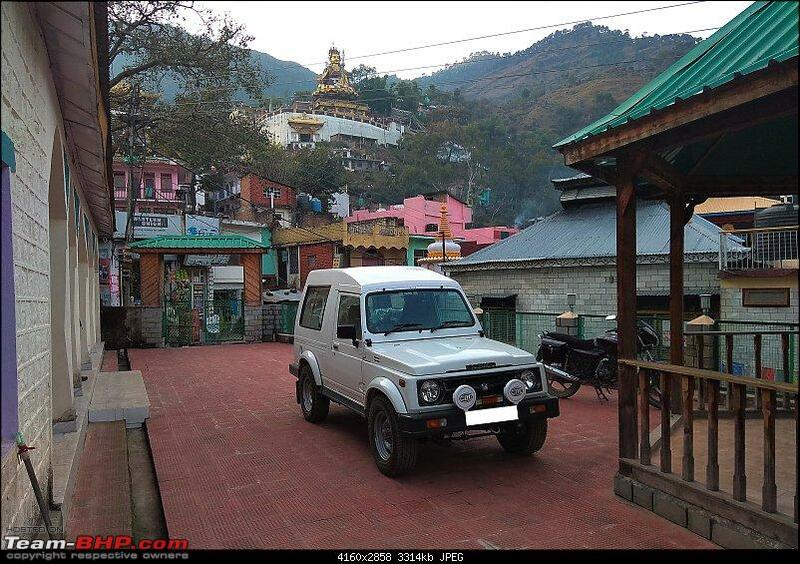 He further told me that the drive is very tough and only a 4X4 with a good ground clearance can do it (If you see the video No 1 for the drive down from the temple you would notice an Alto that has made its way up somehow however I wouldn’t recommend it if your vehicle does not have adequate ground clearance). 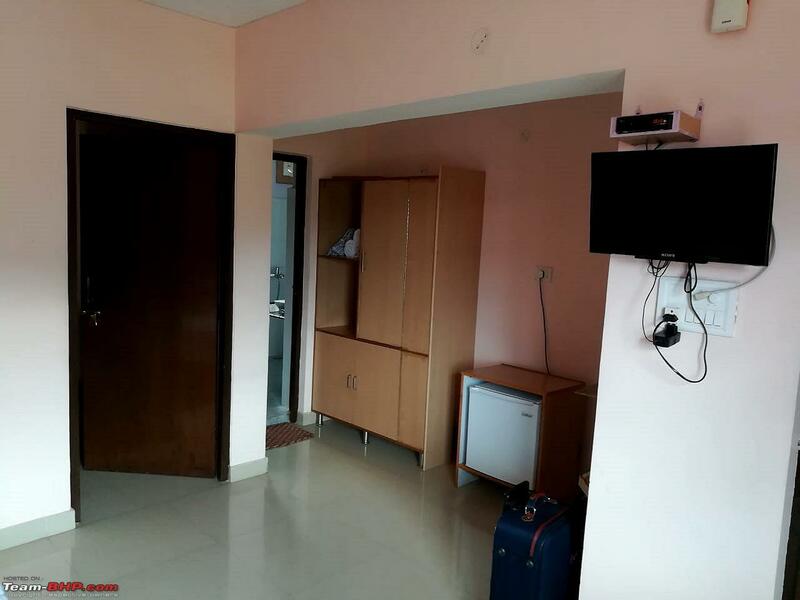 He didn’t need to convince me and it was decided that I will make this trip next morning before we leave for Dharamshala. I accompanied my family to the Chamunda Devi temple & also visited the Andretta art gallery where the art work of Sir Sobha Singh is displayed including the famous Sohni Mahiwal painting. 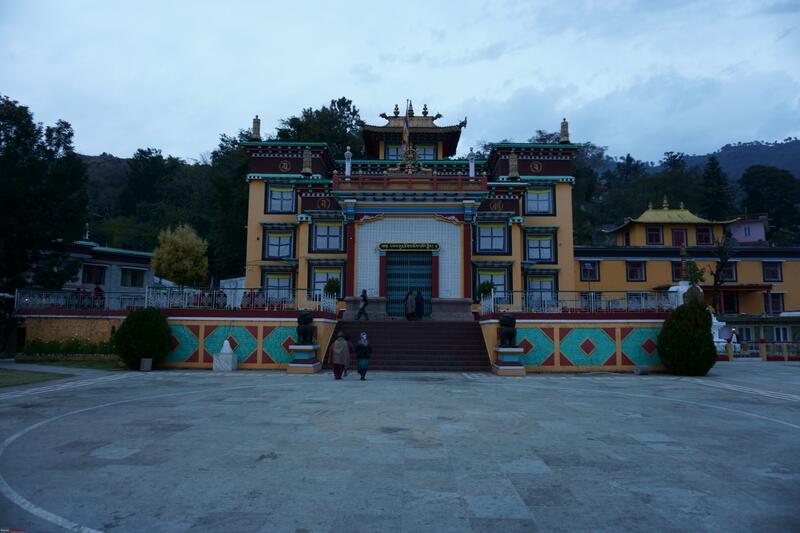 In the late afternoon we visited the Tashi Jong Monastery. 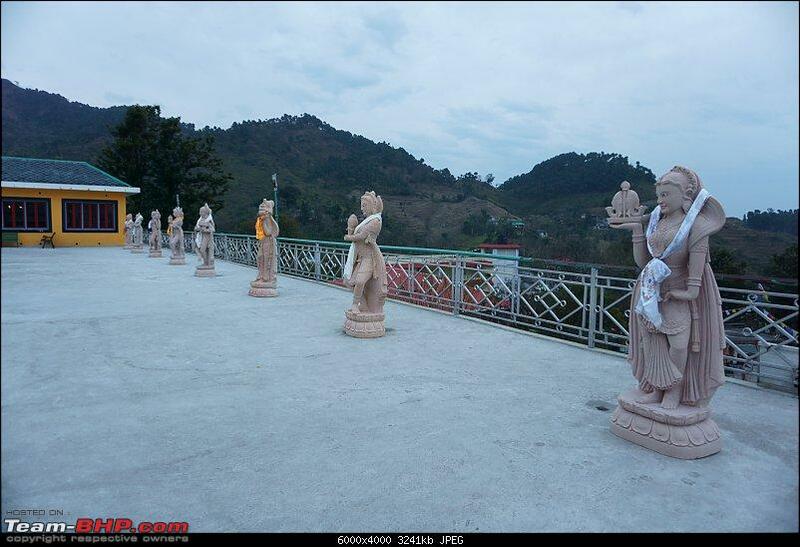 Tashi Jong Buddhist Monastery is situated about 15 kms from Palampur. 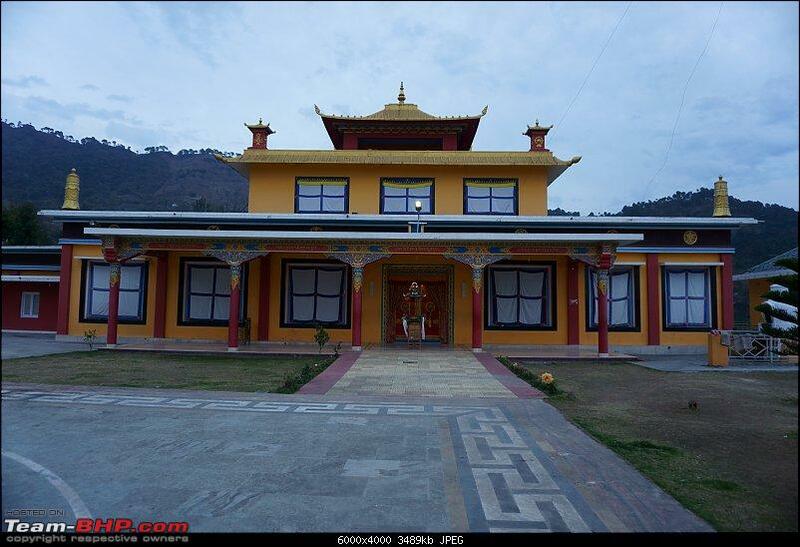 The monastery is located in Tashi Jong village, which is a small rural area situated between Paprola and Taragarh. 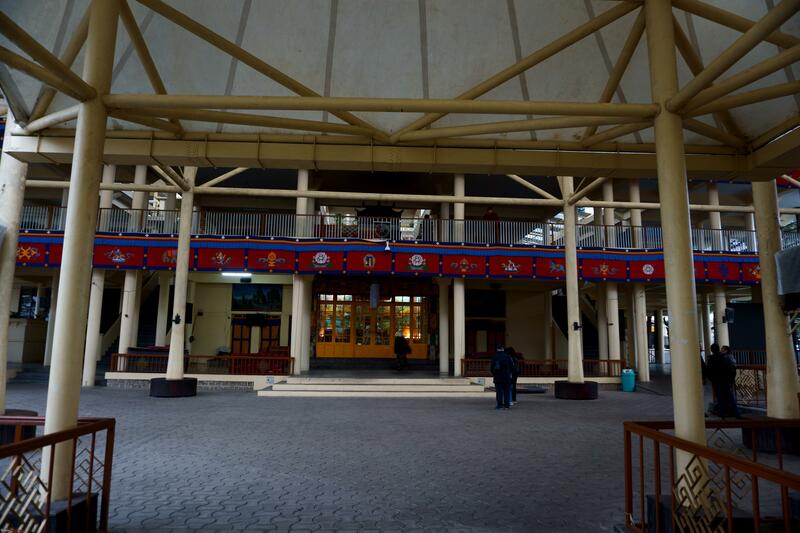 Home to the Drugpa Kagyu tradition of Buddhism, this monastery is one of the schools of Kagyu tradition established by 8th Khamtrul Rinpoche, Dongyu Nyima. 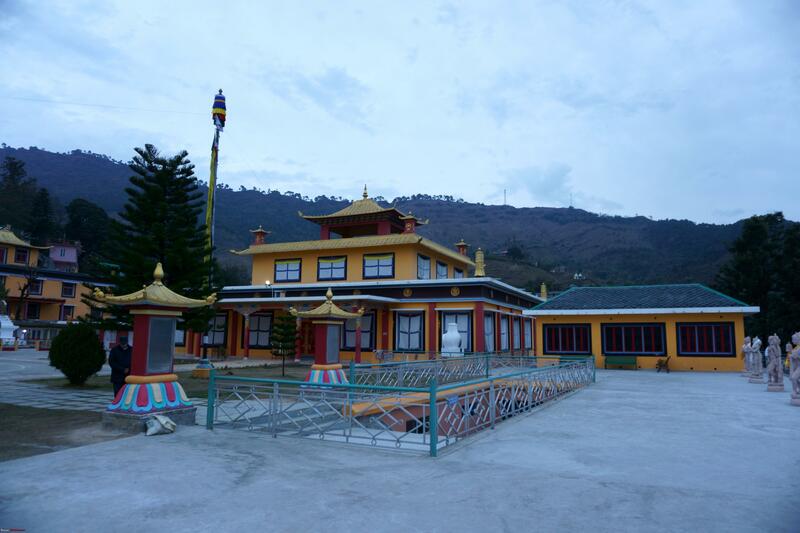 The monastery complex houses the main temple, the stupa of Khamtrul Rinpoche, and the Yamantak Retreat Center which is restricted to the general public. 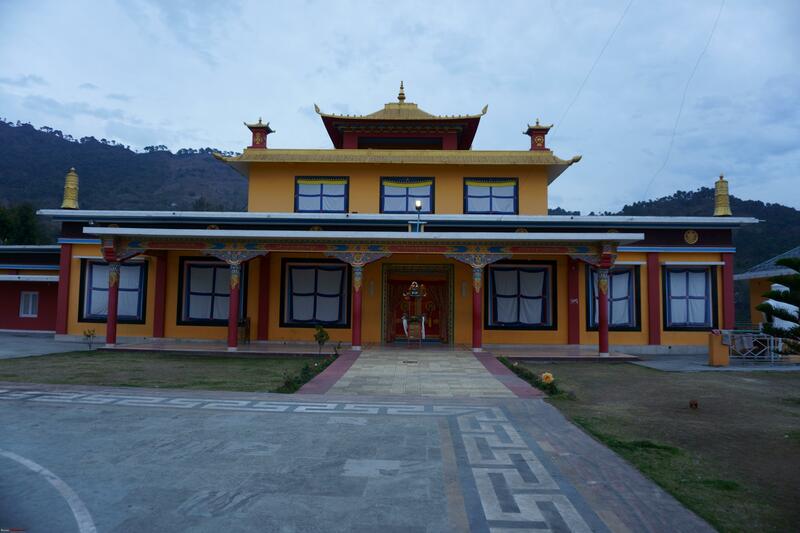 Designed by Khamtrul Rinpoche, the entire building is adorned with woodcarving, gilding and painting. 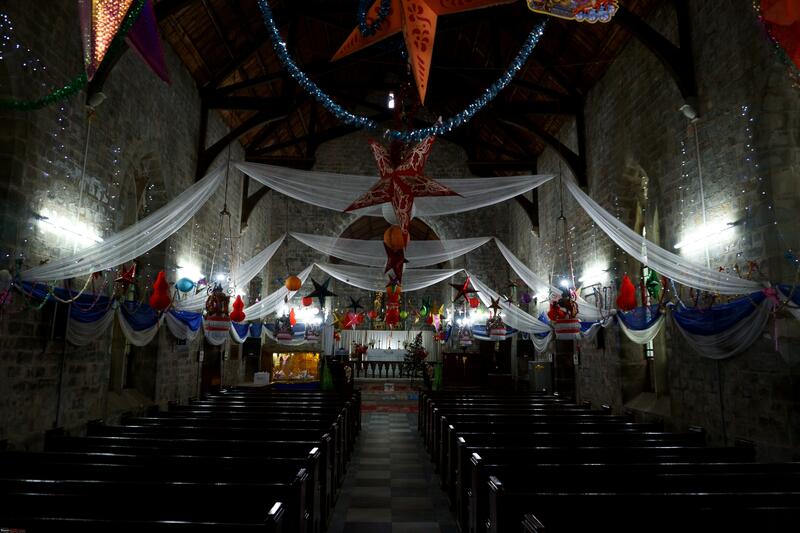 Apart from being a monastery, Tashi Jong is an excellent craft emporium, where Tibetan artifacts are available. On our way back, I got talking to Rakesh about the Crysta and after a while he handed me the key so that I could experience the car myself. I drove it for about 10 kms and was immediately impressed by the very responsive engine. The vehicle was very quiet and had a plush ride (after Gypsy it actually felt like a Rolls Royce). This by the way was my first time driving the Innova. 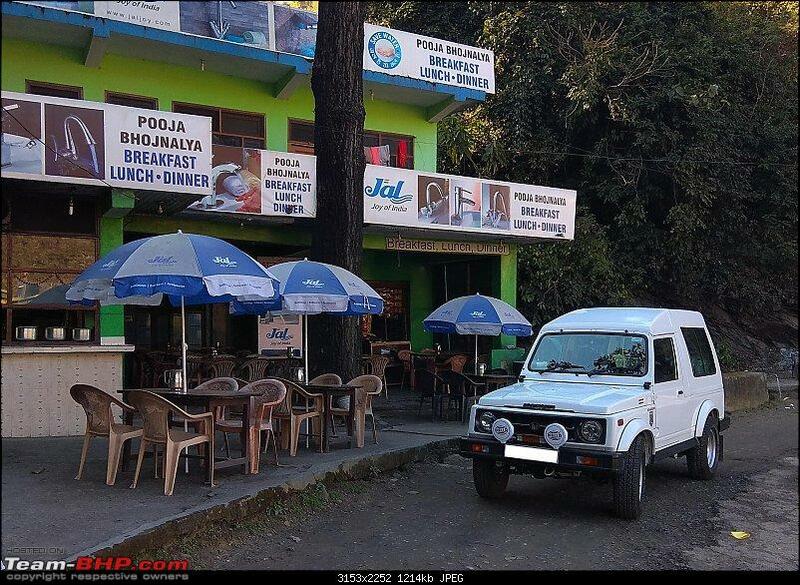 On the way to the resort, Rakesh suggested that we should take a tea break at the "Atulay" the famous sweetmeat shop of Palampur. 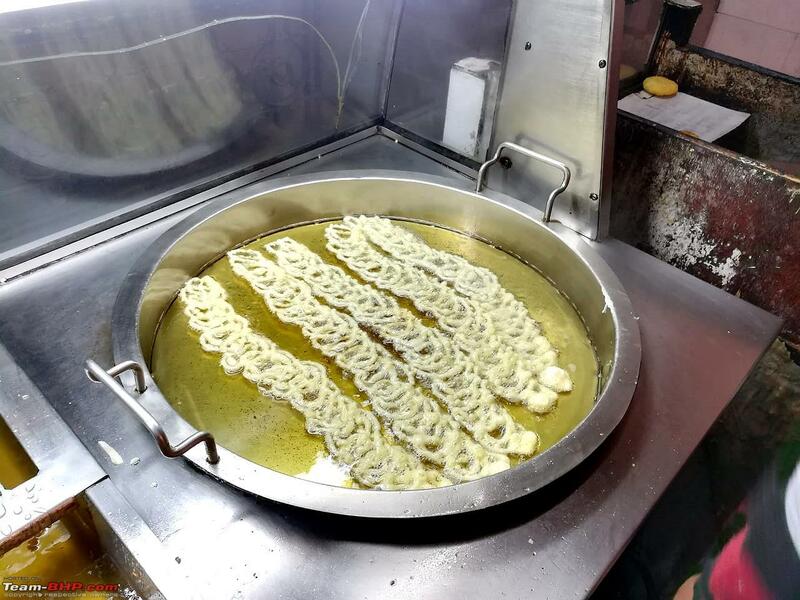 We agreed as everyone was feeling a little hungry as well and stopped for some tea and freshly made Jalebis (a North Indian sweet) in pure desi ghee. 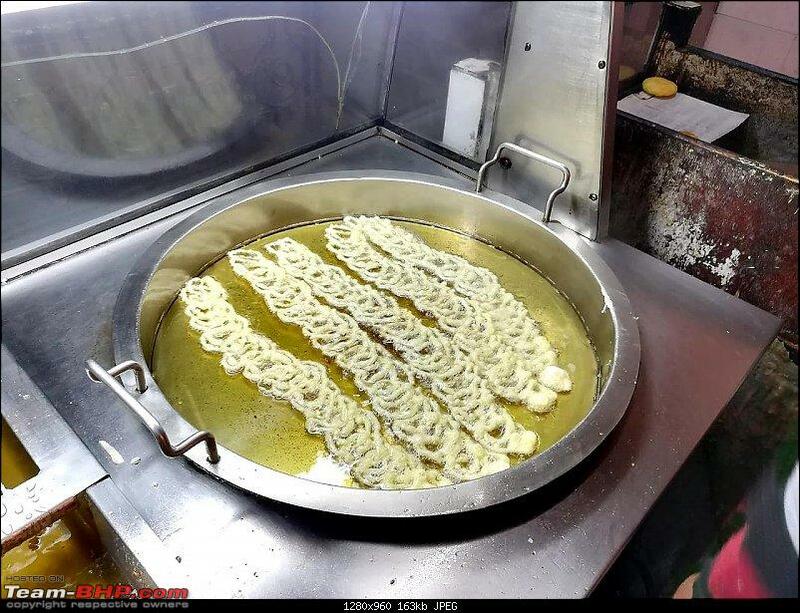 The jalebis were simply out of this world. Thank you Rakesh! Last edited by Vikram Arya : 17th March 2019 at 08:30. 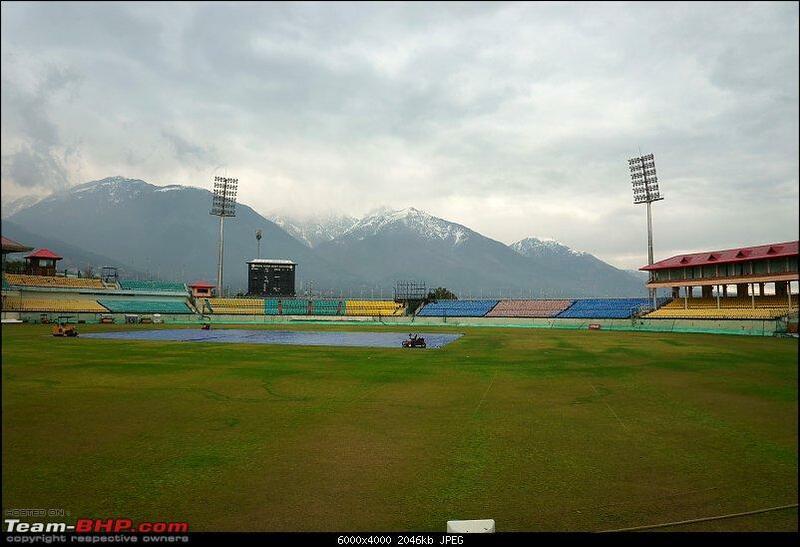 We were supposed to visit Dharamshala and also move our base to the circuit house there as my in-laws, wife & daughter were to catch the morning flight back to Delhi the next day from Gaggal airport which is a 30 minute drive from the circuit house in Dharamshala. 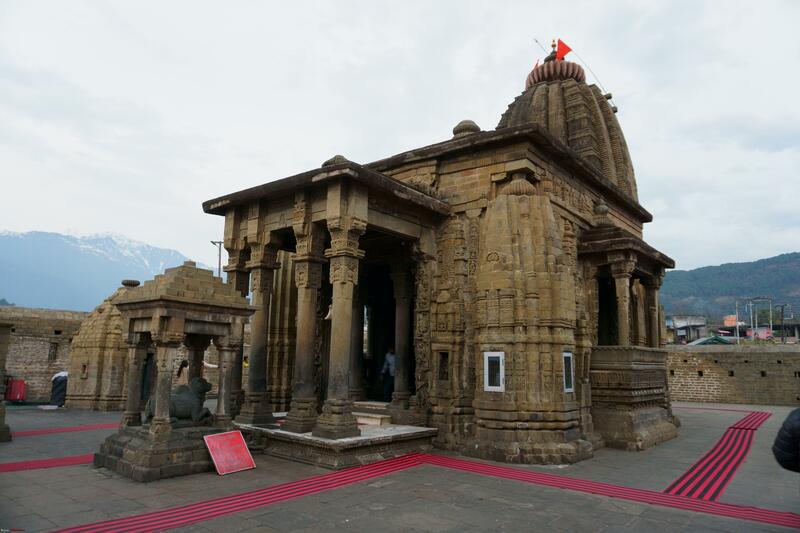 However, I wanted to drive up to the old Vindhayavasini temple located about 15 kms from Palampur as was suggested by our cabbie. I along with my wife left the resort at 7:00am in the morning. 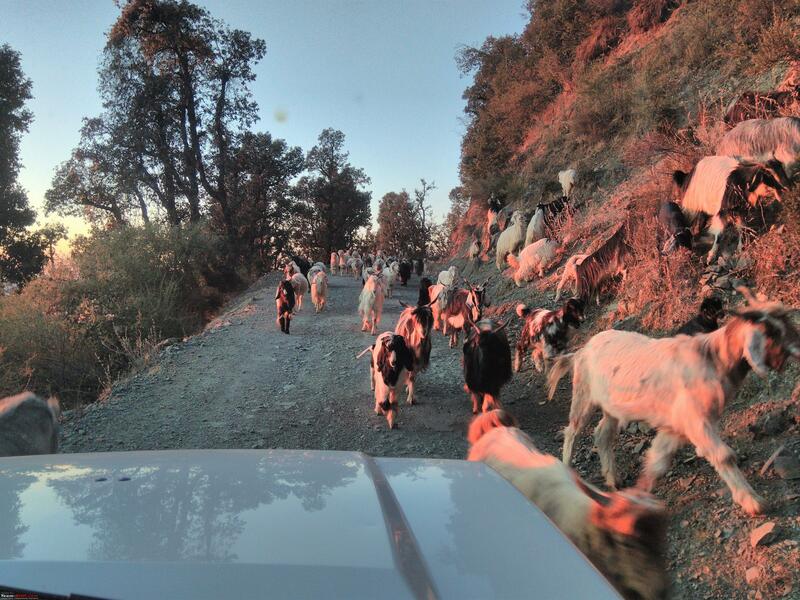 For going to the temple, you have to turn left on the Palampur road and follow a narrow strip of tarmac through a thinly populated area. There are no sign boards to follow therefore I followed directions diligently as sketched on a piece of paper by our cabbie, Rakesh. This very narrow strip of road zig zags for a few kilometers and passes through couple of small villages then one needs to take a left after about 6 or 7 kms. 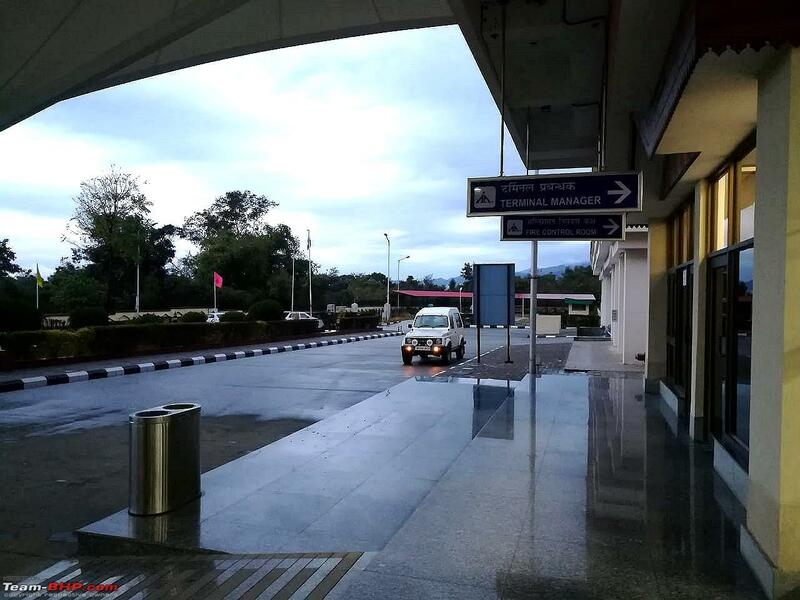 From here onwards the tarmac is unpaved. 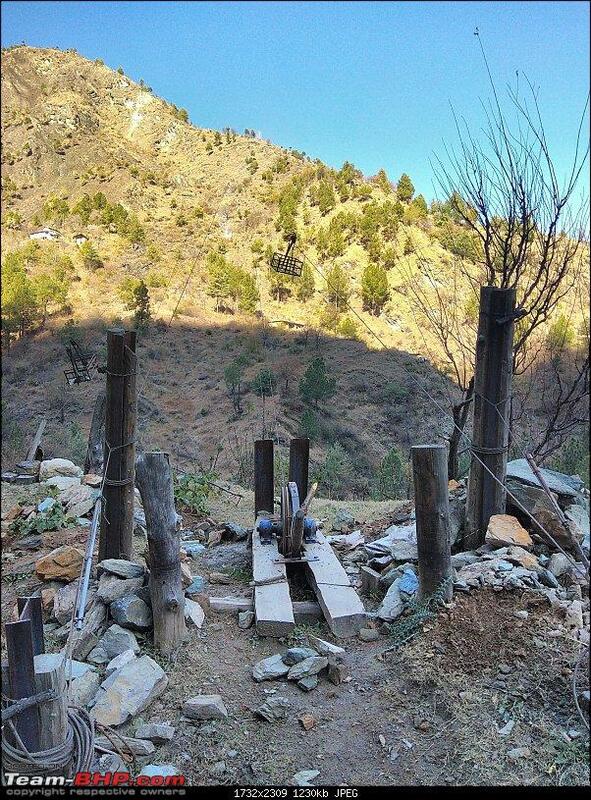 The road leading to the temple is not maintained as there is no traffic on this path other than a couple of Boleros/other small trucks carrying equipment/material/people for a micro hydel project which is located about 3 kms. from the temple. First things first; I locked my hubs on the front drive shaft; tales of drivers having to get out and lock the hubs when they are stuck are galore and I didn’t want to be one. The path is a reasonable smooth & starts at a fairly easy grade for the first three or four kilometres. After a fork from where you have to take the trail going up, the grade starts to increase, and the surface becomes fairly rough at places (and this is where the body on frame Gypsy shines). Gypsy continued in 1st gear and I kept a steady pace (10 to 12kph) even when there was a relatively easy incline. You have to resist the temptation to shift down to a higher gear as the revs will drop and you will lose the momentum and torque. I did stop at a few places to click some pictures and to also marvel at the view both of the valley down below and the mountains up above. I also noticed that the trail was littered with rocks at a few places that ostensibly were dislodged either because of the wild animals moving on the slopes or the rocks coming lose on account of rain/snow. 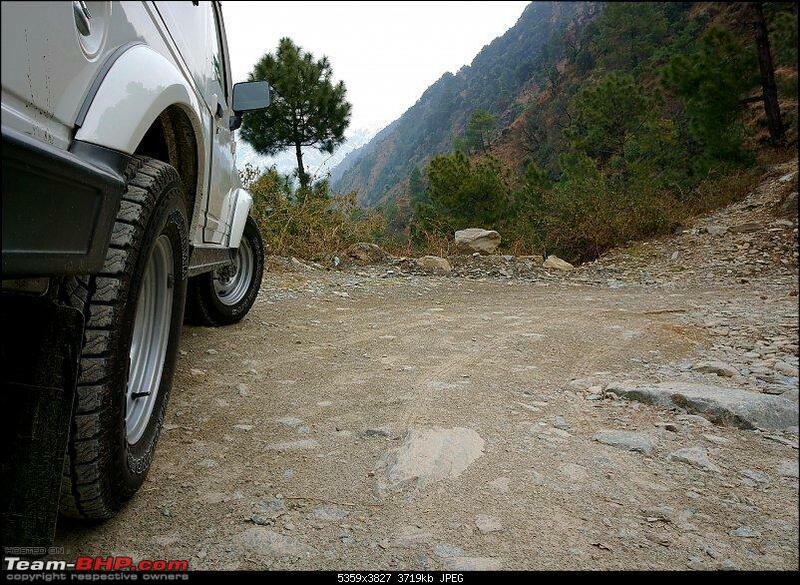 I had mounted the GoPro on the hood to capture this fascinating climb however later on I realised that the footage was shaky as the hood was flexing on account of uneven tarmac. Thankfully on my way down I had mounted the GoPro on the door and that footage has come out great. Unfortunately, it was an overcast day with some haze floating so the great picture quality that I was expecting did not materialize. 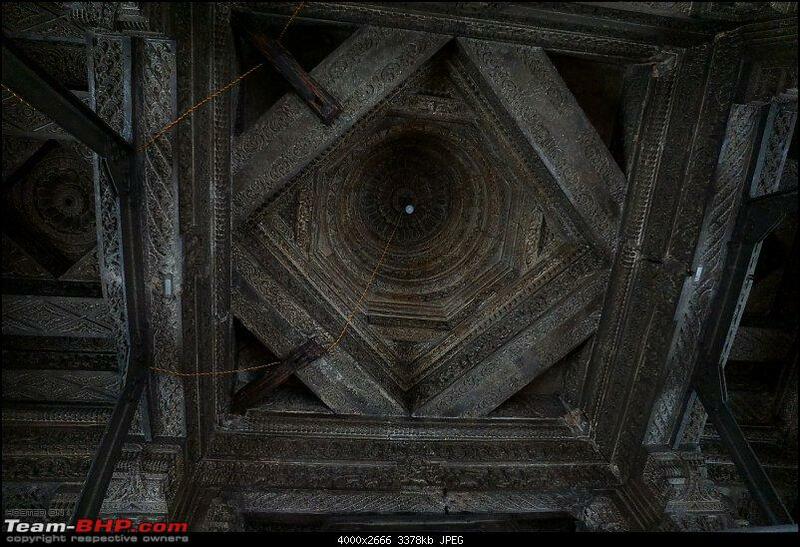 I’m enclosing a couple of video that will give you some idea of the climb. I’m enclosing the YouTube link for the folks who may want to watch the entire footage of climb & the drive down. After we reached at the base of the temple we climbed the 50 odd steps to the temple and found the door closed. After a couple of minutes the Pujari came from his living quarters and allowed us to offer our prayers. Turned out the he was from Uttarakhand and come here after more than 20 years ago. 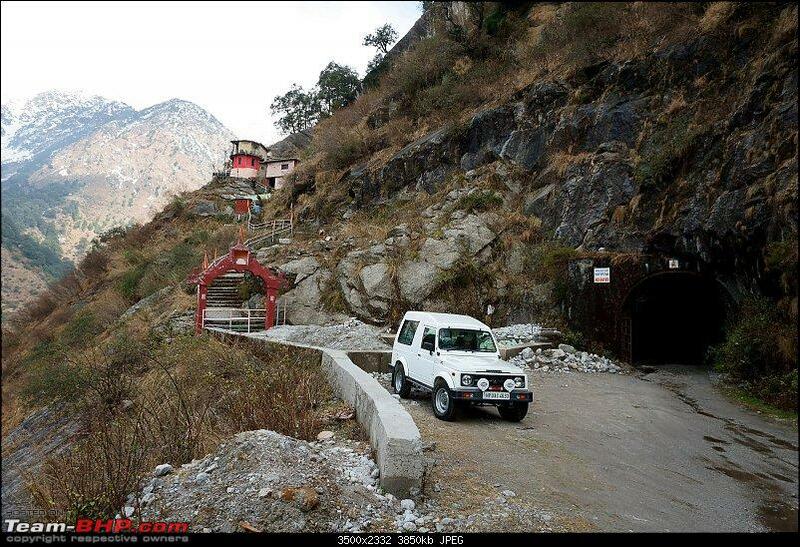 He also told us the about the Vindhyavasini Devi in detail. After paying obeisance to the Vindhyavasini Ma and thanking the panditji we headed down. 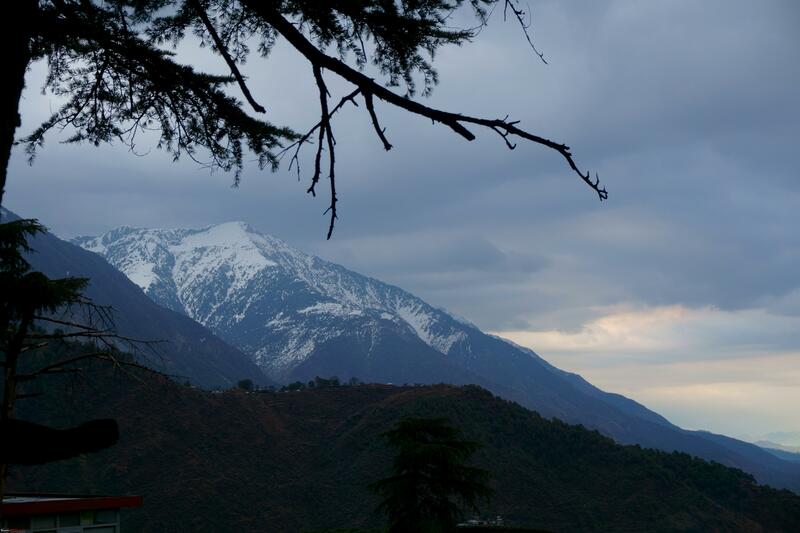 We were back at the resort by 11:30 and quickly headed to Dharamshala after checking out. Last edited by Vikram Arya : 17th March 2019 at 06:16. 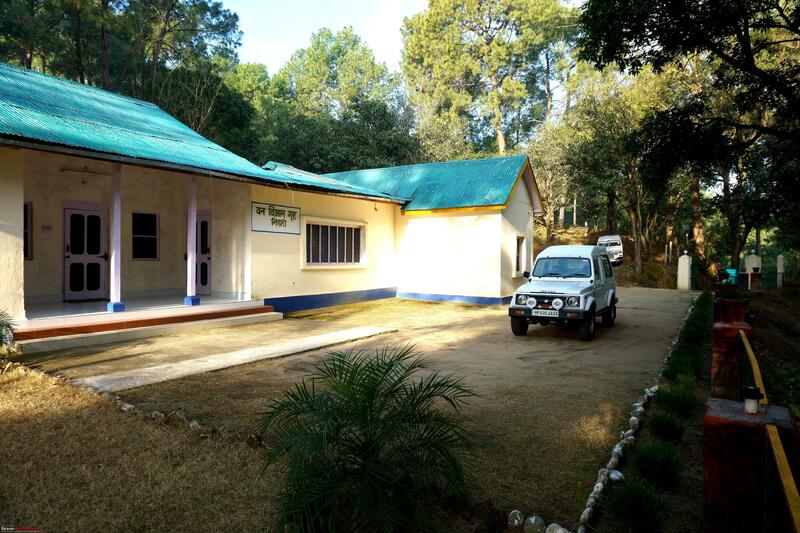 We reached Dharamshala by 12:30pm and checked in the circuit house which is located at Chilgaadi. 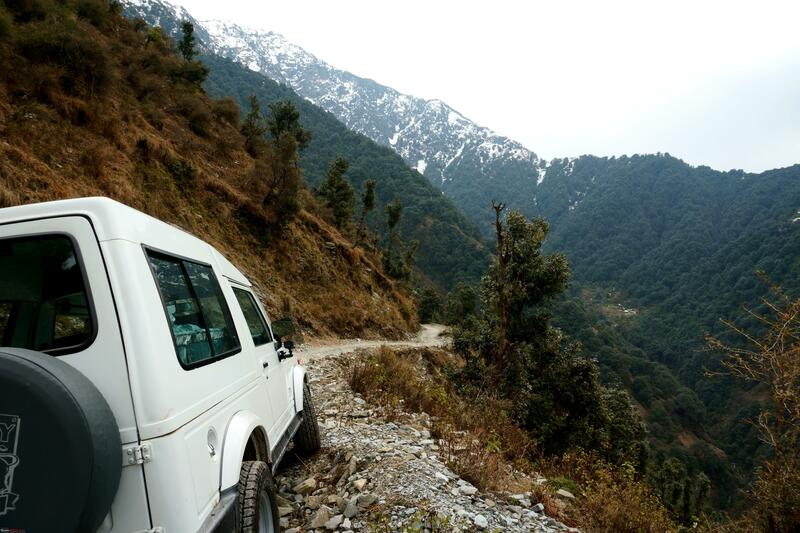 After keeping the luggage in our respective rooms, we boarded the cab and headed to McLeod Ganj. 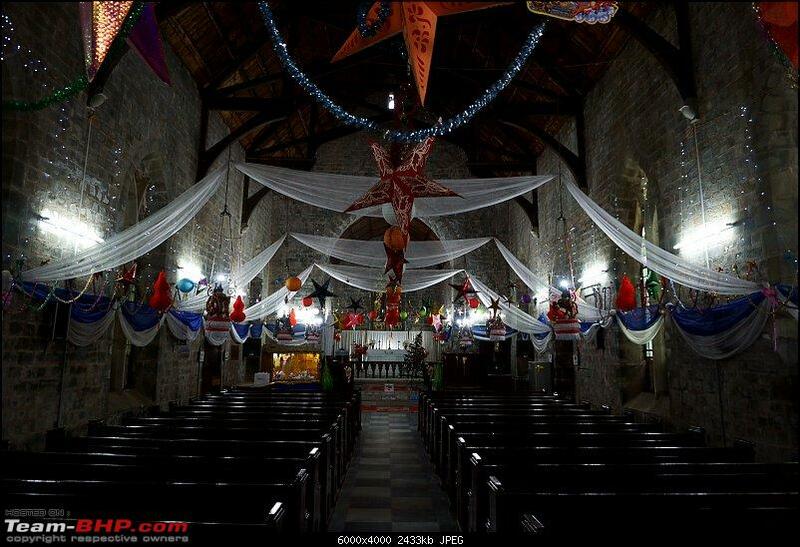 On the way we came across an old Anglican, St. John church that was built in 1852. We stopped to have a look and also click a few pictures when the heavens opened up and drenched us. 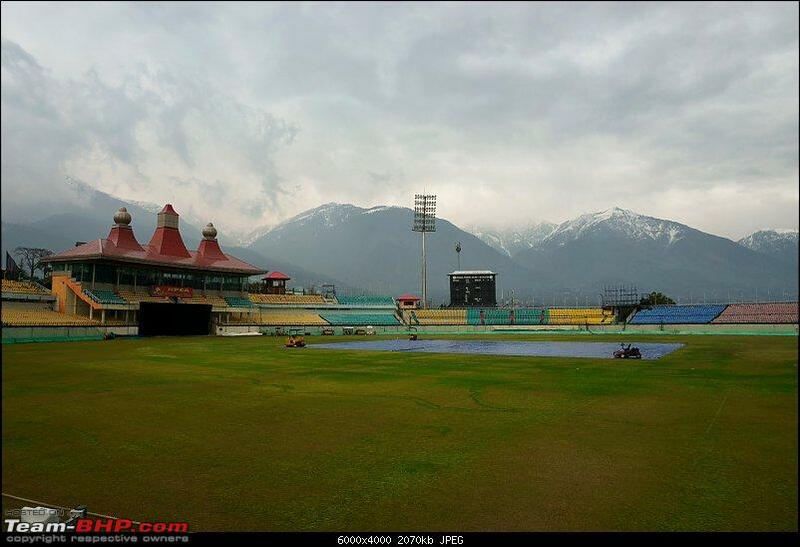 I may also mention that Dharamshala receives on an average 120 inches of rainfall a year. As we drove to the main town square, all of us were hungry as we had not stopped for lunch. We decided to go to a nice Tibetan coffee shop that was serving some very nice local (Kangra) green tea along with pastries and some banana bread. Pangs of hunger subsided to an extent. 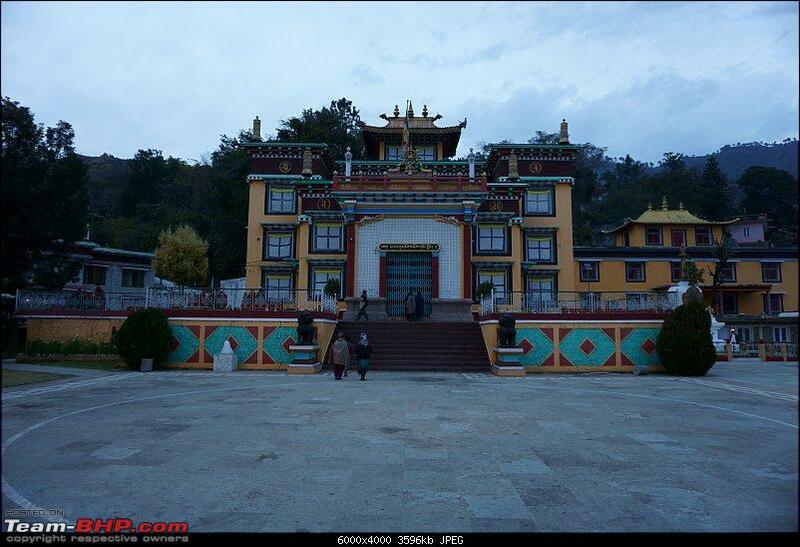 The rain had stopped and we walked to the main Tibetan temple located just off the road. 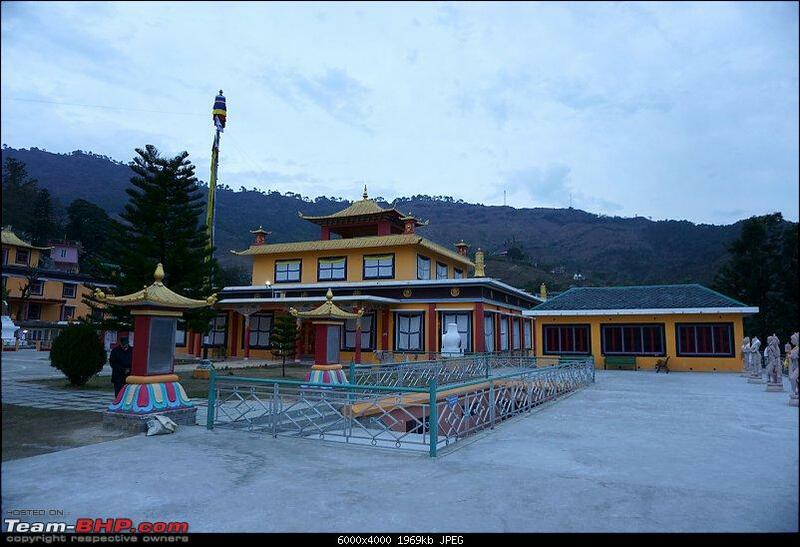 It is a large complex where His Holiness Dalai Lama holds congregation, a few times in a year. 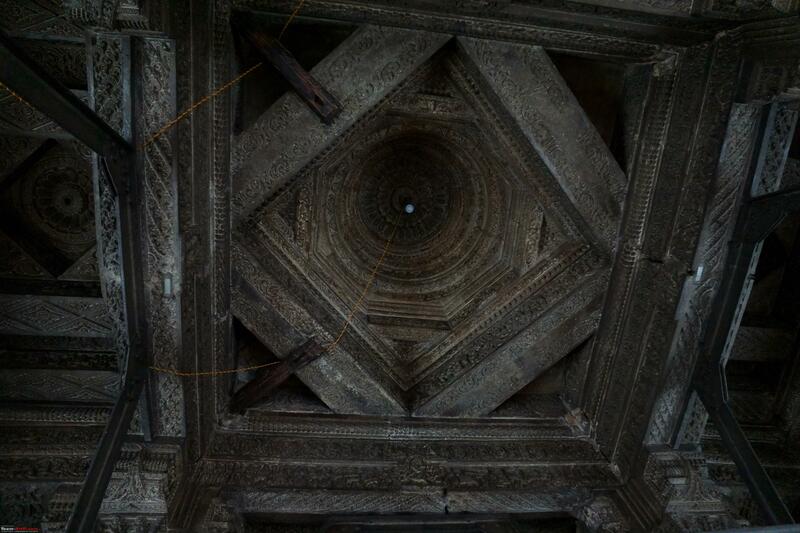 As we were making the round of the temple complex, a thick envelope of fog surrounded the complex. 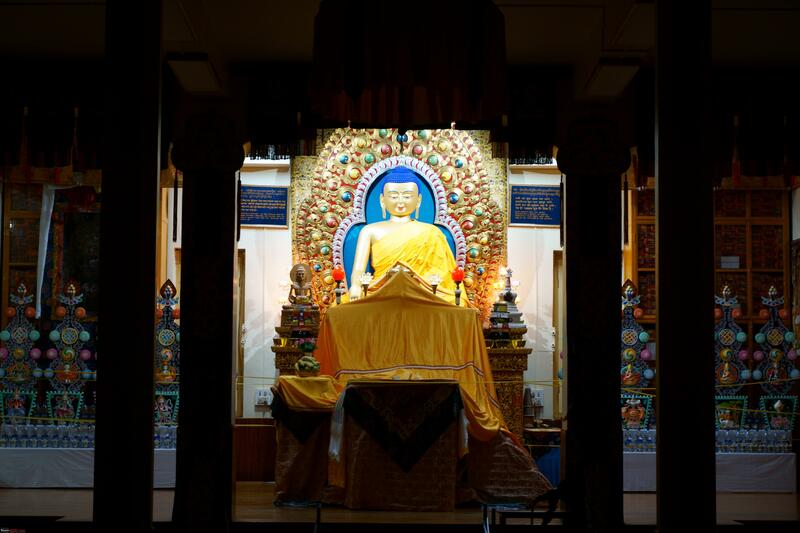 One of the reasons that my daughter and wife were keen to visit Dharamshala was to get an audience with His Holiness but it was not to be as he was out of the country. 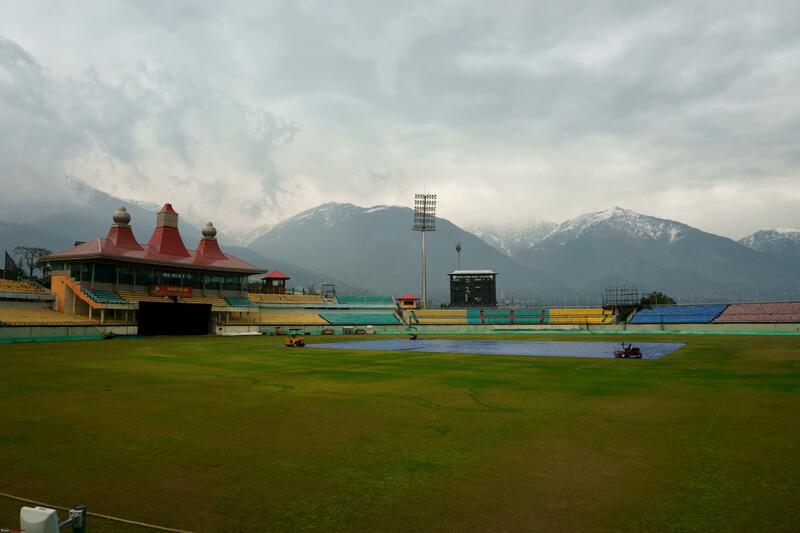 After spending a couple of hours there we headed out from McLeodganj down to the main town to have a look at supposedly the most beautiful cricket stadium in the world. It again stared to rain and we were soaked by the time we walked up to the stands. After braving the rain and snapping a few clicks, we sprinted back to the cab. On a side note I was never a Cricket enthusiast; last time I had watched a cricket match was back in 2006 and subsequently my interest in Cricket has all but vanished. 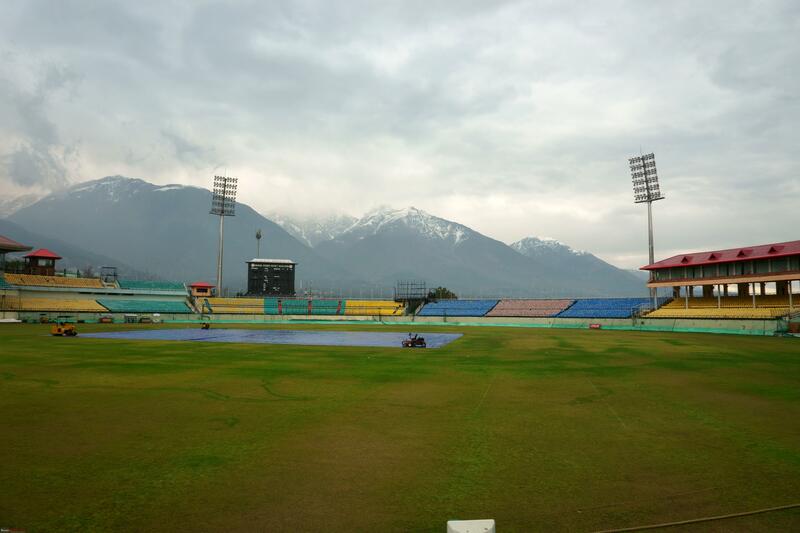 I must however say that this stadium is indeed beautiful with a majestic backdrop of Dhauladhars and it will be quite a treat to watch our lads play here. We were invited to dinner by one of my mom’s cousins who had recently constructed a huge house on the outskirts of the town. 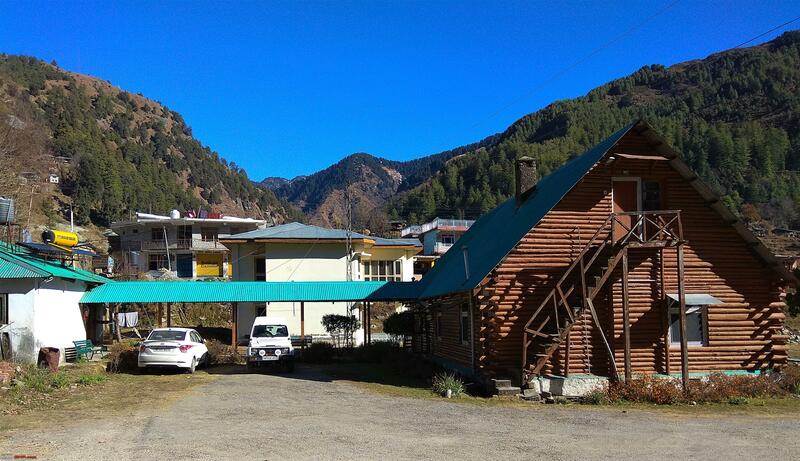 After looking at the property we sat down for a sumptuous spread of local Himachali cuisine and it was delicious. We headed back to circuit house at 10:30pm and retired as everyone except me & my brother were to get on a plane the next morning. 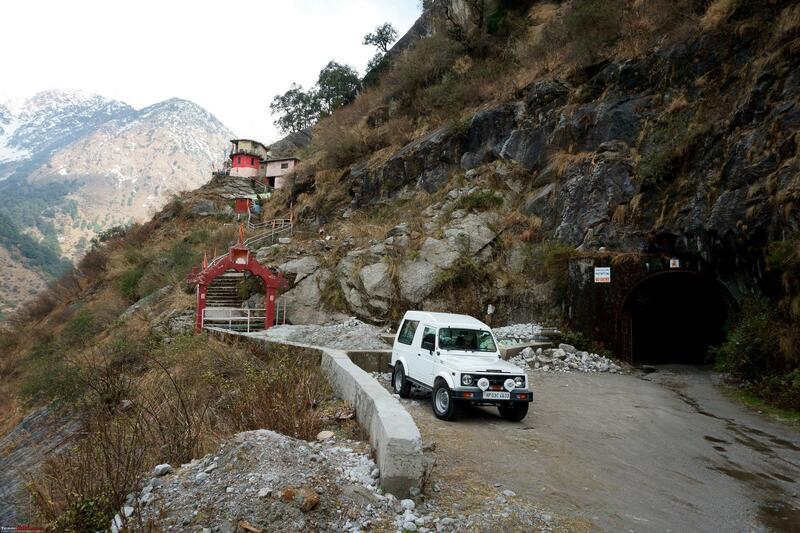 I accompanied the cab to the Kangra/Gaggal airport at 6:00am. 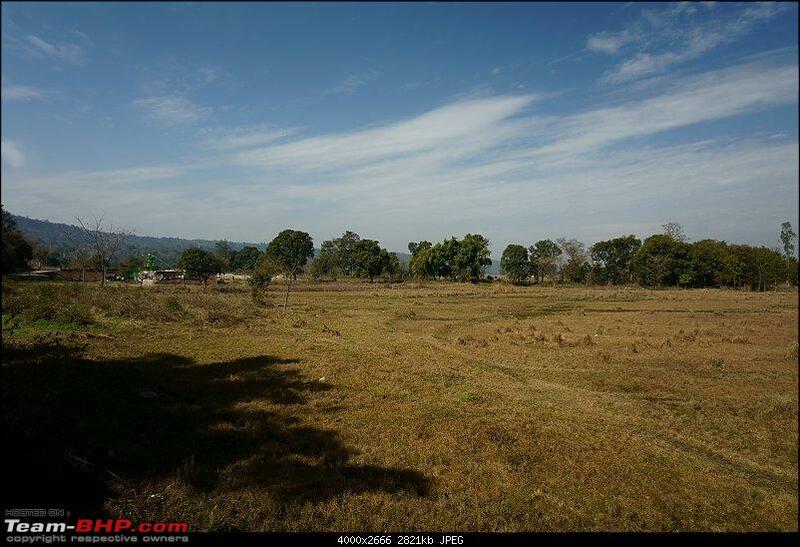 There are 3 flights to Delhi every day from Gaggal/Kangra airport. The road leading up to the airport however was pretty bad. 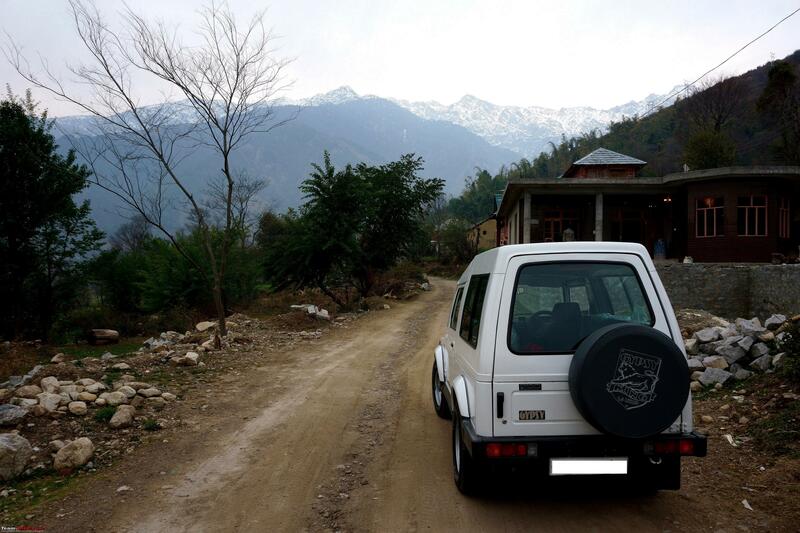 After saying bye to the family, both I & my brother headed back to Dharamshala as I needed to meet with an old friend. 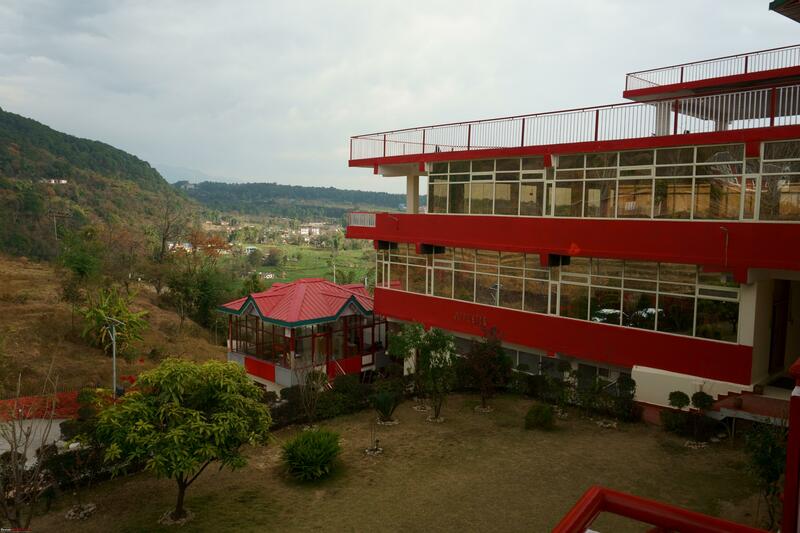 We had lunch at the restaurant of HPTDC Dhauladhar hotel and were ready to head out at 3pm. I decided that we will drive until it is dark and then call it a day. 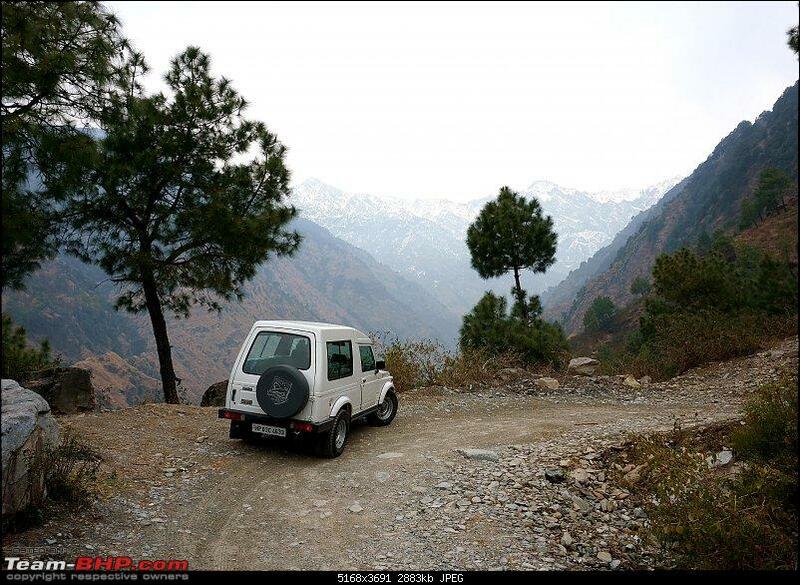 We left Dharamshala at 3:30pm and drove on to Hamirpur taking a detour from Dadh via Thural. 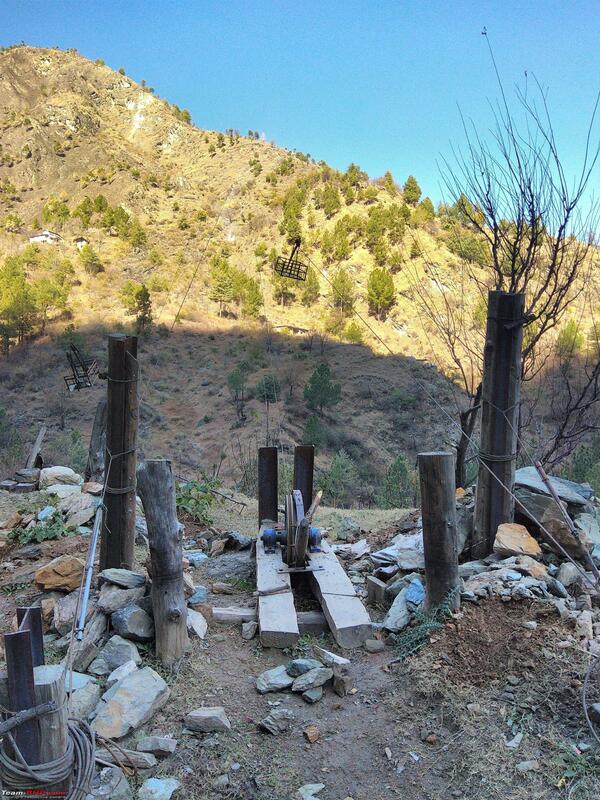 This was a rural road and it gave us a nice snap shot of the Himachali village life. 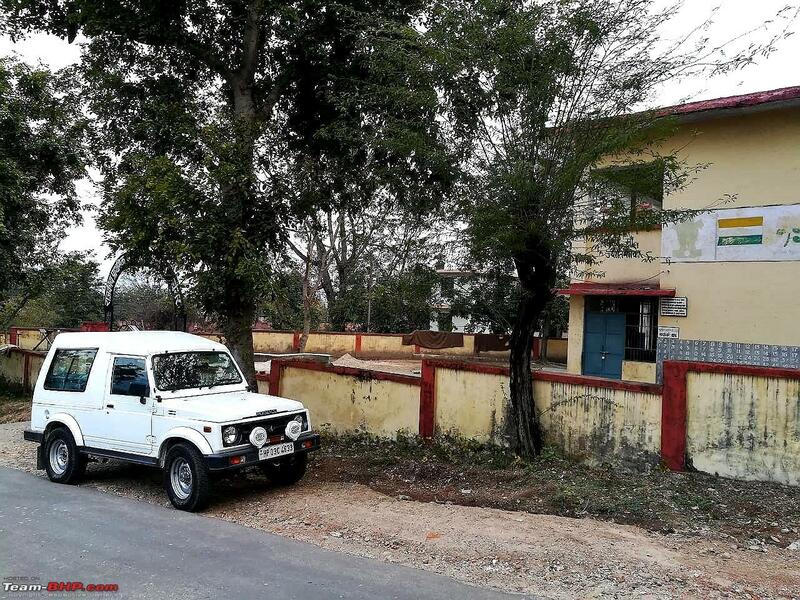 I was amazed to find cars such as the new Suzuki Baleno, Honda Amaze, Mahindra Bolero & Tata Safari parked in addition to the ubiquitous Maruti Alto parked besides the village houses. 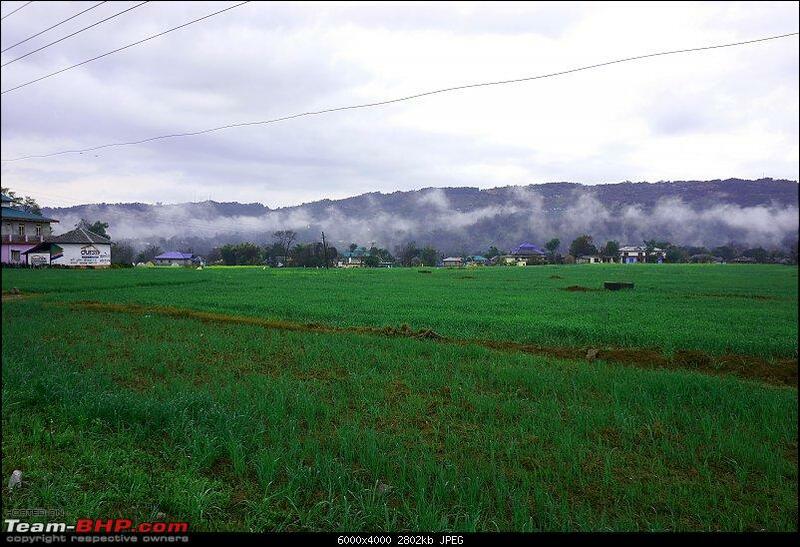 It had just rained in the morning, so the countryside was lush green. 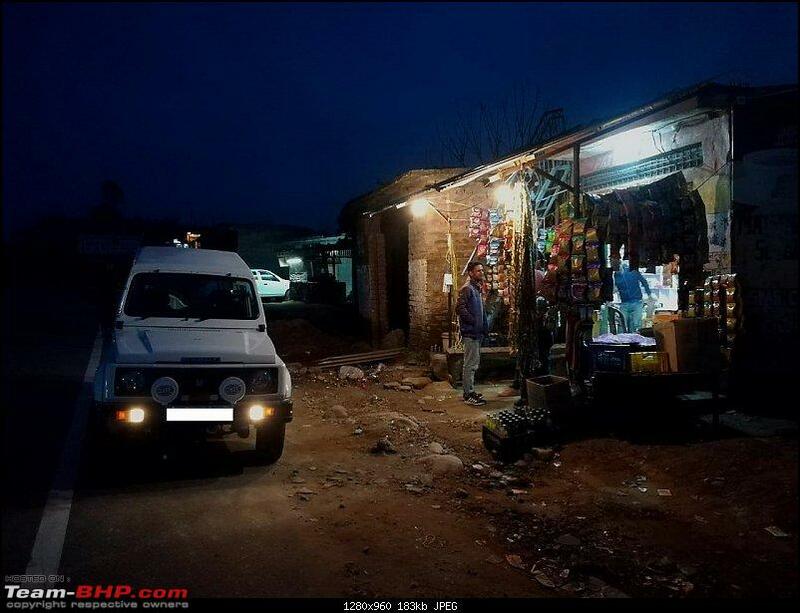 We stopped at a small road side shop to get some tea and got talking to the boys sitting there. Both were BSc student and told me that they travel 25 km one way to the nearest college. I started talking about the local/state politics and the lads were very much aware about the happenings on local/state/national level and had strong opinion about several issues. We said goodbye to the boys, took on the wheel and drove off. As it was getting quite dark we decided to halt for the night at the forest rest house at Nihari which is just before Ghumarwin. I pulled up at the rest house at almost 8pm. The care taker was there and turned out that there was no other guest at the rest house. In about 45 minutes he prepared a simple fare of dal, sabzi and chapatis. I took a shower and immediately felt rejuvenated. We had a quite dinner and sat outside to gaze at the stars. I was feeling sleepy and so decided it to call it a day at 10:30pm. 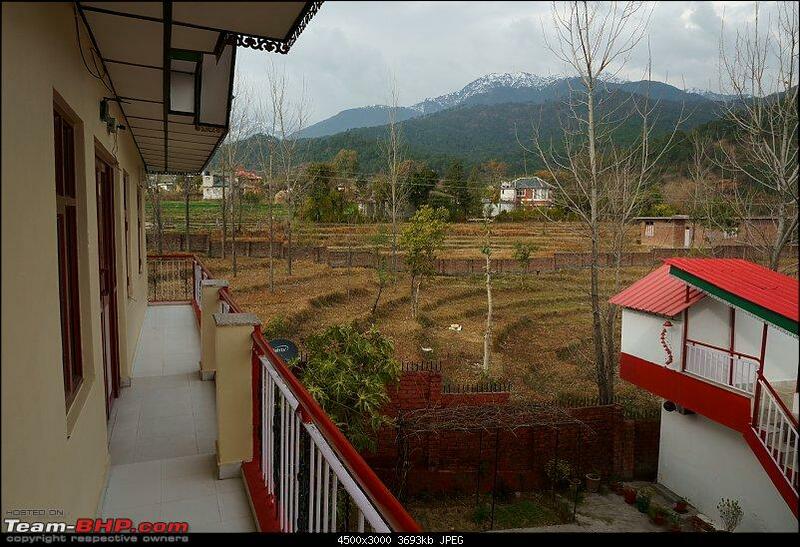 Got up at 6:30am and asked the caretaker to place chairs in the lawn for the morning cup of tea. Had two cups of piping hot tea with some biscuits that we were carrying. Refreshed, we went for a short walk in the forest. It was so relaxing to listen to the breeze and bird chirping. After spending about an hour in the forest we headed back to the rest house. After a quick shower followed by breakfast of eggs, packed our stuff and we were off at 10am. 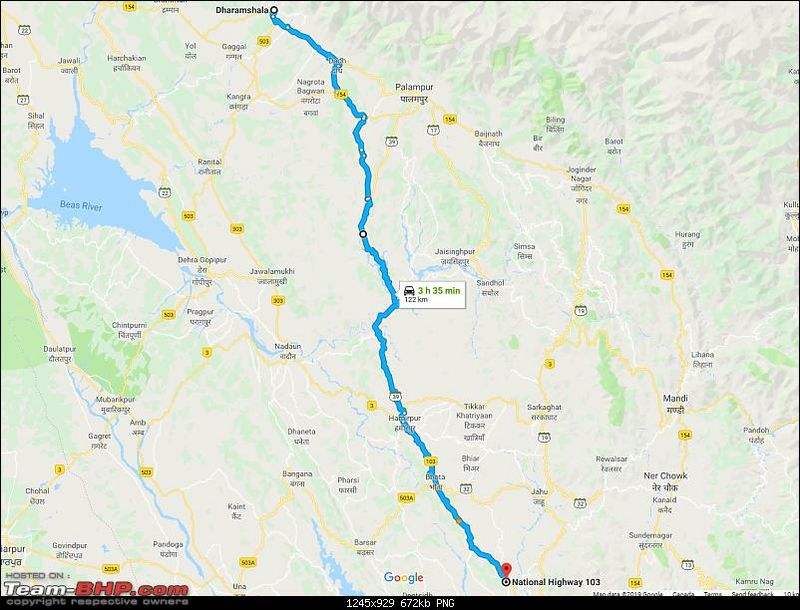 Although I could have turned left at Ghagas to avoid the Bilaspur town, I decided to turn right instead and drove up to the town. I wanted to visit my old primary school where I had studied till grade 5. I was dismayed to find that nothing much has changed in last 35 years. The condition of the building was symptomatic of what ails our Govt. schools or anything run by the government for that matter. 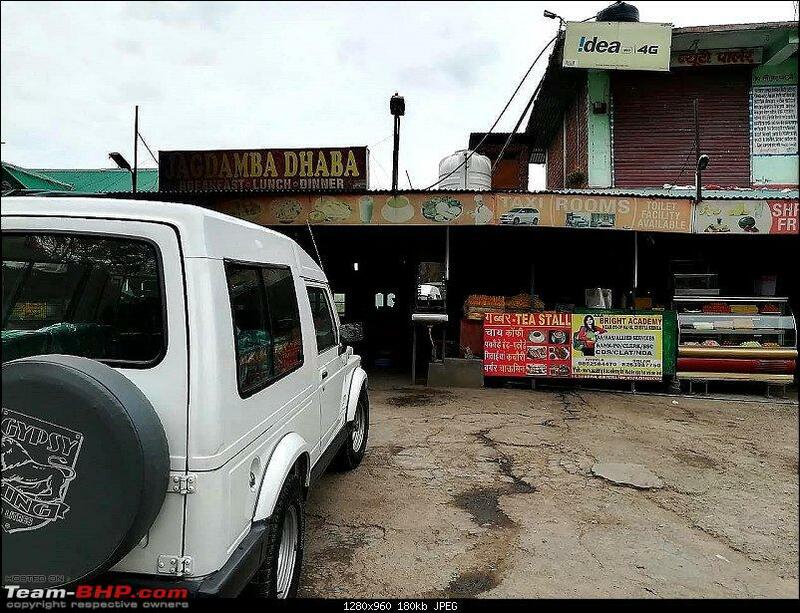 After a brief stop we drove on till we reached Bharadighat where we stopped for a quick tea break. I handed the key to my brother as I was feeling tired. 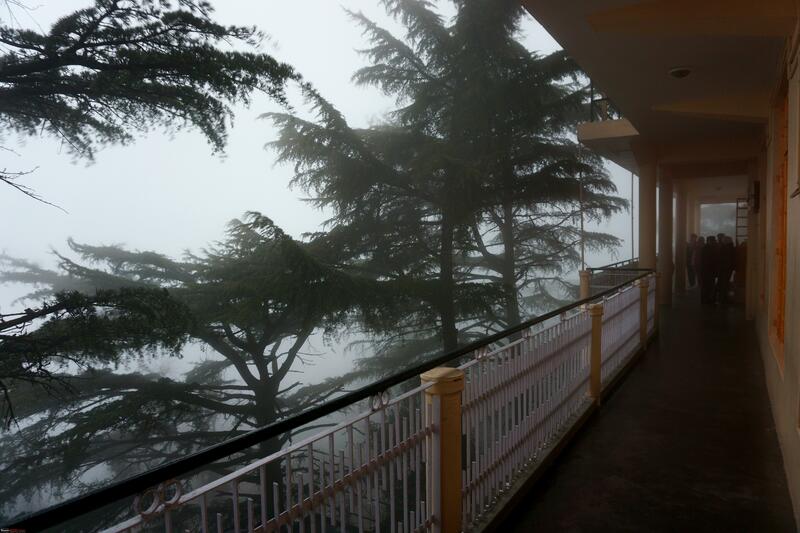 Rest of the drive from thereon was pretty uneventful and we pulled up at Shimla by 3pm. Last edited by Vikram Arya : 17th March 2019 at 08:46. 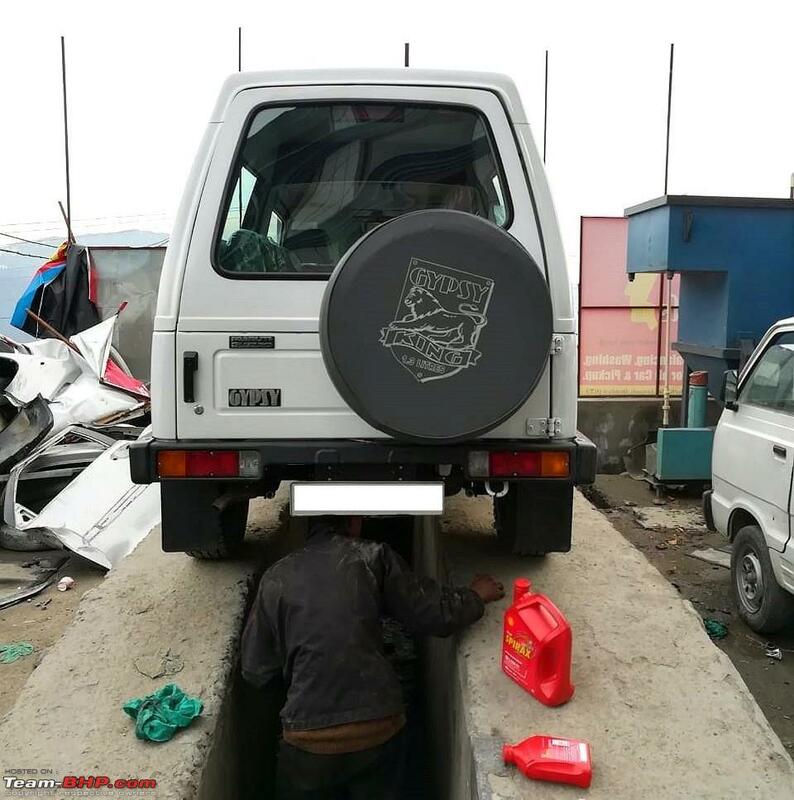 One question, isn't 17 psi too less for that road? We usually air down below 20 for extreme rocky paths. Looks like you had a good time in my neighbourhood. 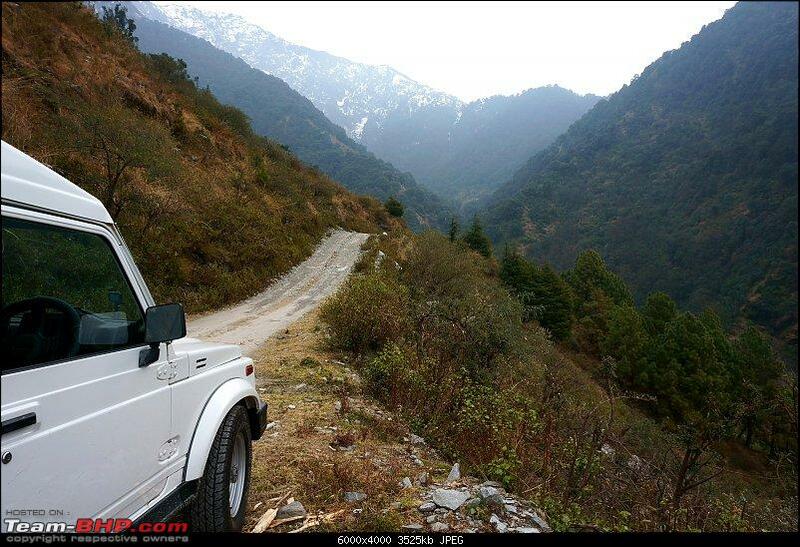 I am yet to visit Tirthan Valley but it sounds to be a great place. 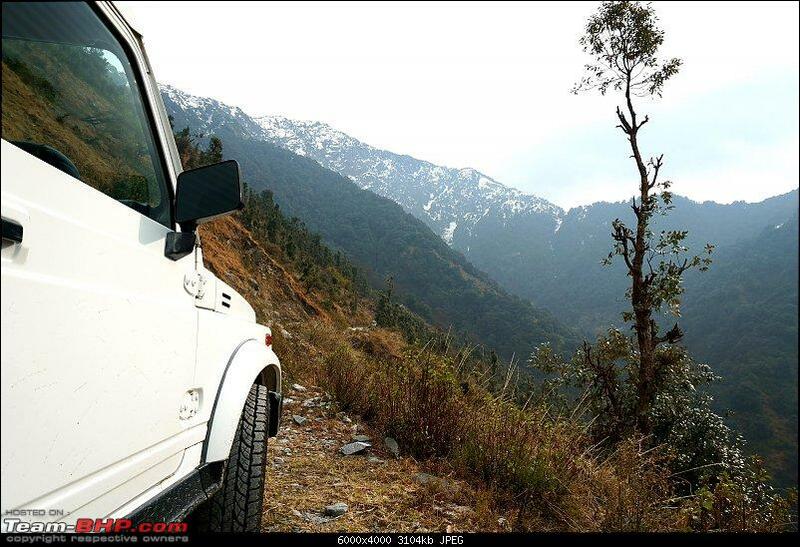 We visited Parashar Lake last year and that is also a great spot to visit near Mandi. 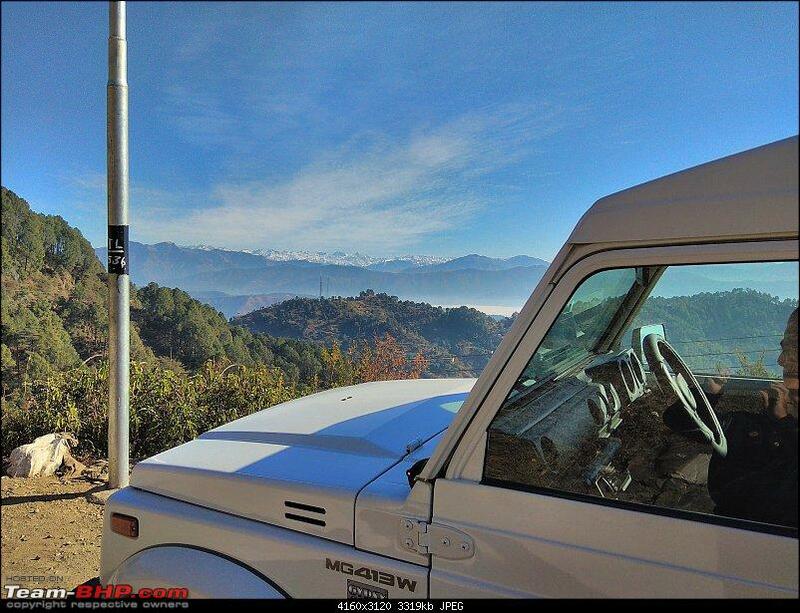 There's a spot just before Parashar Lake from where one can see most of the Dhauladhar Range. One of the most beautiful views I have seen in my escapades in my neighbourhood. 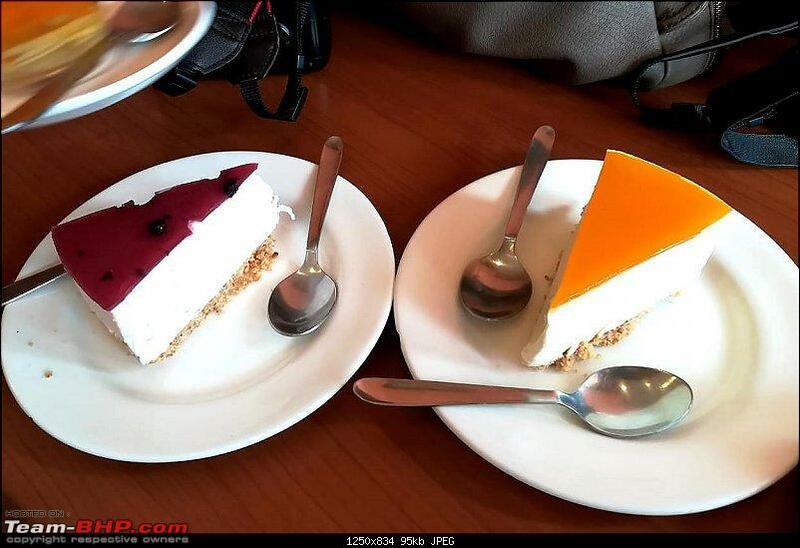 Next time, do stop by at Bir-Billing if you haven't yet. There's another treacherous road over there that Ringoism has detailed in his Marshal thread. 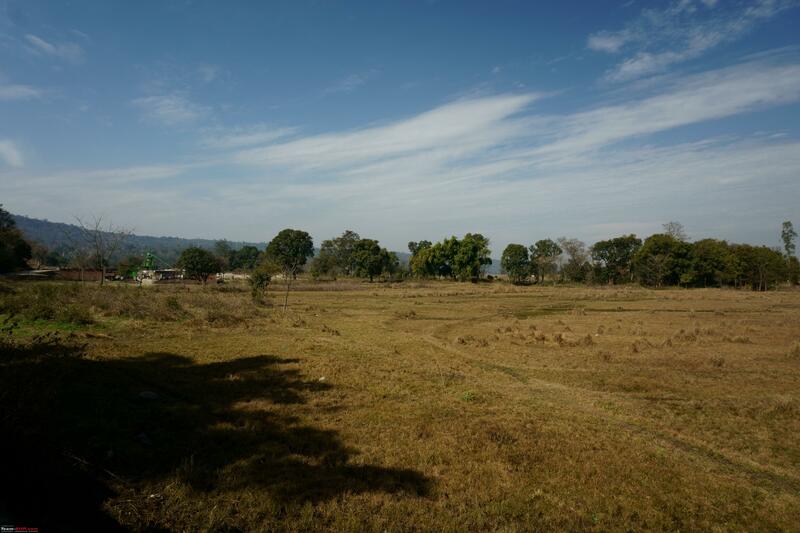 It goes to another very secluded village by the name of Rajgundha. 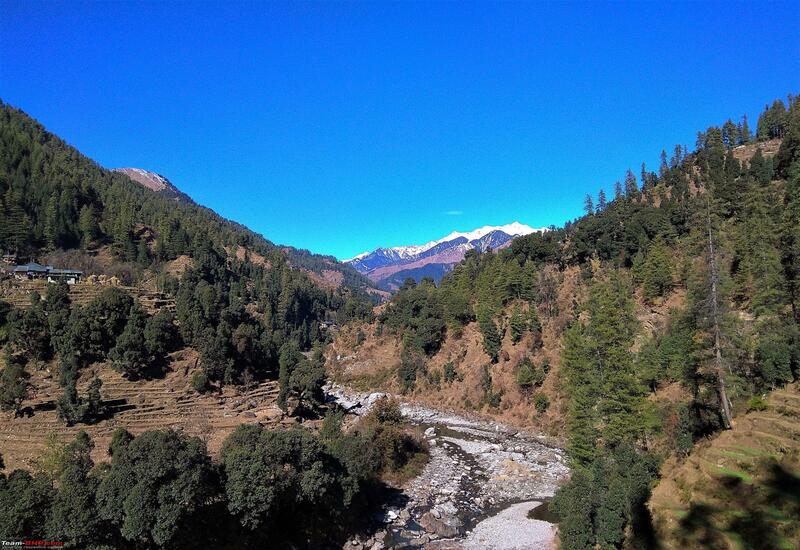 The same is also accessible by a trek from Barot side. 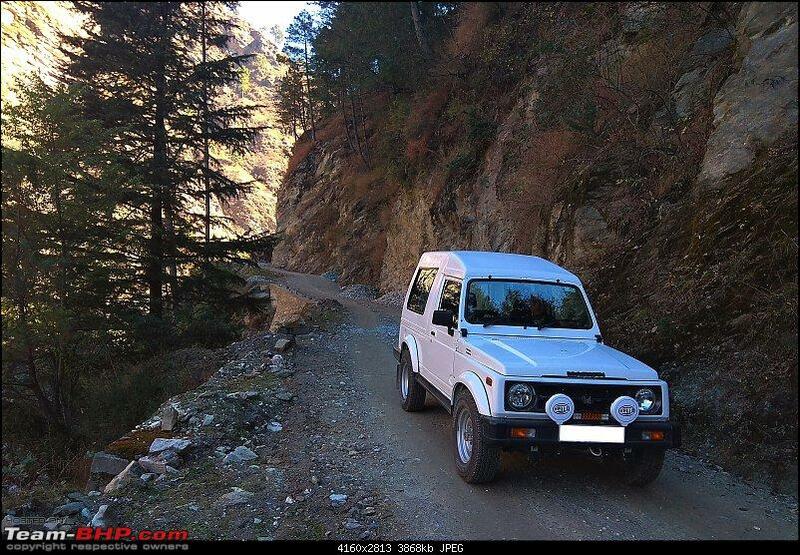 In fact one can cross-over from Barot to Billing in less than a day's trek which is around the time that it takes in a car. 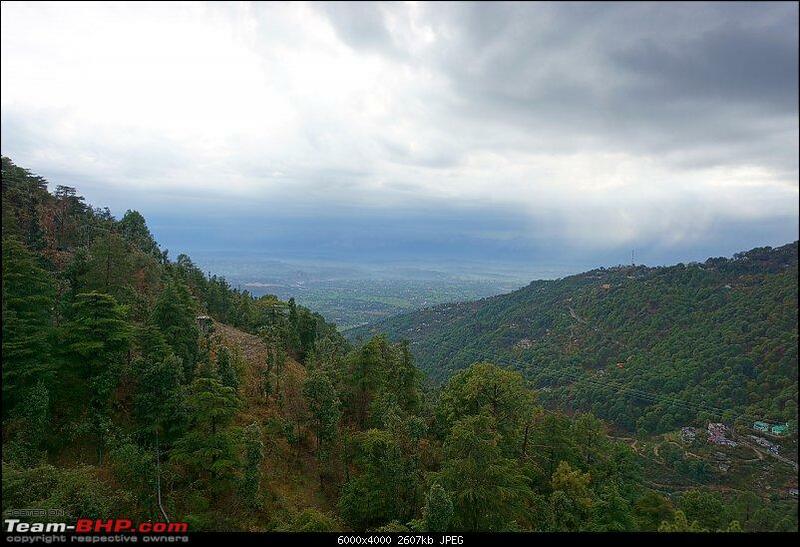 I live in Chauntra, a small village between Jogindernagar and Baijnath. If you are ever in the vicinity again, do give me a holler. P.S. - I am glad you loved the jalebis at Atulay. 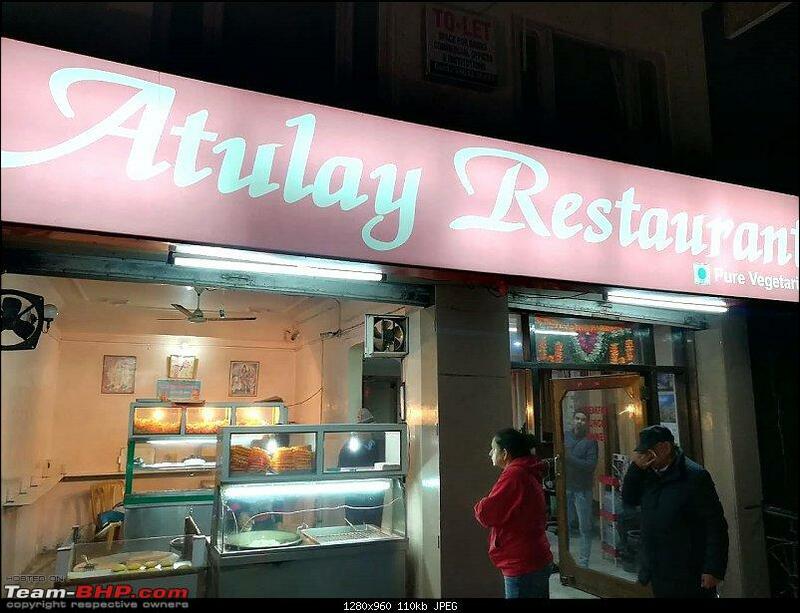 I'll pass on your wishes to the owner, who is a relative. Thank you BlackPearl. It was my first travelogue therefore I was a little anxious regarding my ability to sit down patiently and pen the experience down however I had to start somewhere. 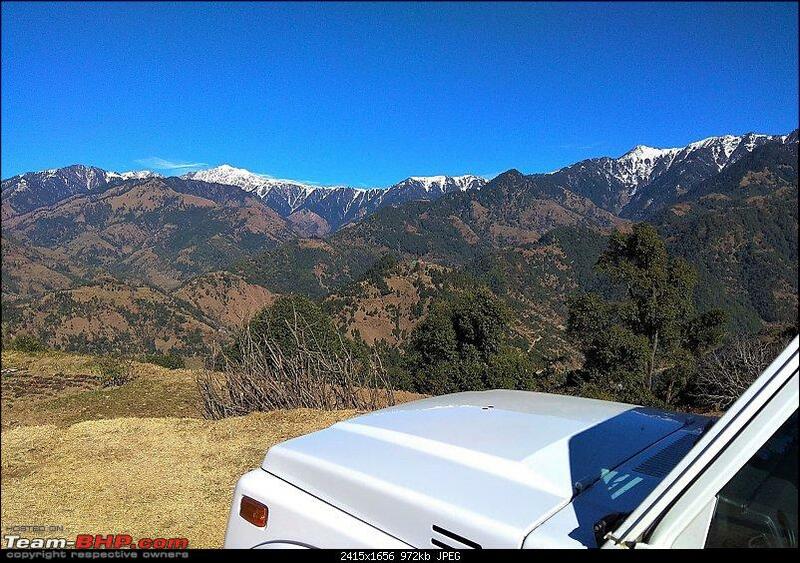 Tirthan Valley is beautiful however it is a quite a distance away from your base so you may want to combine it with a few other locations. You're an experienced traveler so I wouldn't be surprised if you do it sooner rather than later. As for the dirty Gypsy, I have somewhat of an OCD regarding keeping my vehicles clean (my car wash bills back here are through the roof as there is a lot of slush now a days on account of snow-melt) but your point is well taken . As for airing down my tires for a broken stretch of 35 odd kms, I found 17psi to be pretty reasonable in terms of the addition compliance that the tires provided. Gypsy's owners' manual specifies 1.4kg/cm square (19.9psi) for both front & rear tires for light loads. Most of the time I drive alone; this time there were two of us with couple of bags so that qualifies as light load. 17psi is actually not low enough for the tire to slip of the rim bead; some of my neighbours who do a lot of serious rock crawling air down to 10-12psi on their Wranglers & these are not even bead-lock wheels. 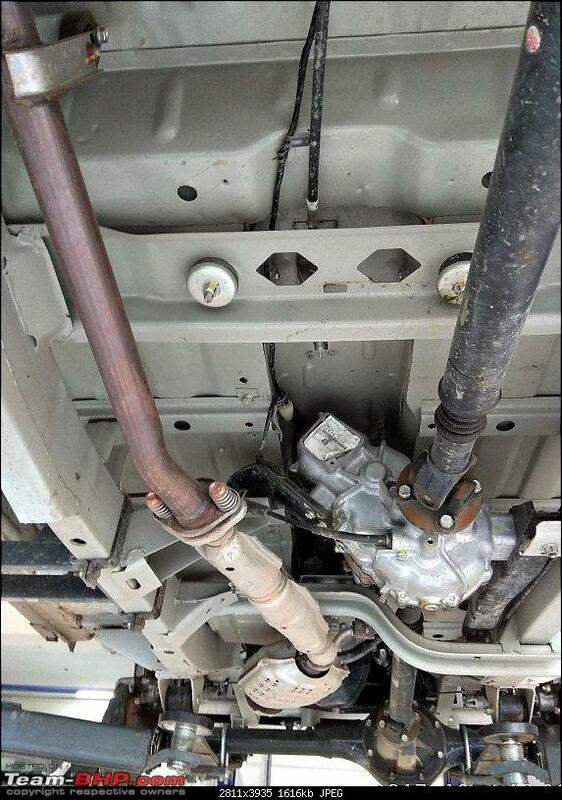 Next time you can try to go down to 17 or 18 psi & see the difference. Looks like you had a good time in my neighbourhood. 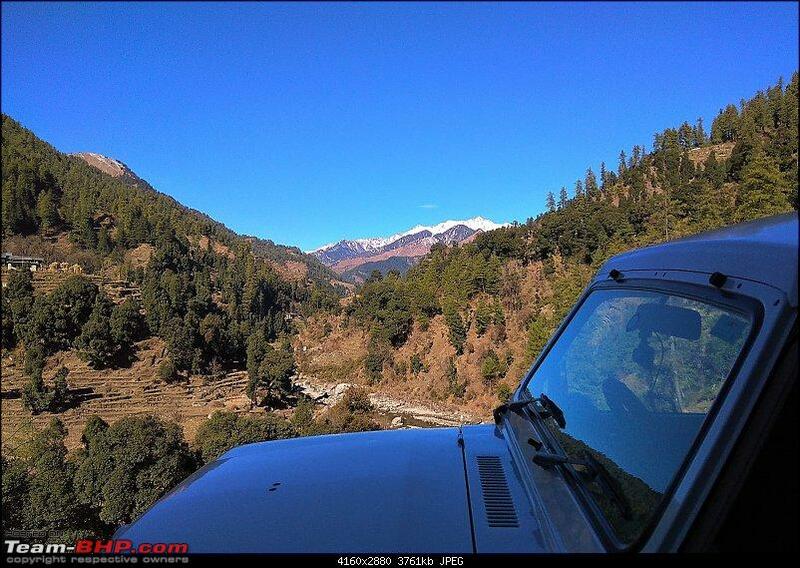 I am yet to visit Tirthan Valley but it sounds to be a great place. 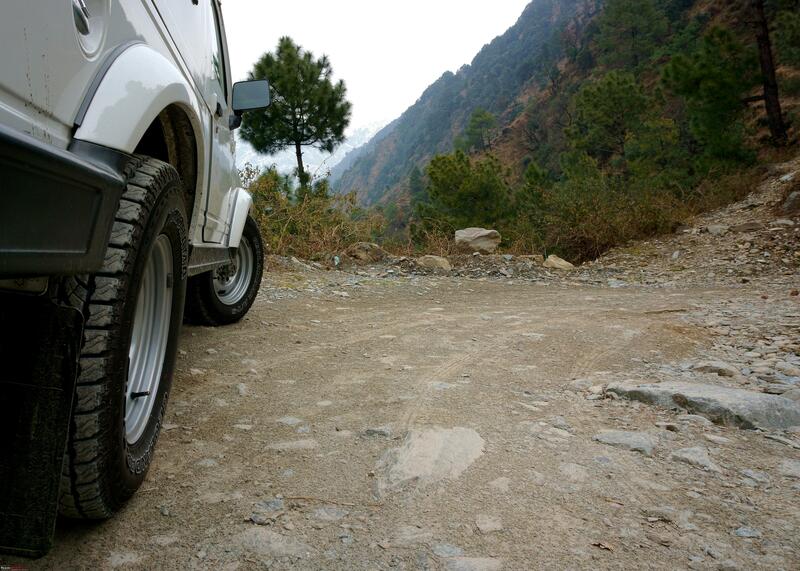 We visited Parashar Lake last year and that is also a great spot to visit near Mandi. .... 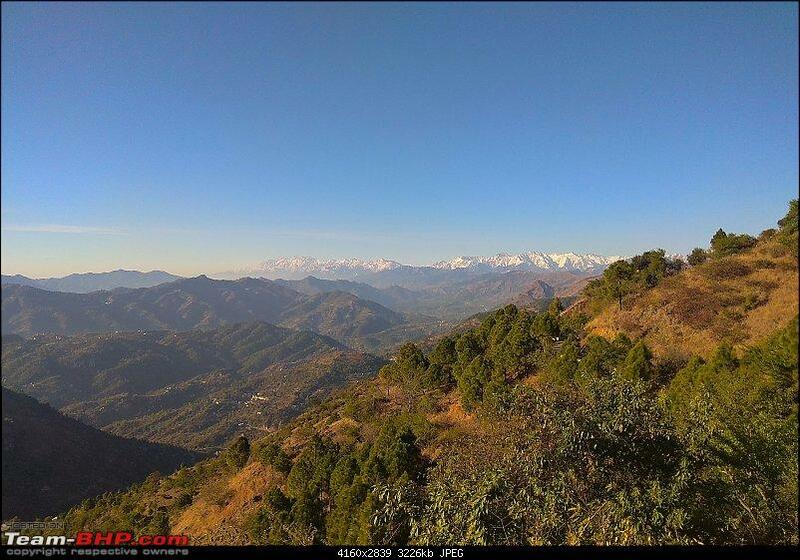 I live in Chauntra, a small village between Jogindernagar and Baijnath. If you are ever in the vicinity again, do give me a holler. Next time I'm in the area, I'll be glad to connect with you. 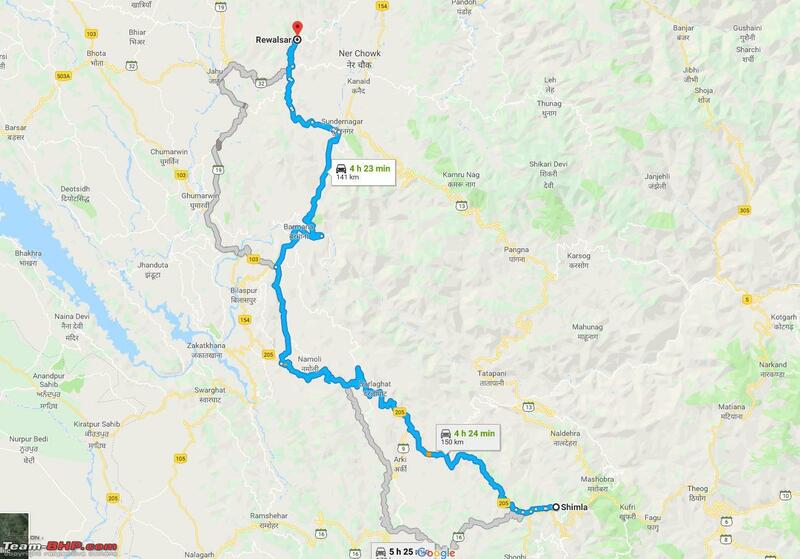 Yes I did see Eric's account of his travel to Rajgunda & that stretch looks very interesting so it is on my to do list. We actually had planned to go to Prashar however the road leading to Prashar was closed due to heavy snow fall and we had to abandon our plan. You do live in a very scenic environment buddy. I wish I knew as we passed your village on the way. 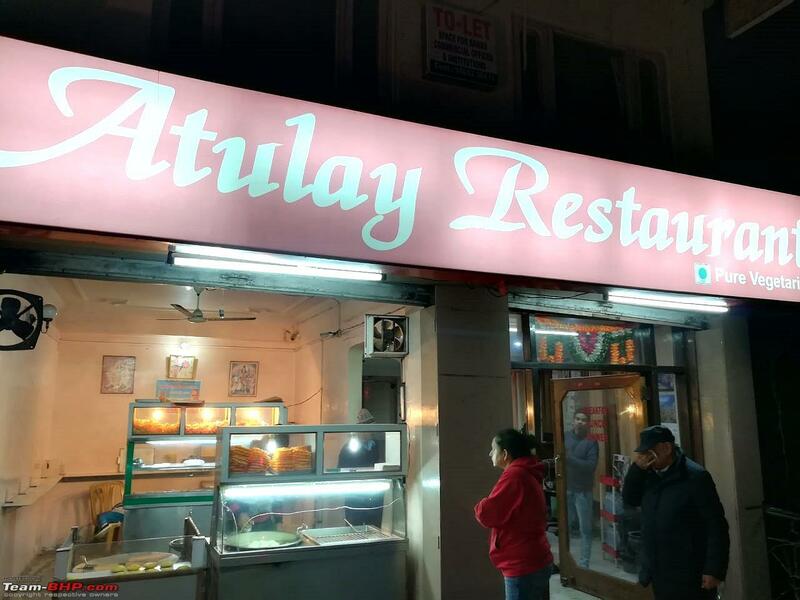 The fare that Atulay dishes out is indeed great & I'm glad that our cabbie told us about the place. 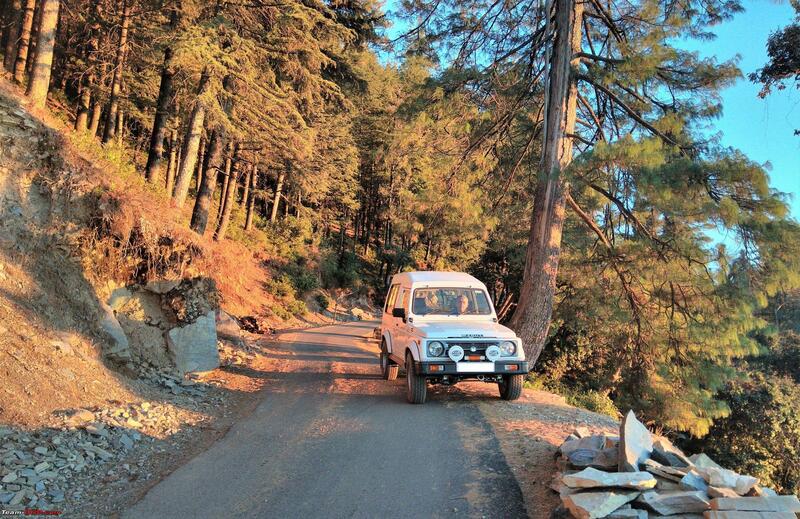 I actually have gone back to Kangra Valley after almost 25 years & it was a pleasant surprise to see the great condition that the roads are in that area as compared to the crappy roads that we have in Shimla. 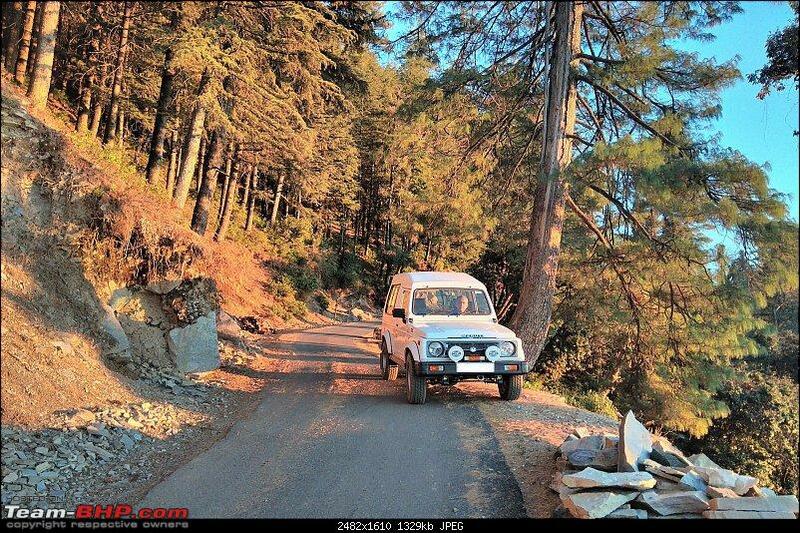 Glad to connect with a fellow Himachali on the forum. I too am a mountain man. And echo the same beckoning of the mountains calling to me. 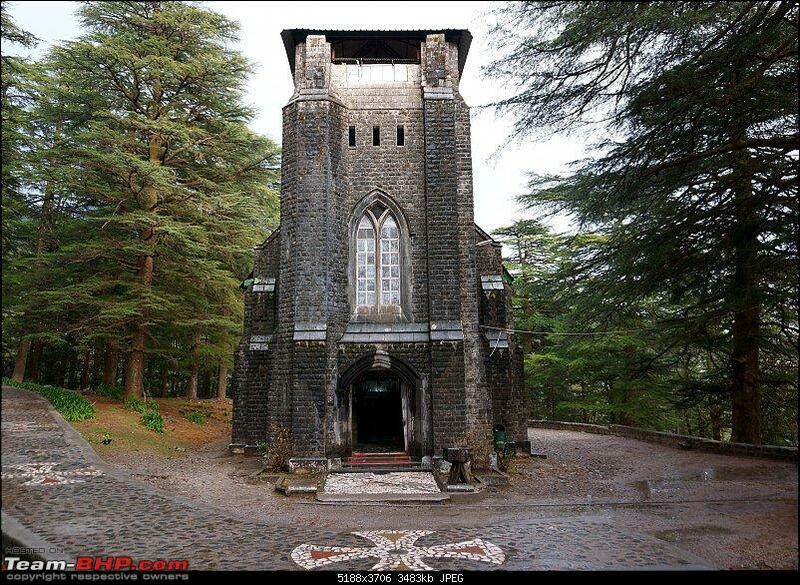 It wasn't until 2012 when I got posted at the mission hospital in Manali as a surgeon to realise my true beckoning. 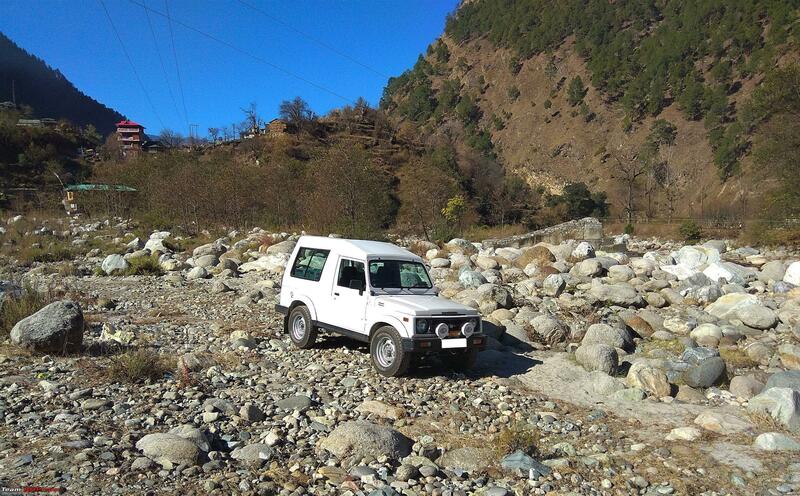 Have been to most places around Mandi, Kullu and Manali. 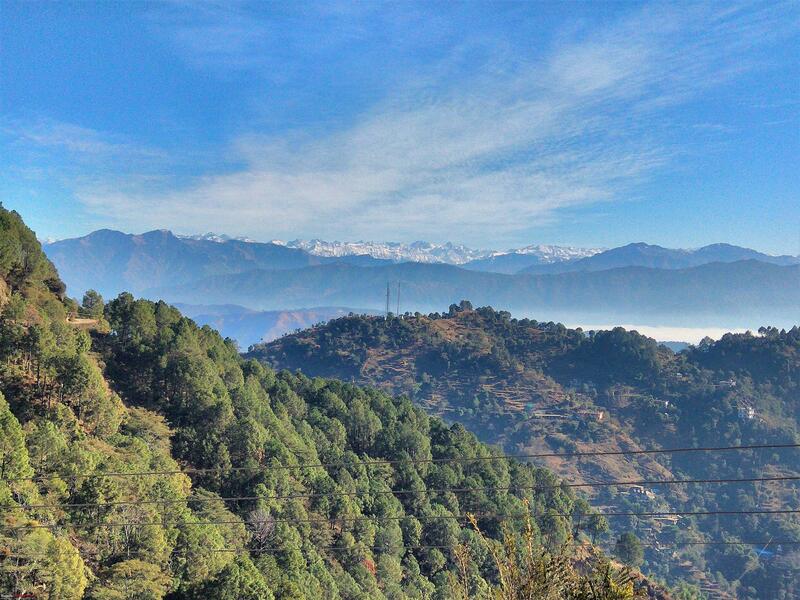 But the remote Himachal is actually the quintessential Himachal. Have got entangled in city life now and I keep planning my next escapade. Till then I satisfy myself reading such wonderful travelogues. A good trip and thanks for sharing. 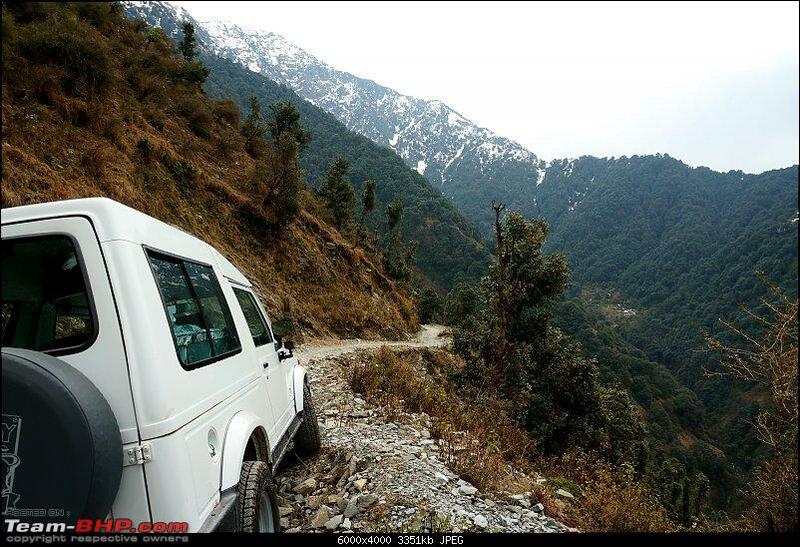 Wonderful travelogue, thanks for sharing! Wonderful travelogue. 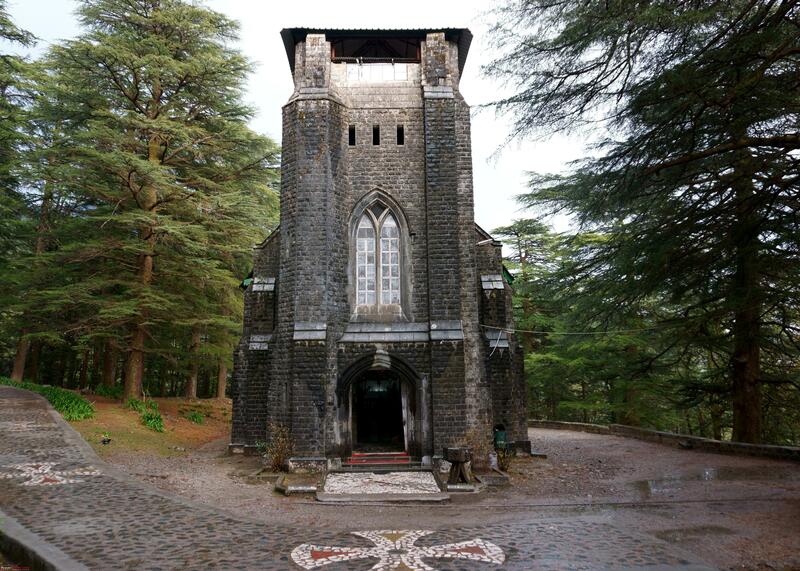 It is always refreshing to read about off beat places which have still retained their serenity. Thanks for taking us on a tour around them. 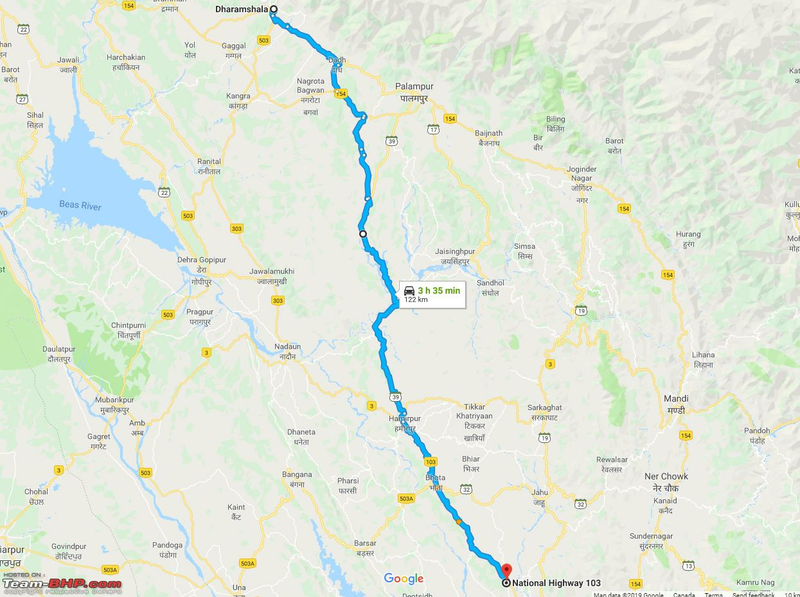 Himachal is definitely in my list for a road trip, however I'm sceptical as to how a low slung sedan (I drive a Ciaz) will handle the rough roads. The Gypsy on the other hand is a perfect companion for these conditions (if one can live with the lack of comfort or agreeable ergonomics). As a 'man of mountains', I can see why you got the Gypsy. You will have no problem in accessing 99% of places in your Ciaz. Majority of the roads are in a reasonable condition so you will not have any issue. You will find a lot of similar vehicles all over the state so no need to worry. Drive safe & good luck with your trip whenever that happens! 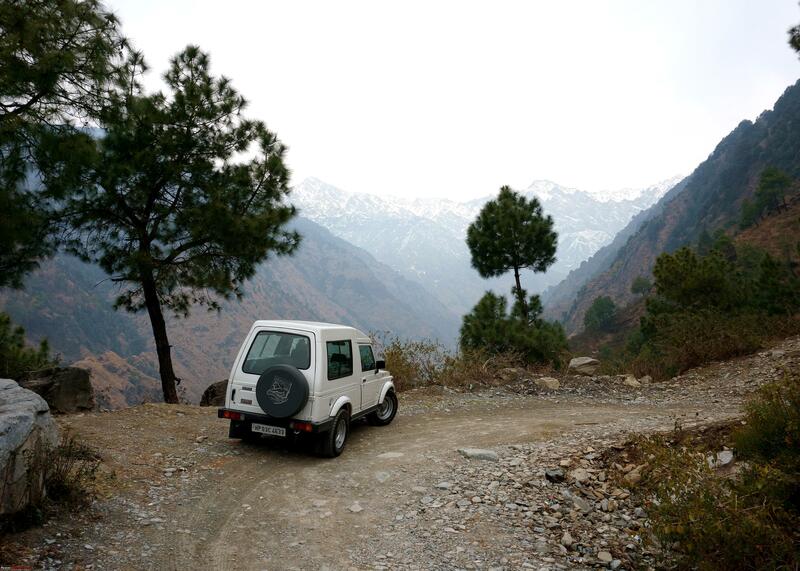 Beautiful travelogue. Great pics and narration. 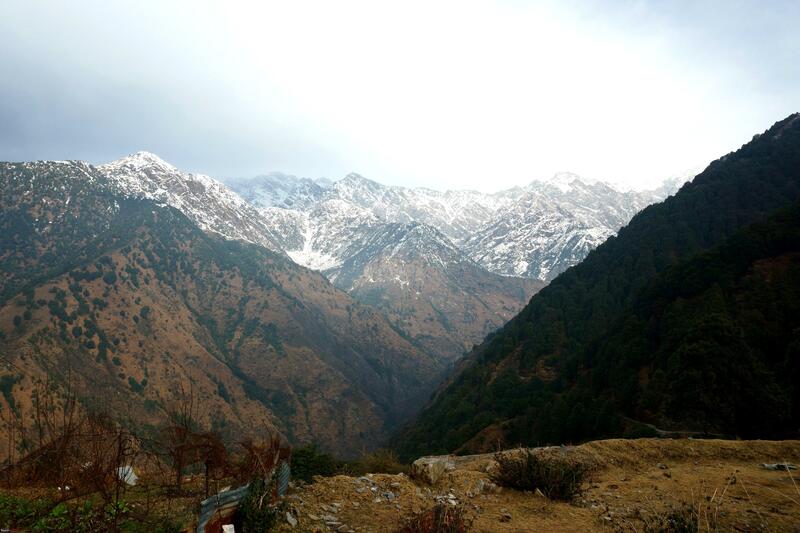 Being a mountain man myself, born and brought up in the places in your travelogue, it felt very nostalgic. Ah that mountain air. I so miss it. Not long before I am back there for good, that's for sure. Thank you so much for this travelogue. You won't believe how happy this made me. As a long time lover of the Gypsy and as someone who is increasingly having a sense of admiration towards the Himalayas, this was a wonderful read. Great pictures as well! I'm so glad to see you using the Gypsy the way she is supposed to be used. Honestly, I had my brief emotional moment when I heard that they were finally stopping the Gypsy production. That is the car that I wanted to own most, a new one at that. And so, that was a dream that was slowly fading away in front of my eyes. There have been quite a few number of people who have bought the Gypsy in the last few years, and I hope these wonderful people like you keep the community alive to tell the story about this legend. Take care. I'll wait for your next travelogue. Last edited by cool_dube : 25th March 2019 at 19:22.